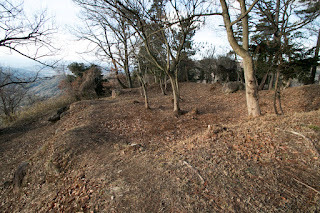 Katsuga castle (勝賀城) is built over Katsuga-yama mountain, one of about 350 meter height from hillside in the westward from current Takamatsu city central. Katsuga-yama mountain is a part of Goshikidai hills which separates Takamatsu area and Marugame area, but protrudes into plain and is a beautiful corn shaped mountain. 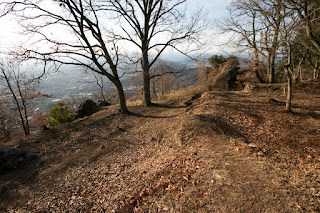 Castle area is an ideal place to build medieval castle and castle town, as being protected its backside by Goshikidai hills and front side by Kizu-gawa river which curvedly flows around the mountain and had river port at the mouth. 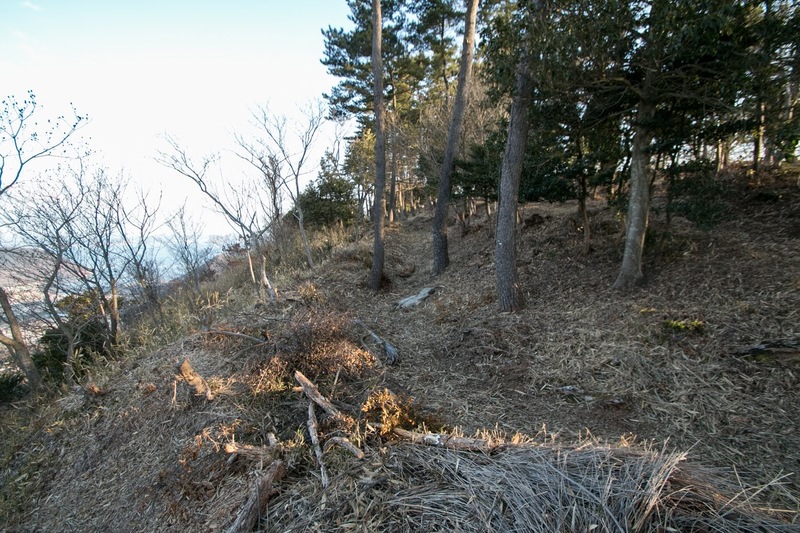 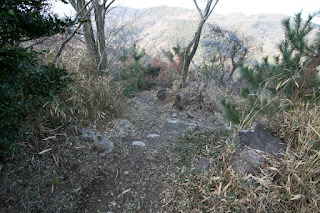 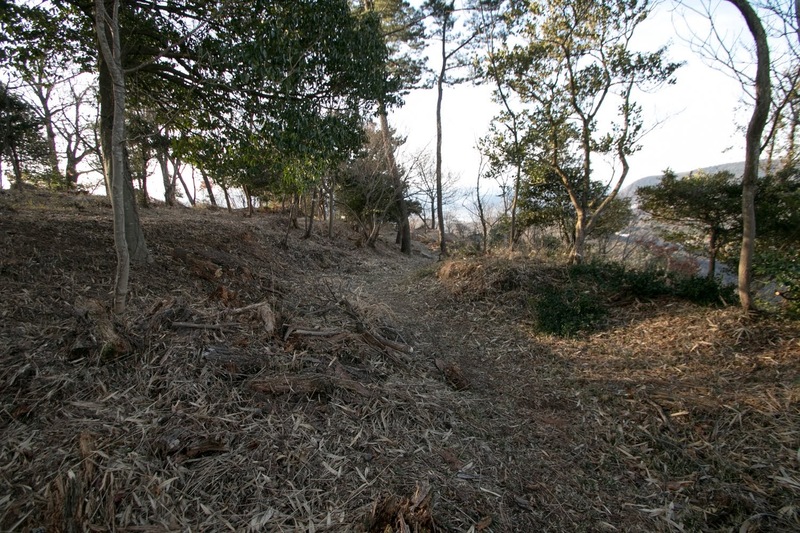 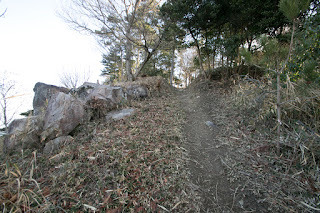 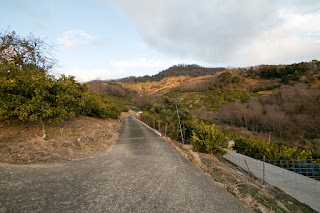 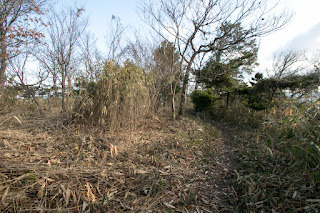 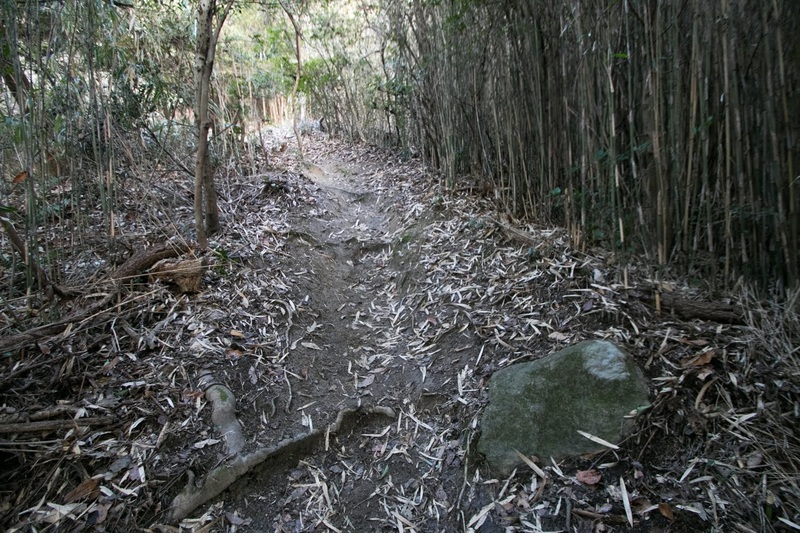 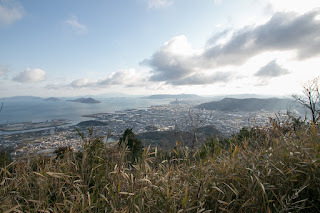 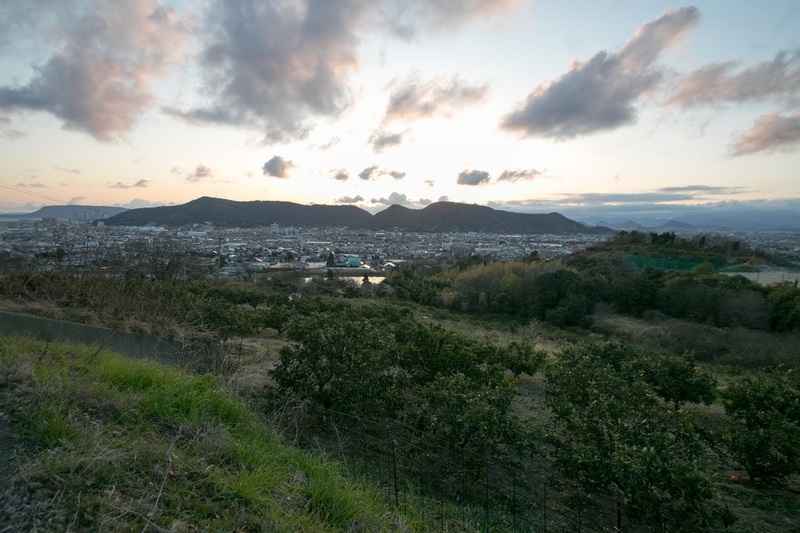 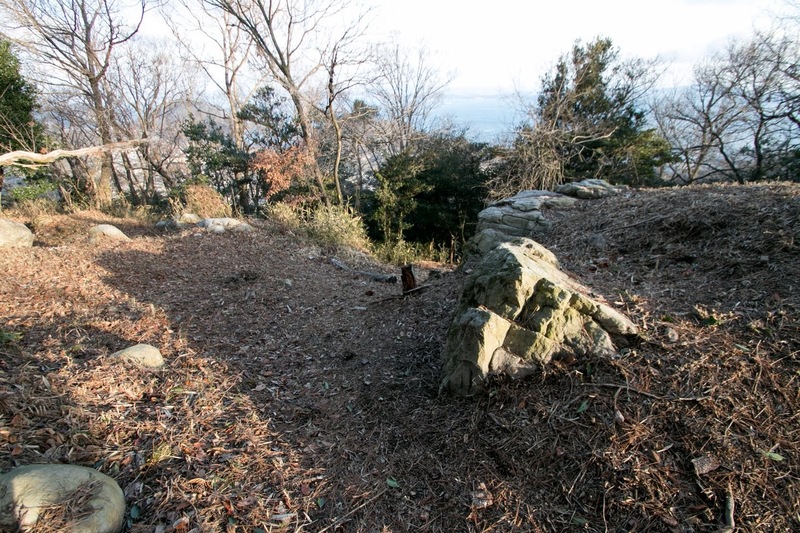 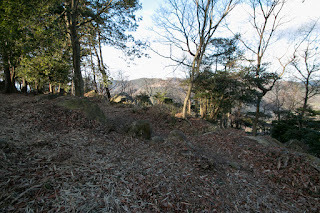 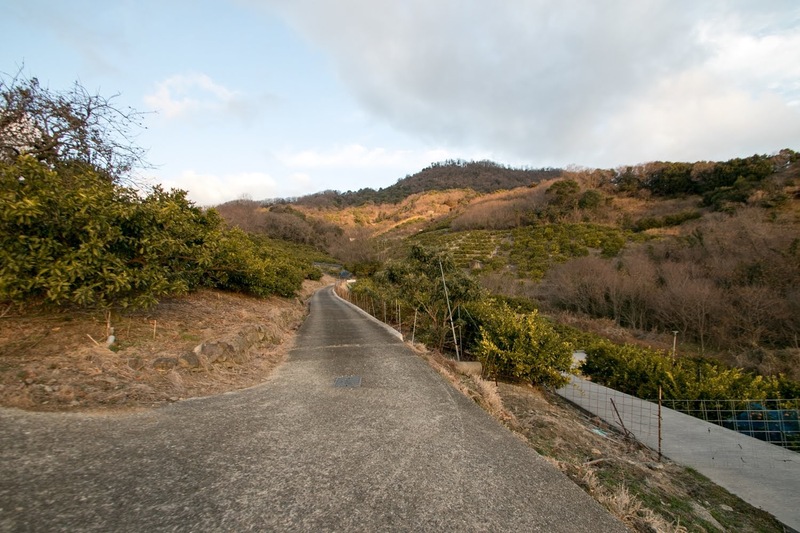 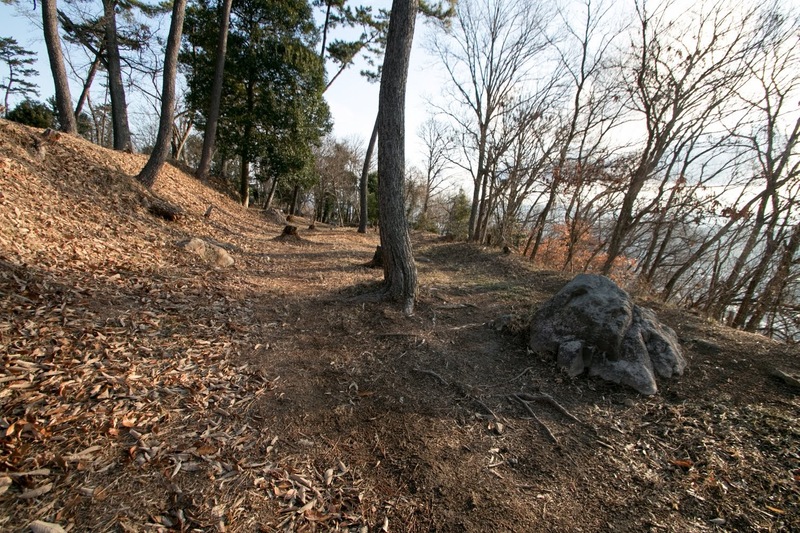 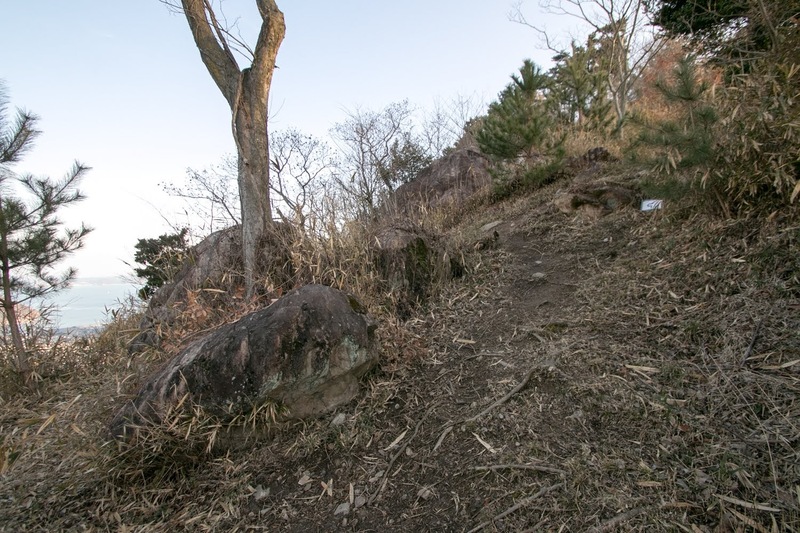 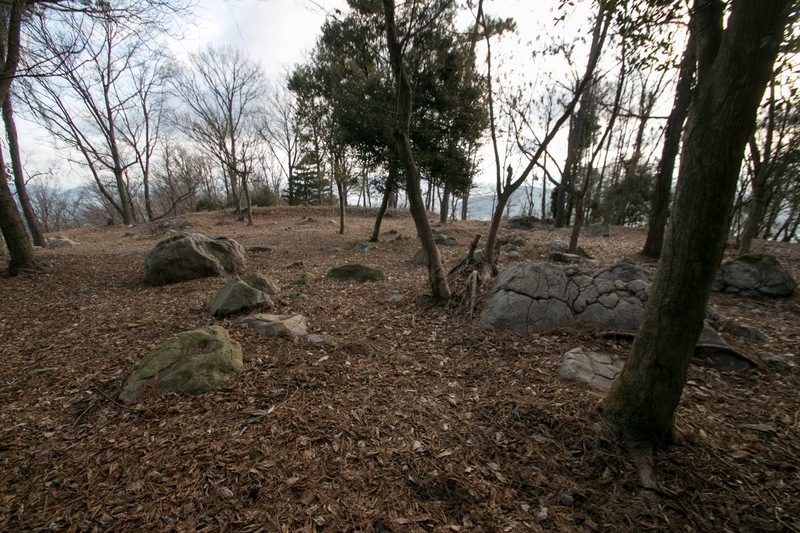 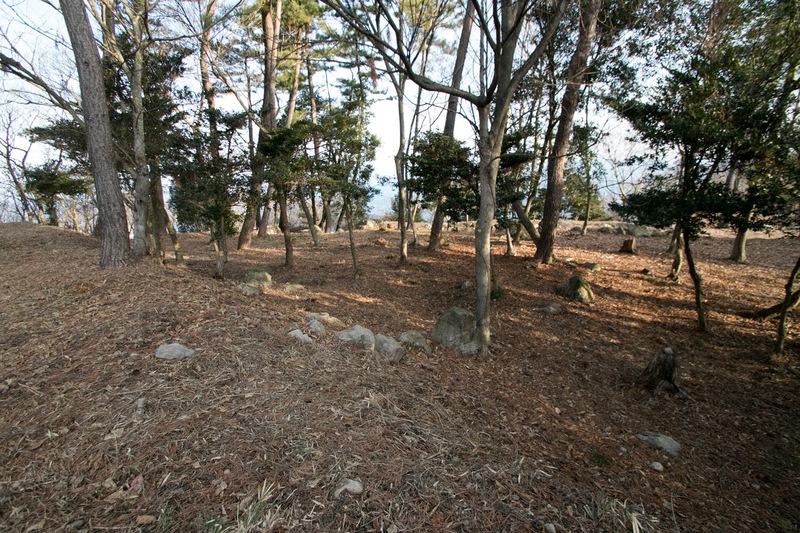 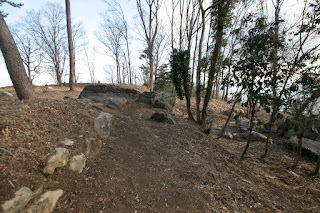 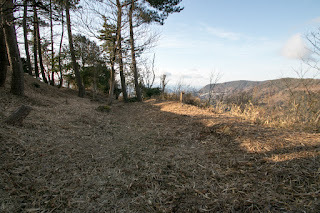 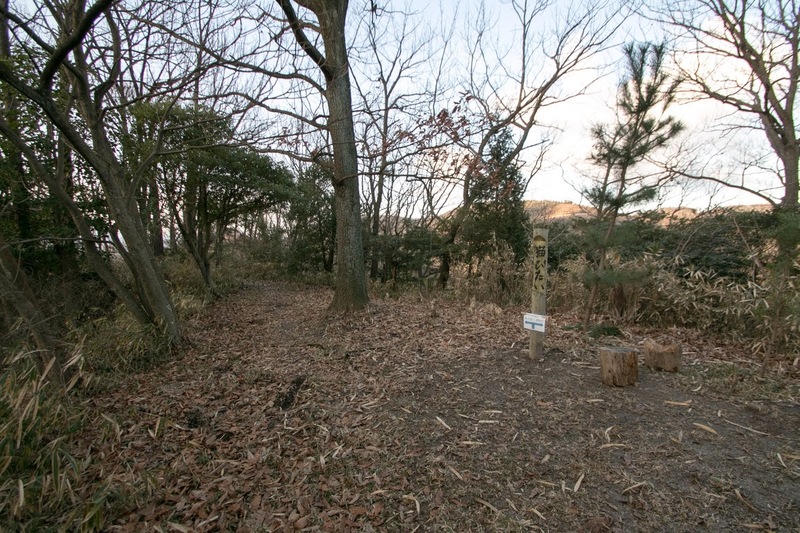 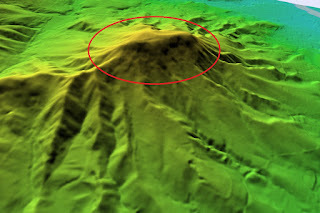 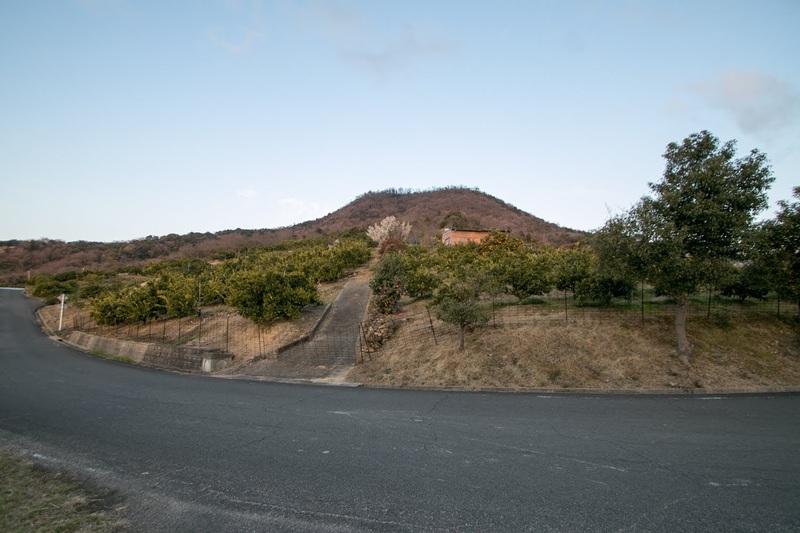 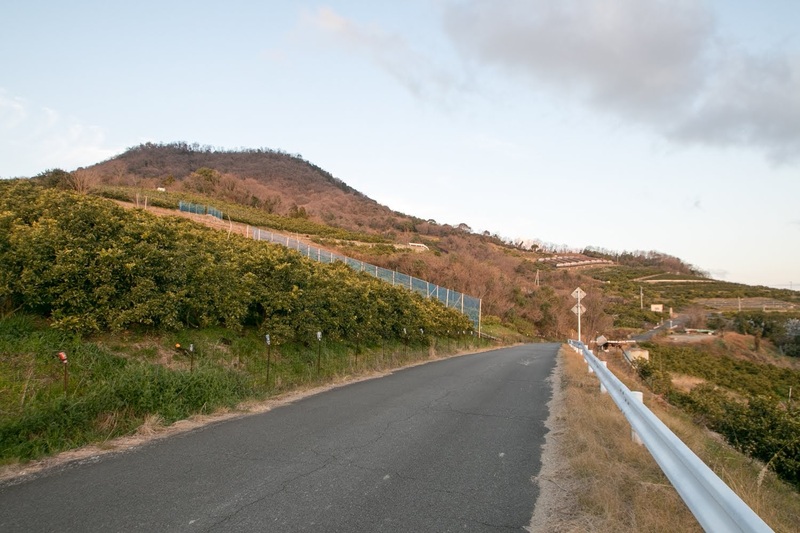 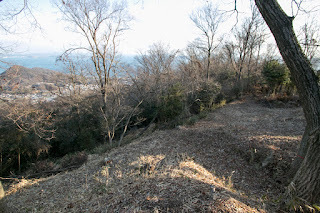 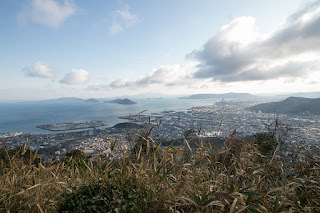 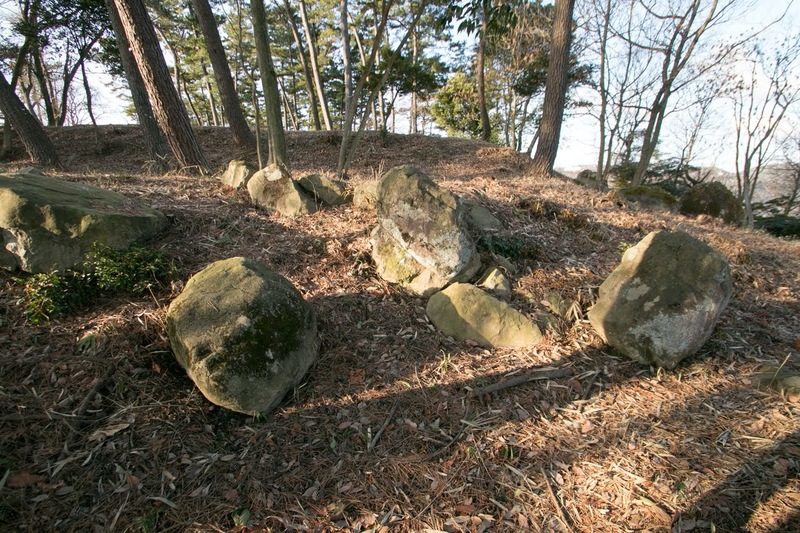 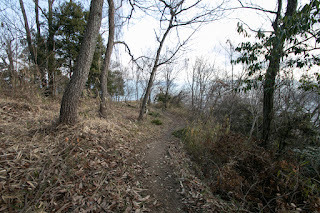 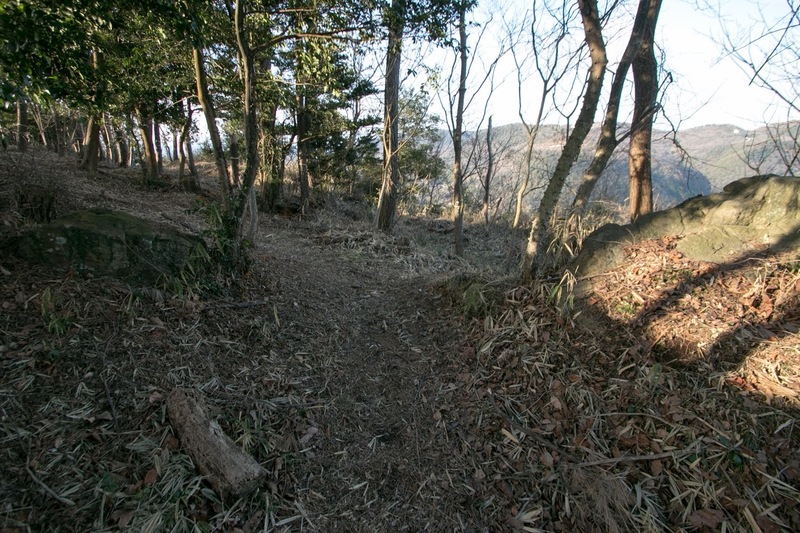 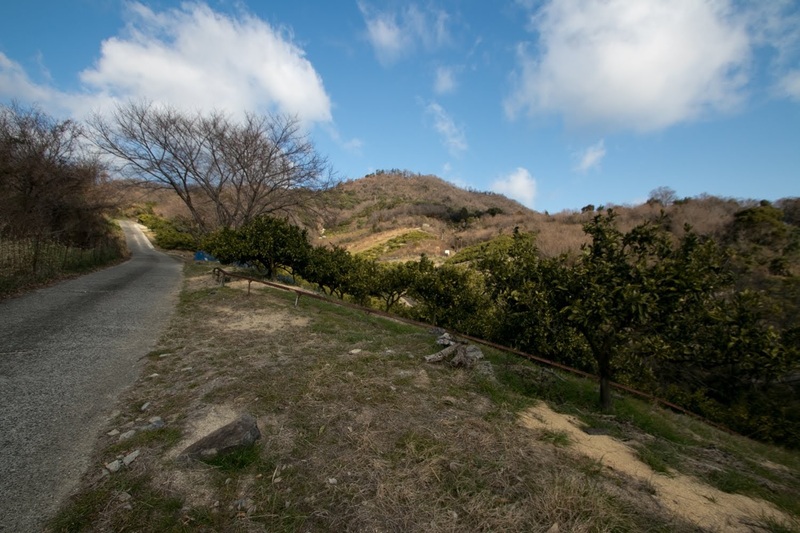 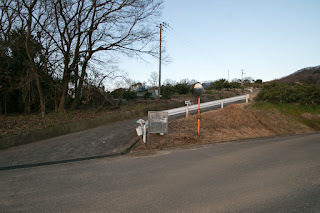 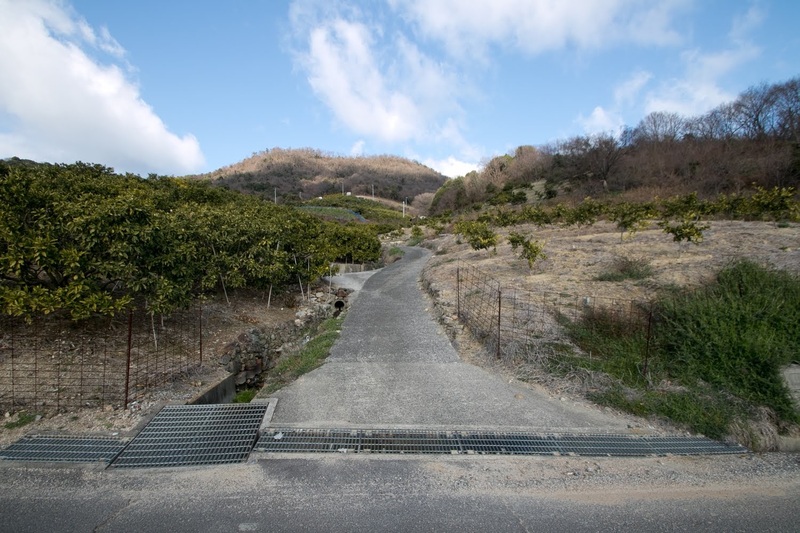 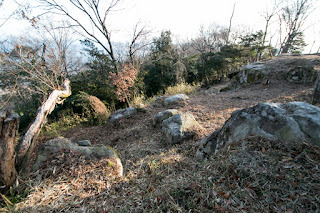 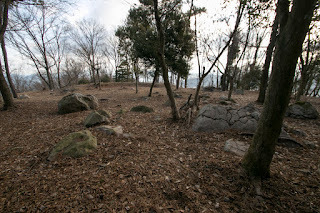 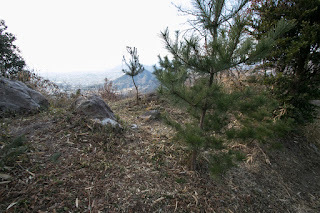 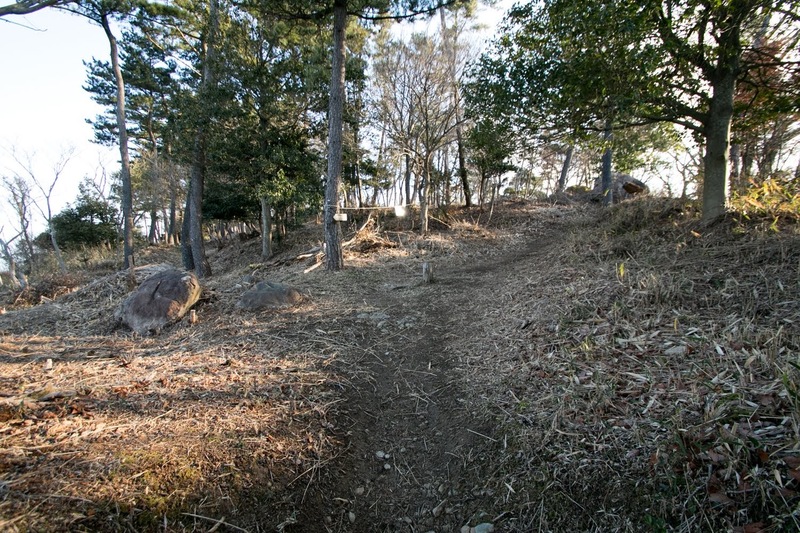 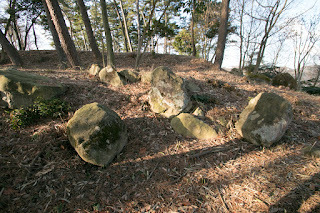 The south edge of Goshikidai hills is an important point to connect Takamatsu area and Marugame area, and had been the center of Sanuki province (Takamatsu prefecture) from ancient era. 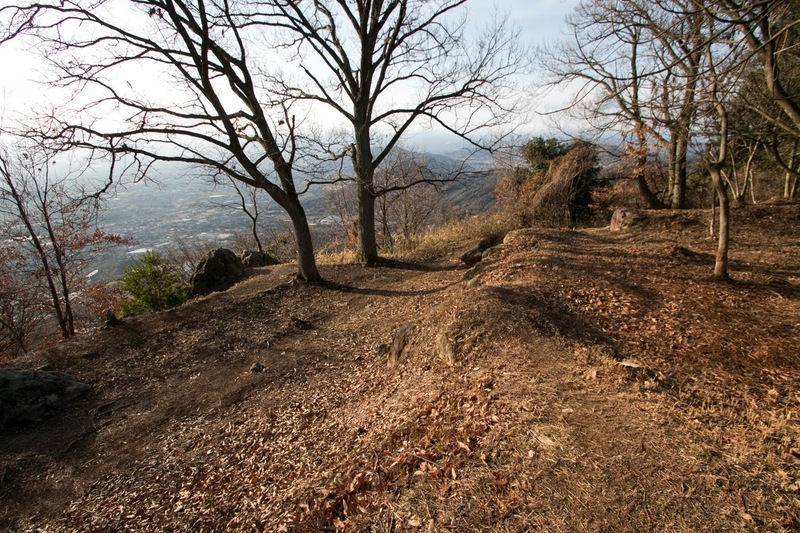 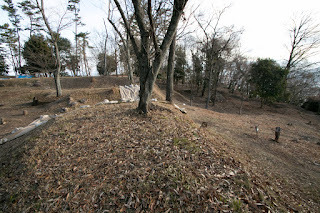 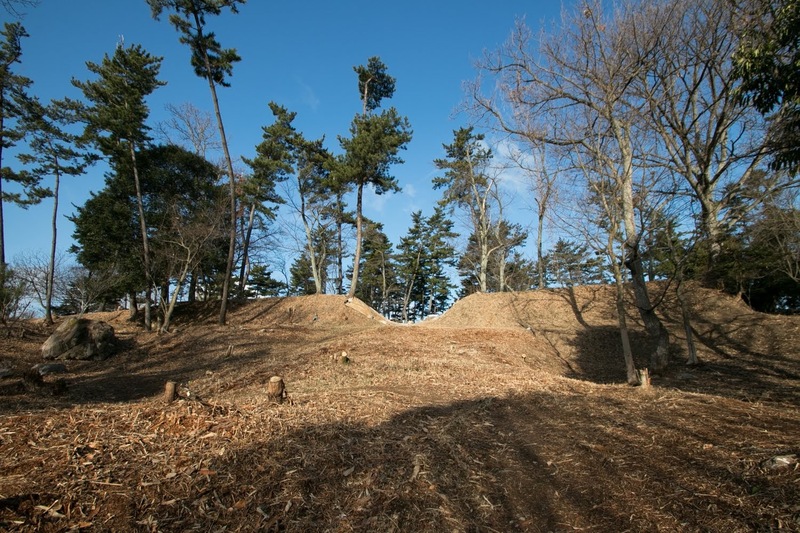 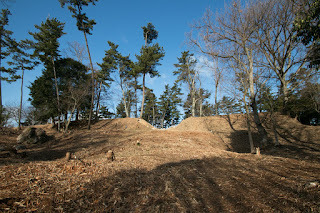 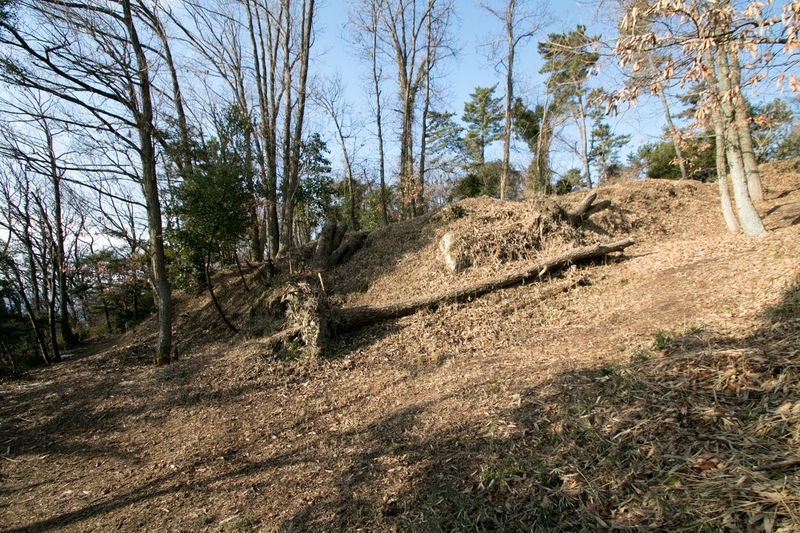 Precise year is unknown but Katsuga castle might be built in 14th century by local lord Kozai clan. 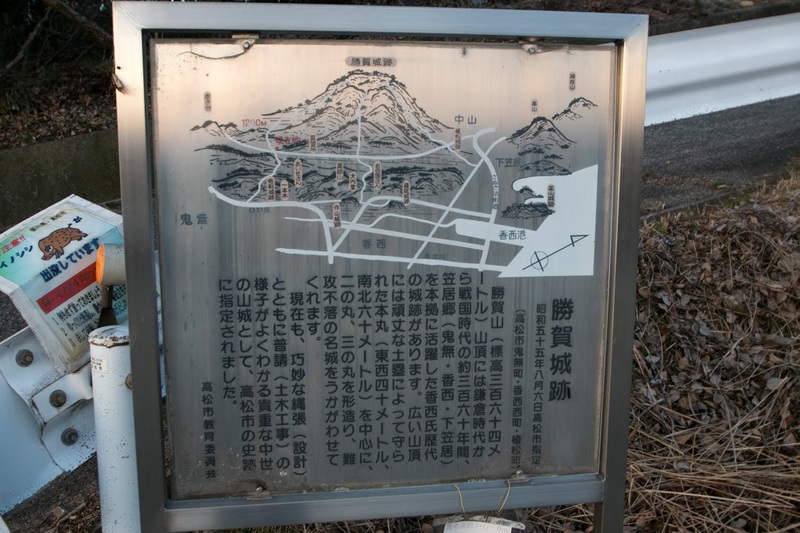 Kozai clan is said as a descendant of Fujiwara clan, a central noble which managed Sanuki province as the governor. 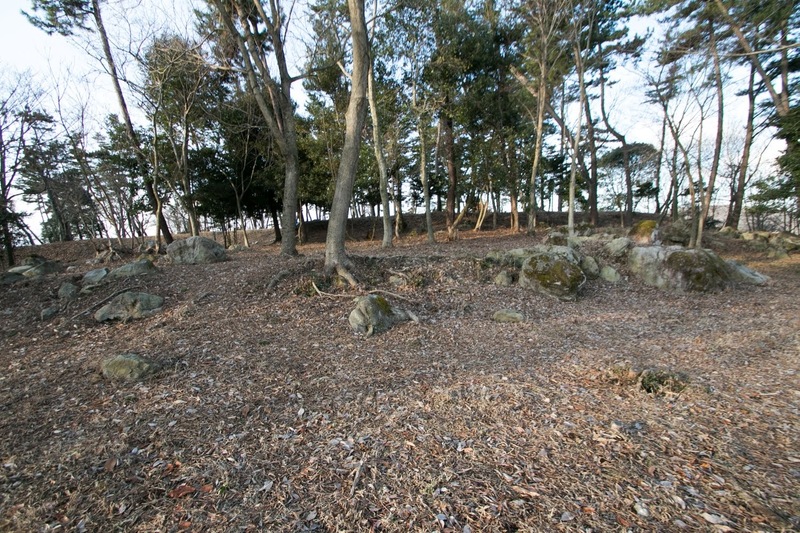 Probably relative of Fujiwara clan resided near the provincial office then turned into local lord such as Kozai clan or Hayuka clan. 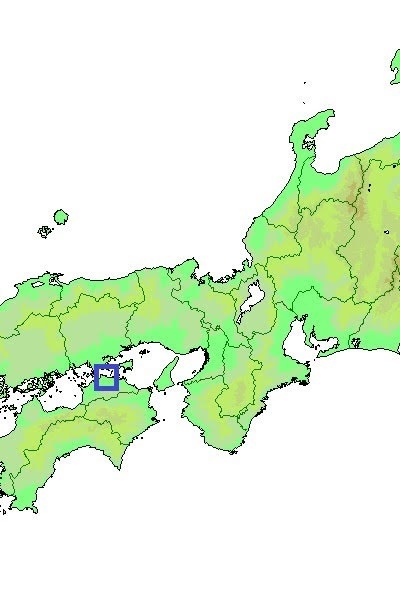 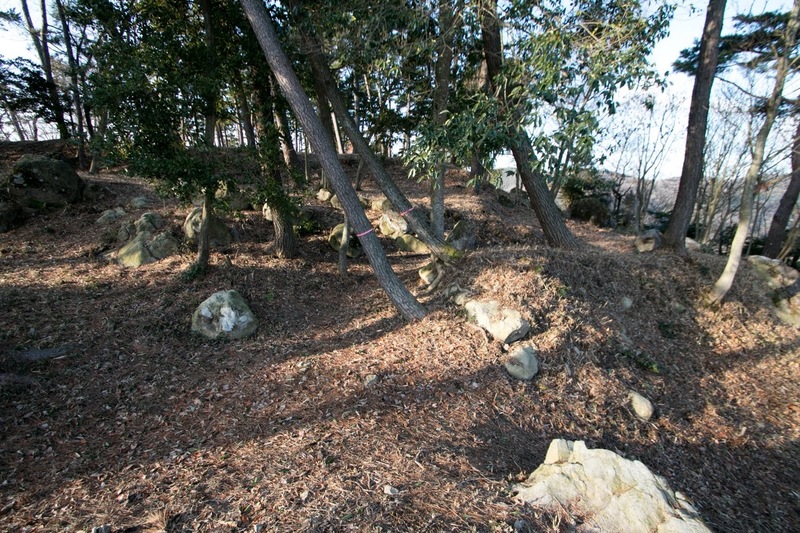 At the conflict between Taira clan and Minamoto clan in the latter half of 12th century, Takamatsu area became the front of both power as Taira clan had their naval base at Yashima plateau in the east part of Takamatsu city, Kozai clan belonged to Minamoto clan and activated at the battle of Yashima. 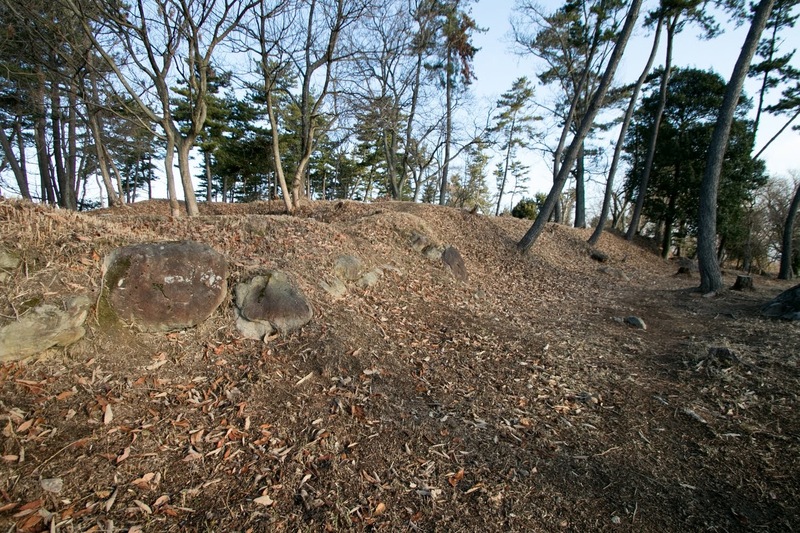 At the fall of Kamakura Shogunate in 1333, Kozai clan belonged to Takauji Ashikaga (1305-1358), the founder of Muromachi Shogunate, and survived as local lords. The Shogunate appointed their relative and important retainer Hosokawa clan as the governor of Sanuki province. Under Hosokawa clan, Kozai clan was treated as one of their big four retainers, along with Yasutomi clan of Ametaki castle, Nara clan at Shotsuji castle and Kagawa clan of Amagiri castle. 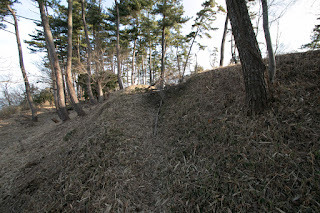 At the battle of Onin occurred at Kyoto city from 1467 to 1477, Kozai clan activated under Katsumoto Hosokawa (1430-1473), the leader of the East army. 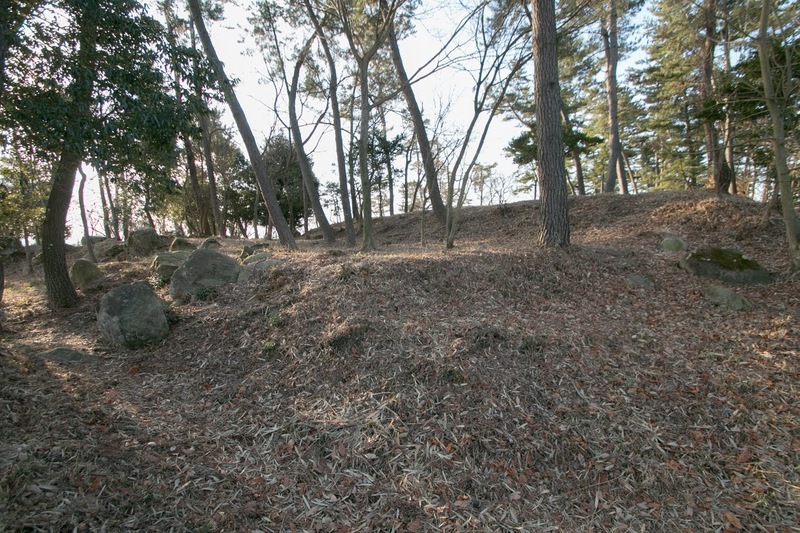 In 1493, Masamoto Hosokawa (1466-1507), son of Katsumoto Hosokawa, acted a coup d’?tat then replaced the Shogun and became the supreme authority of Shogunate. The main stream of Kozai clan followed Masamoto as important retainer, and served high position or governor. 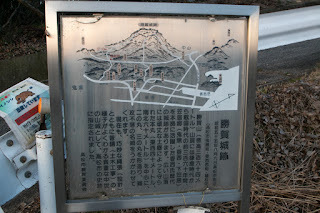 On the other hand, Kozai clan remained their branch family at Kozai area to keep their territory. In addition to the connection to Hosokawa clan, in alliance with Shiwaku navy which spread at the offshore of Kozai territory, Kozai clan gained huge profit from marine transportation. Based on their wealth Kozai clan improved their main base Katsuga castle. 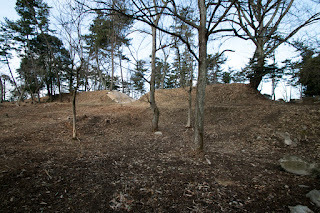 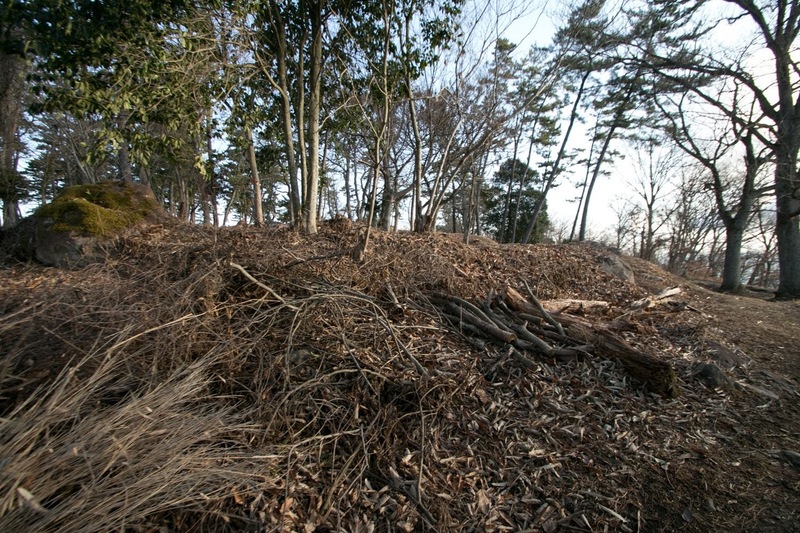 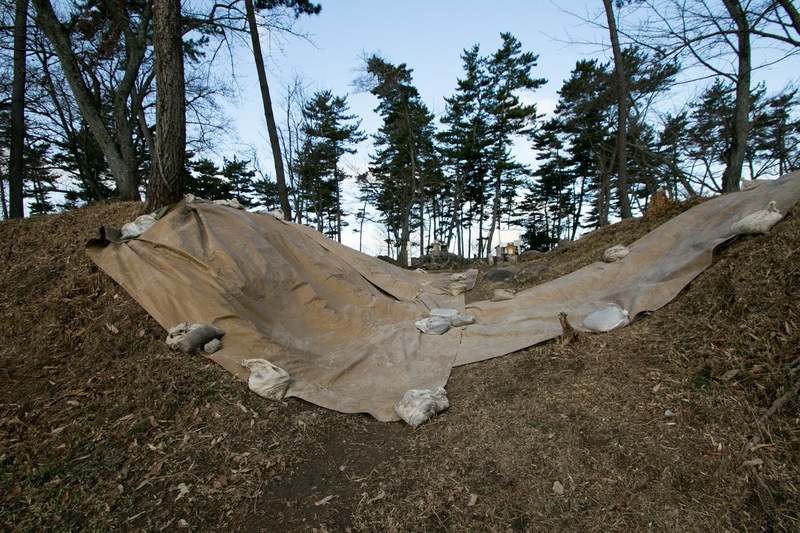 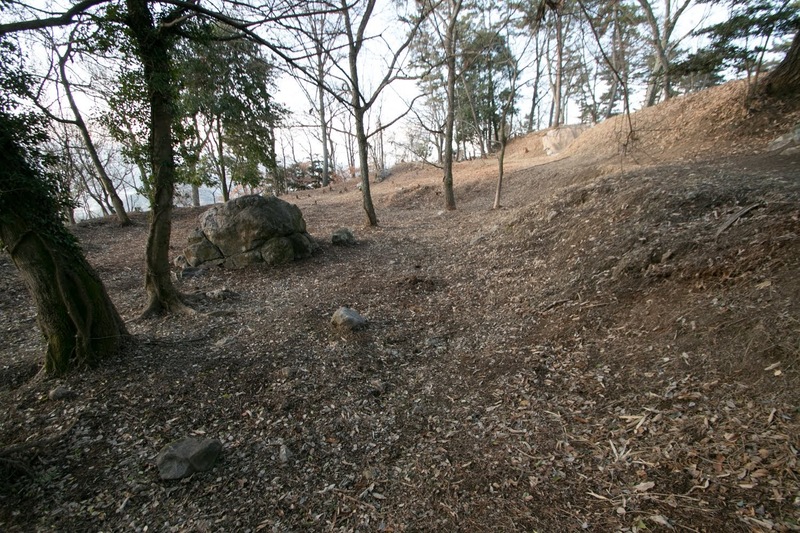 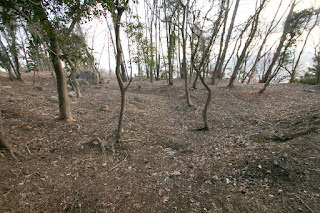 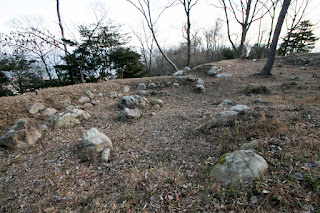 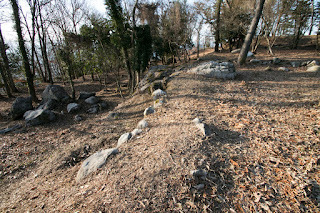 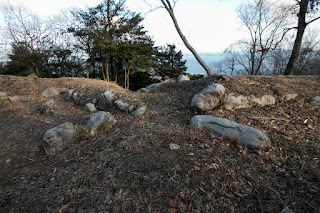 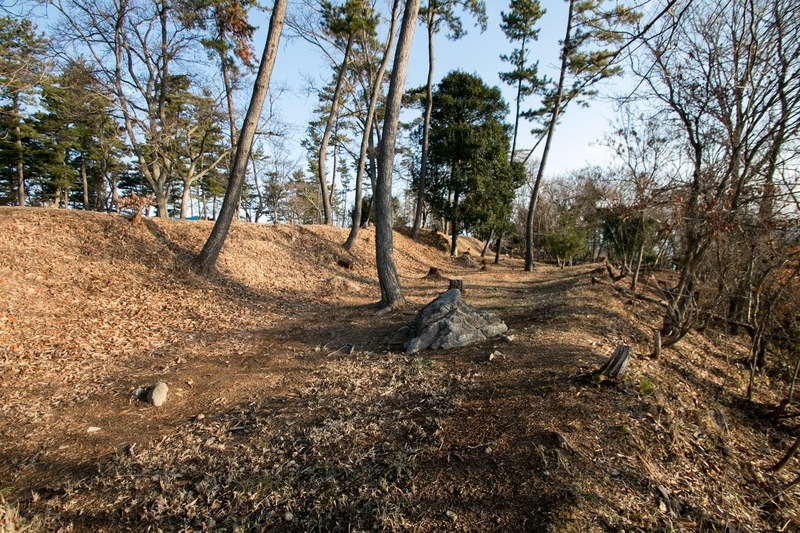 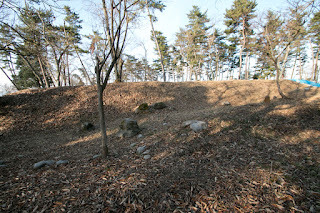 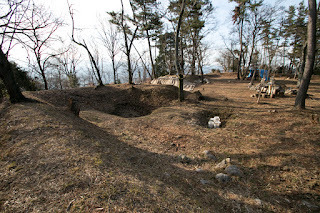 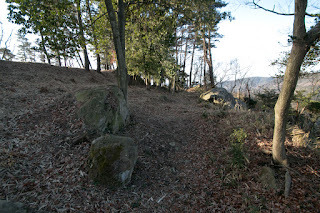 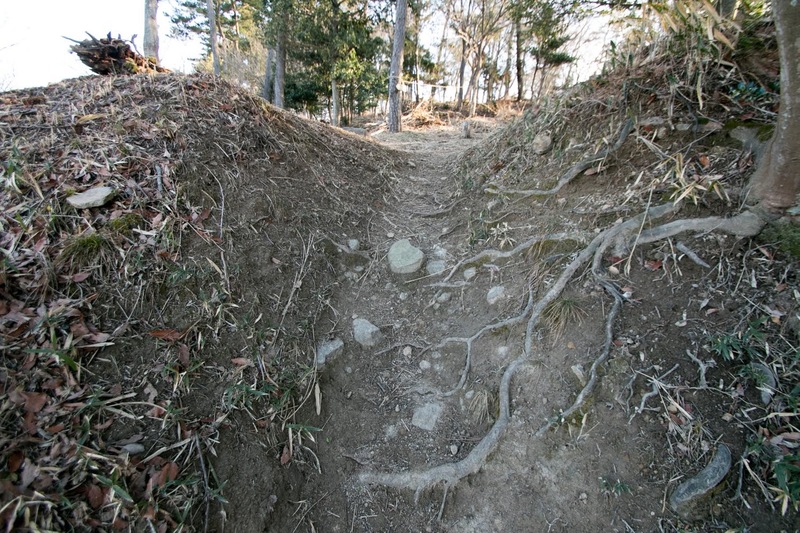 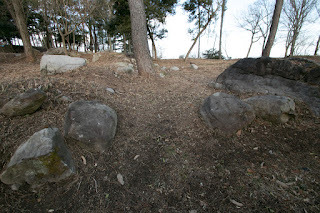 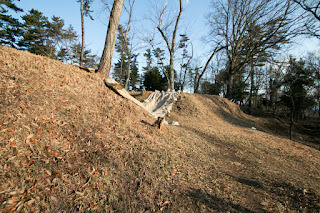 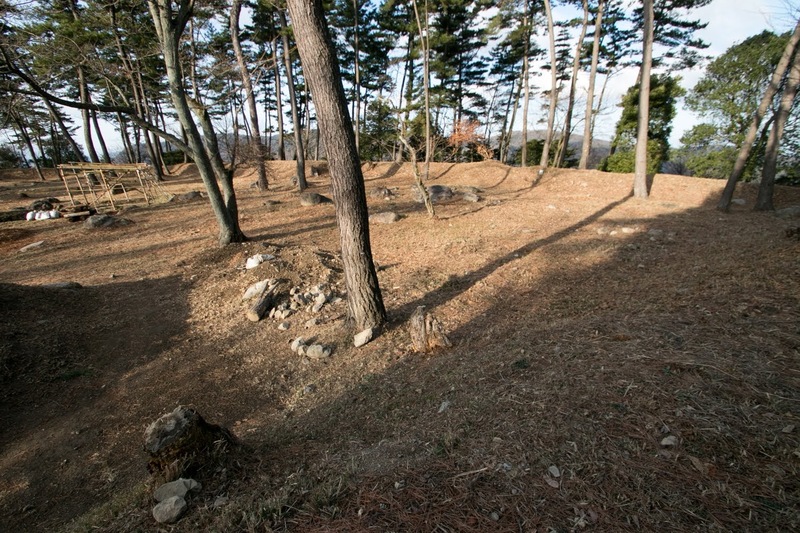 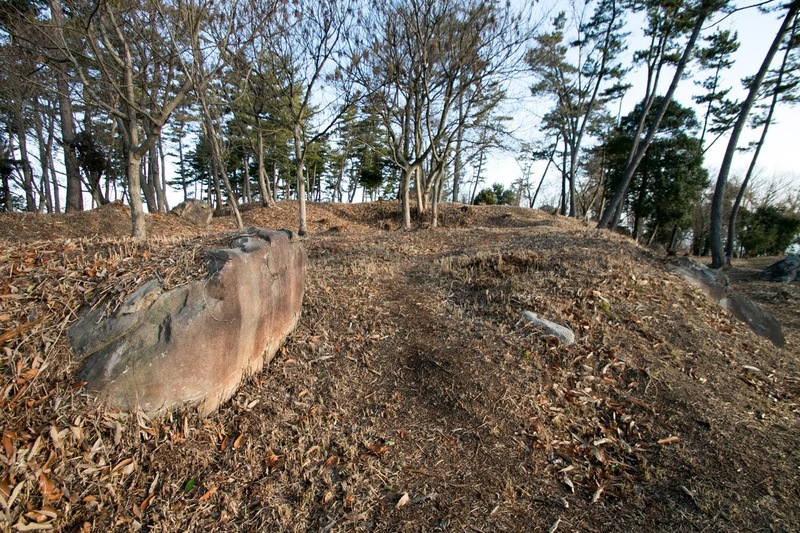 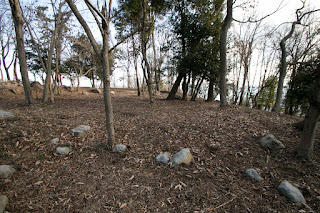 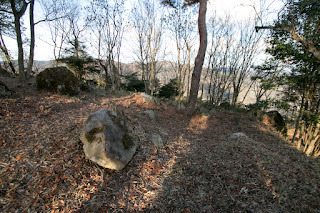 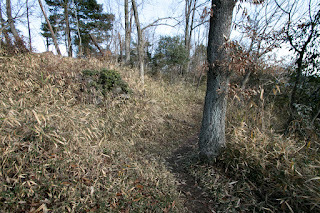 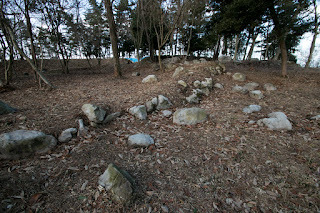 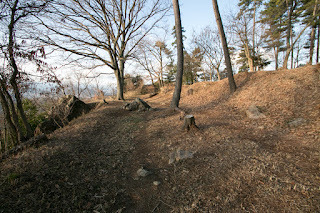 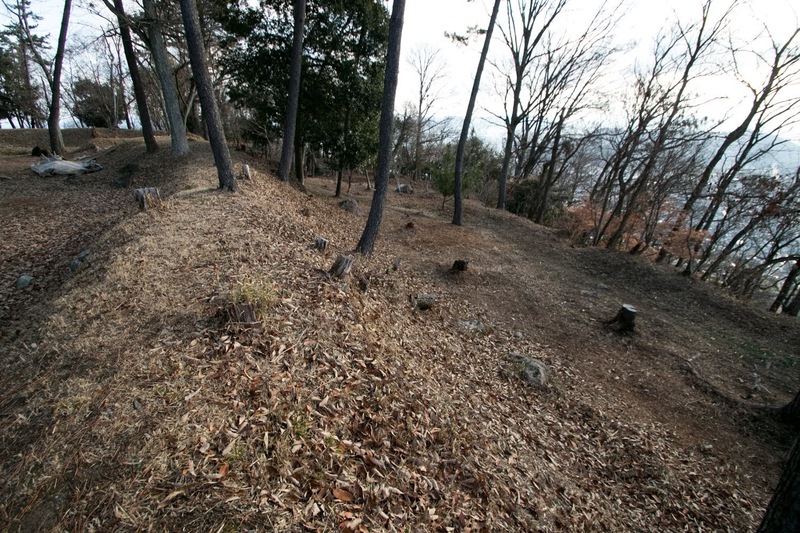 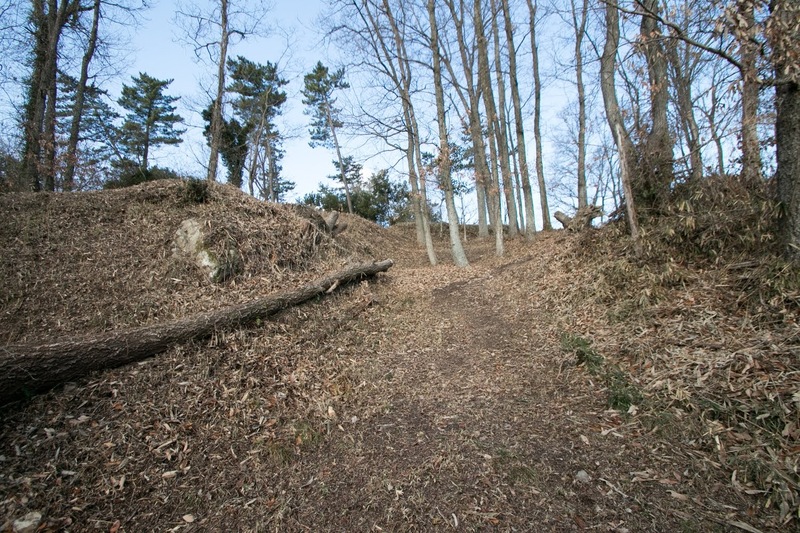 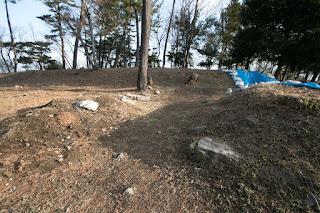 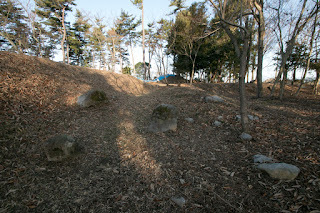 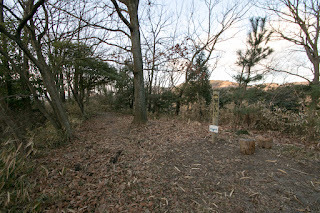 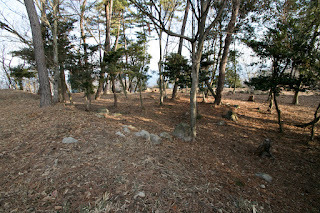 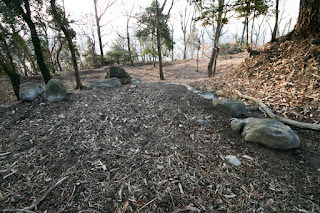 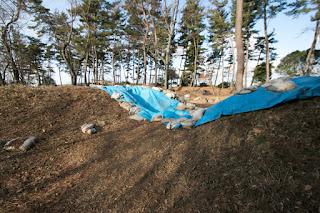 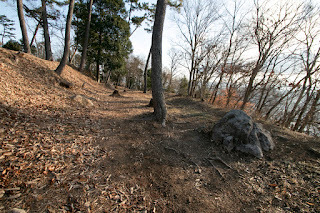 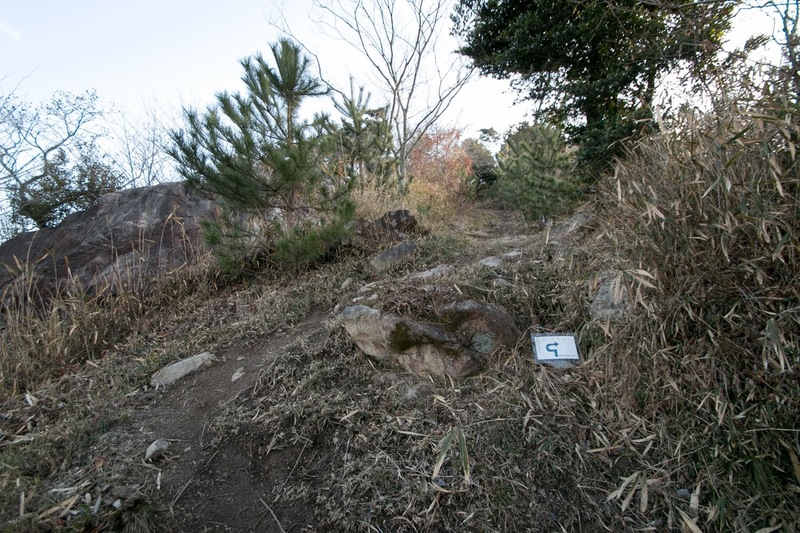 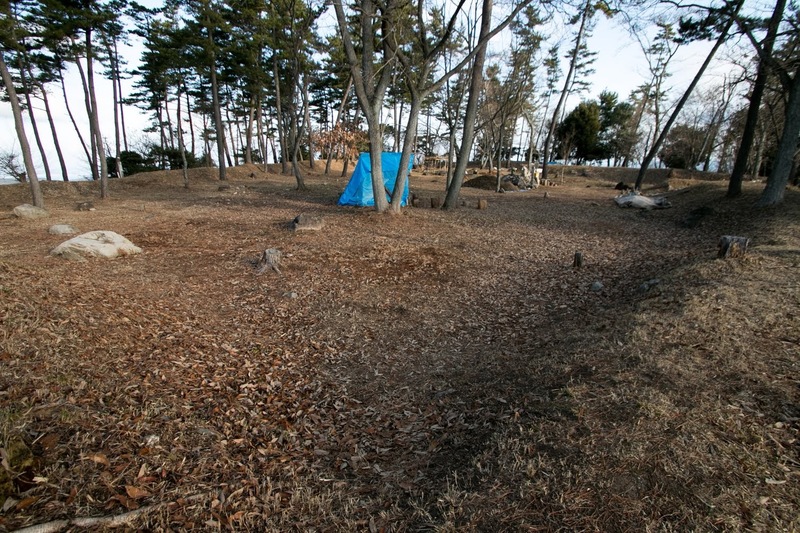 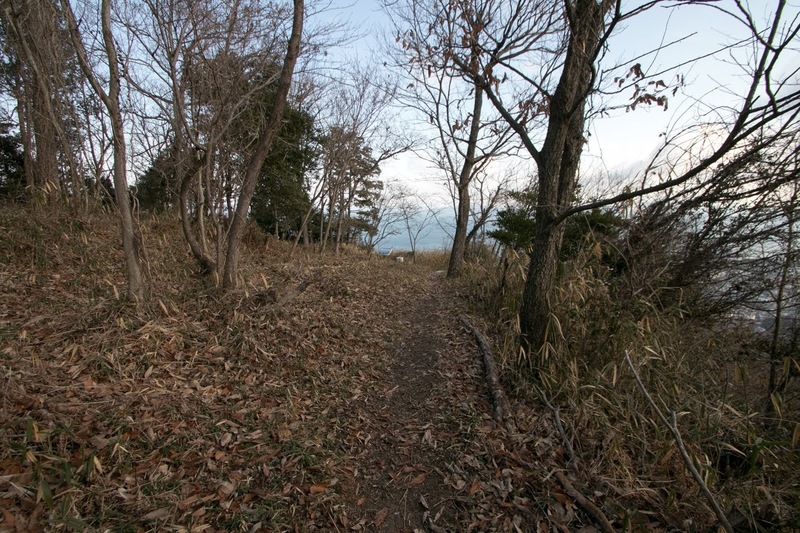 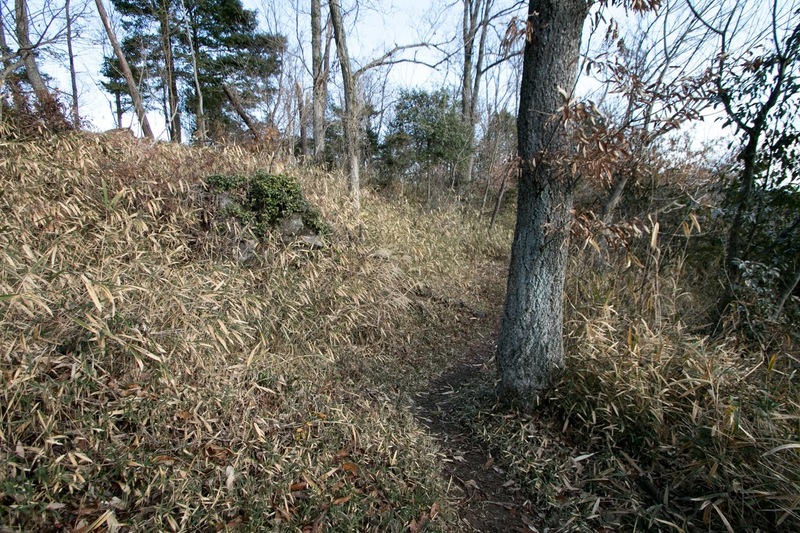 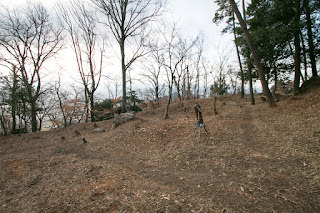 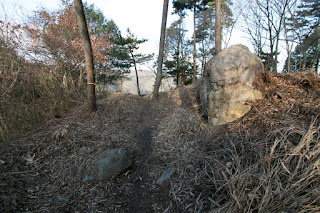 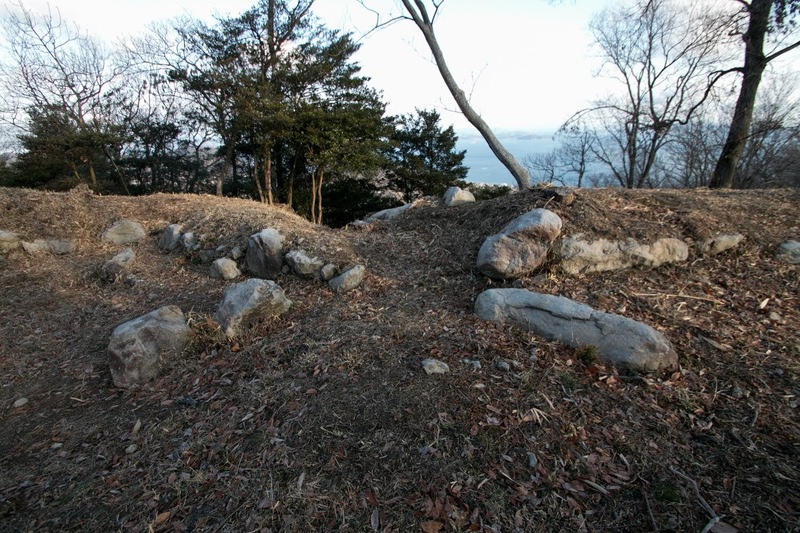 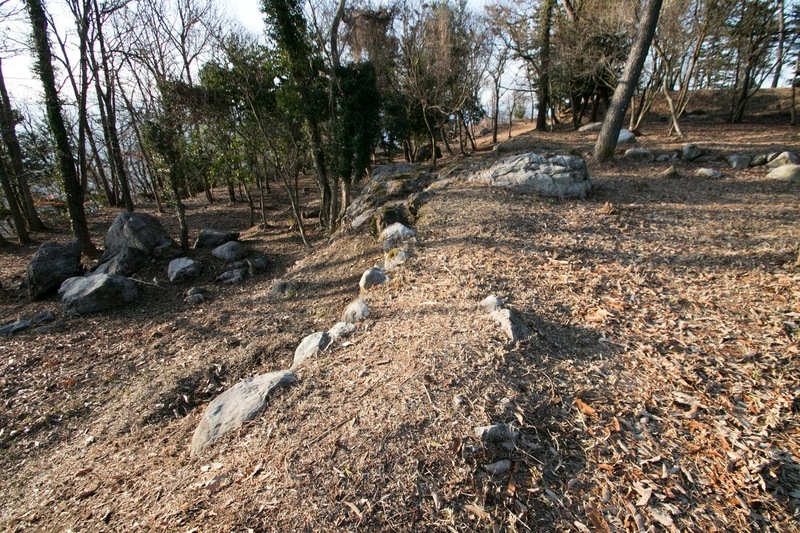 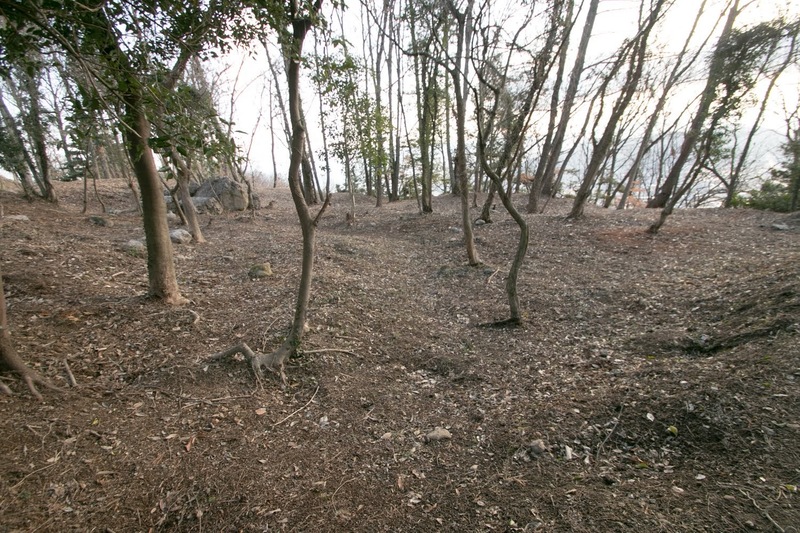 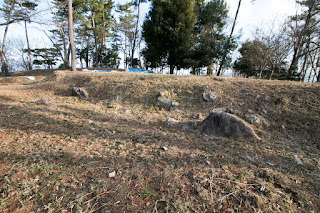 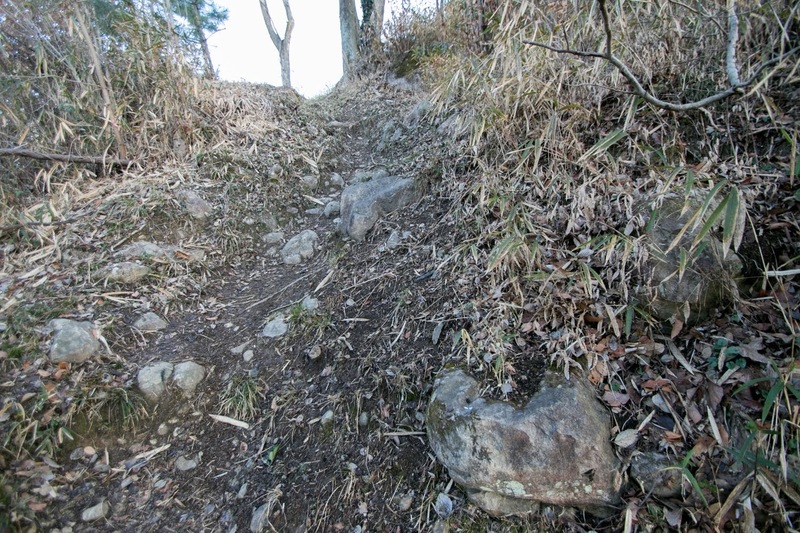 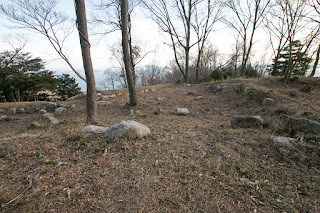 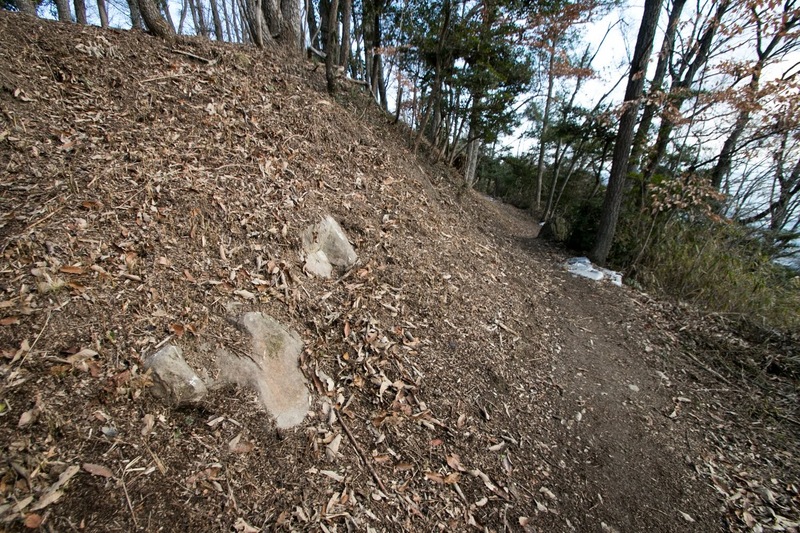 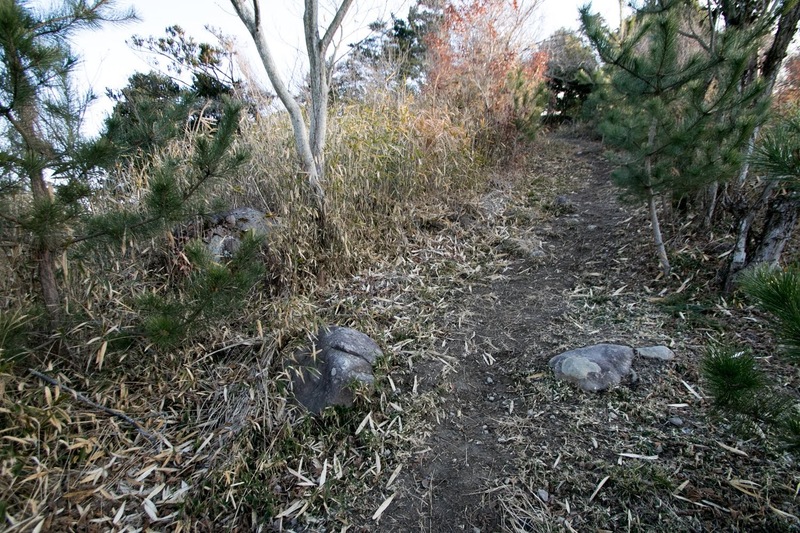 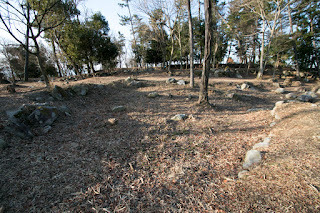 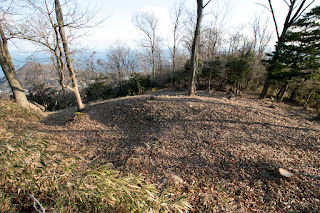 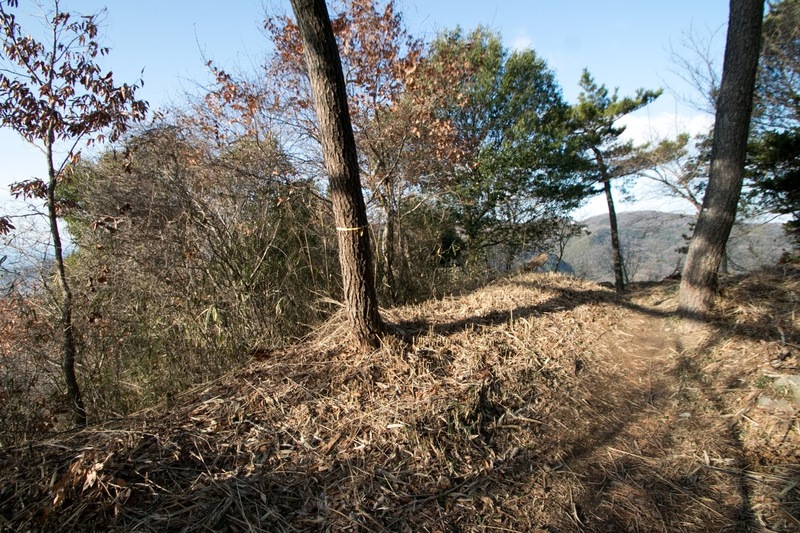 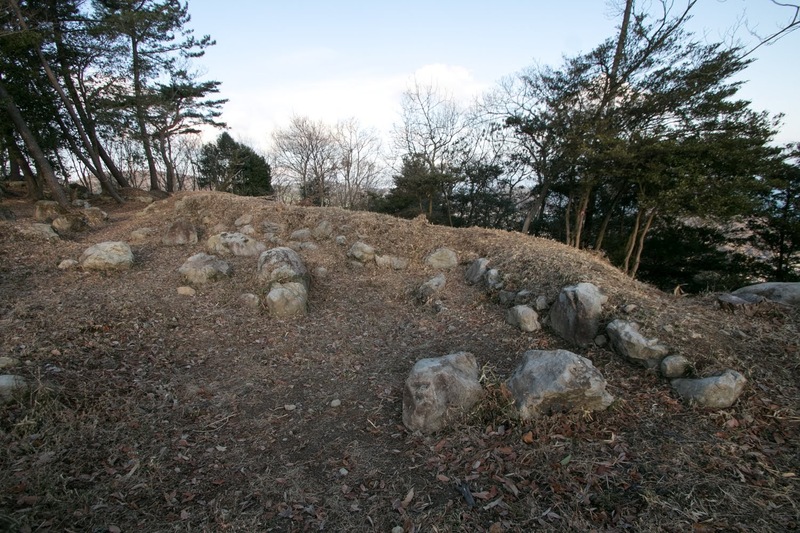 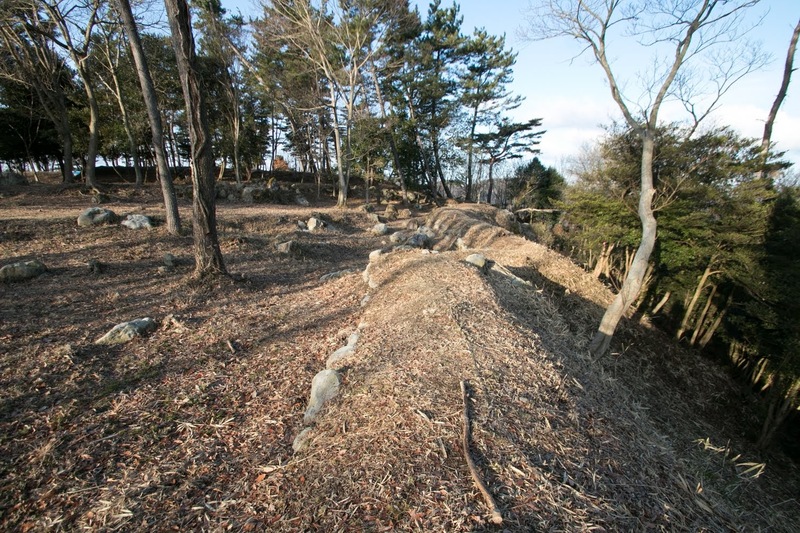 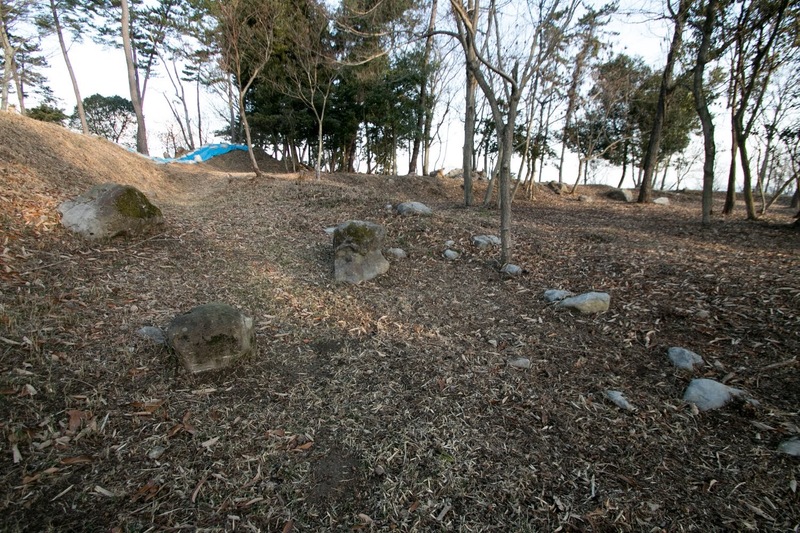 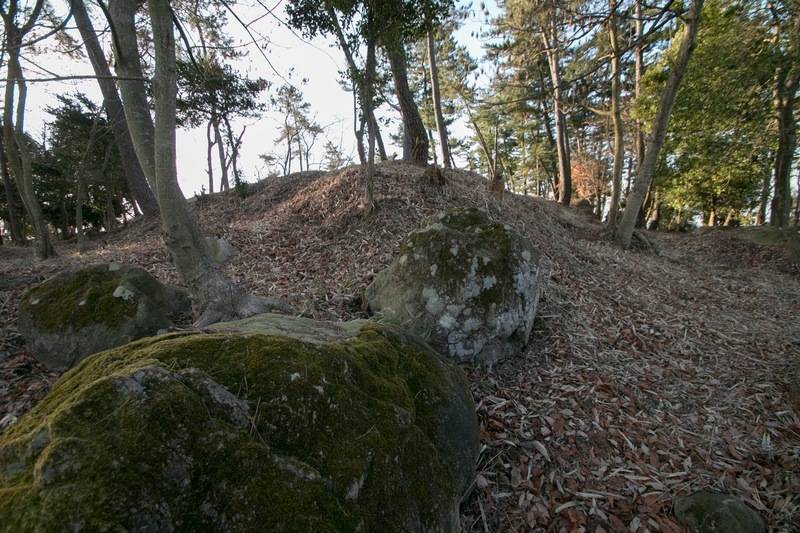 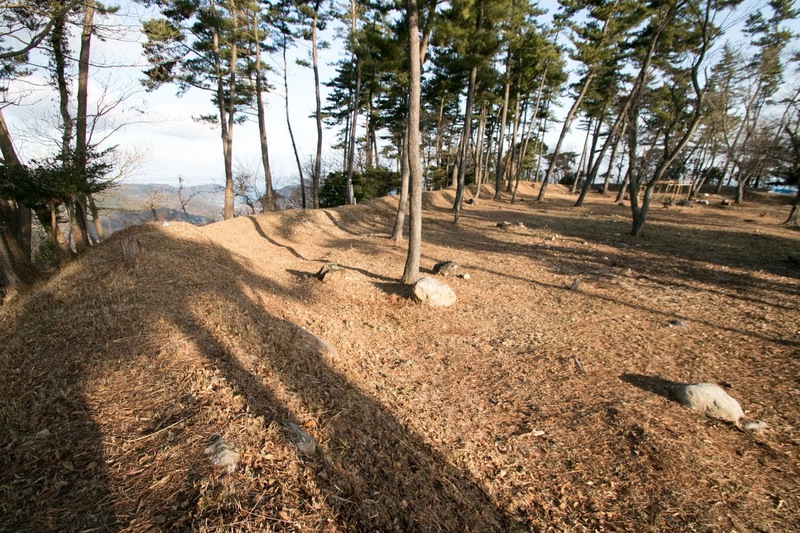 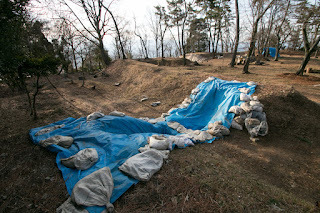 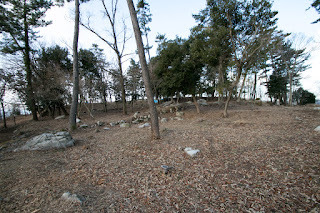 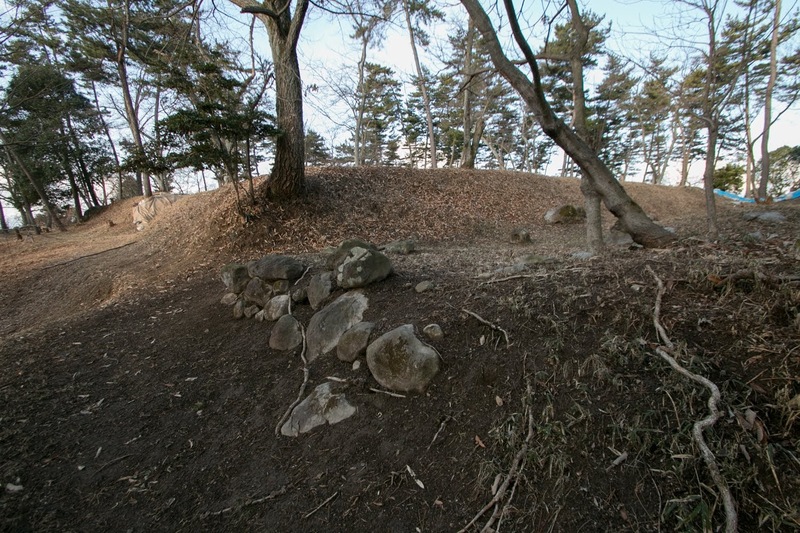 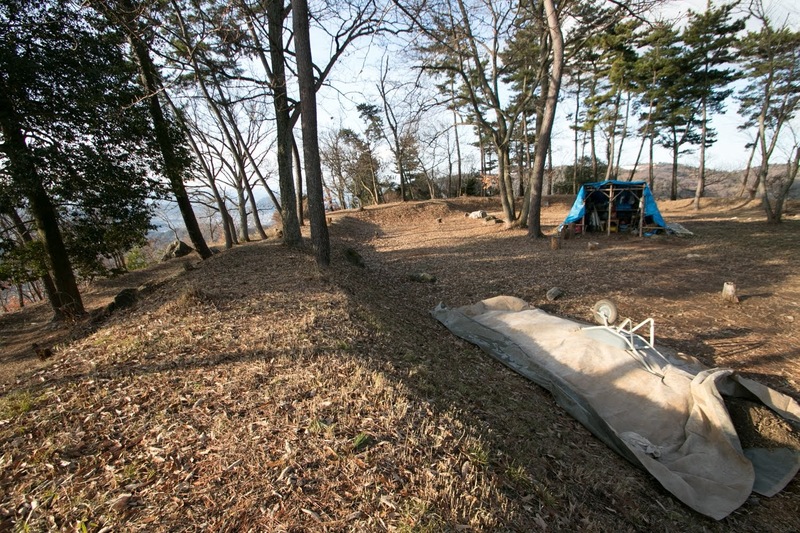 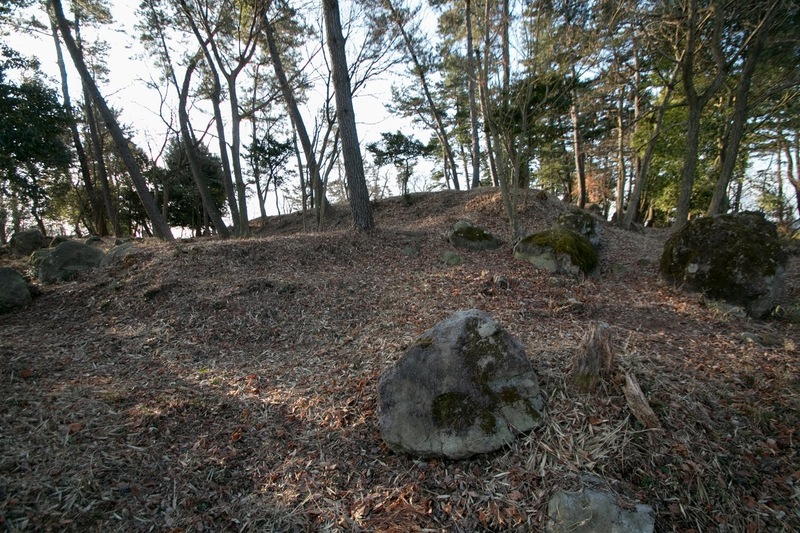 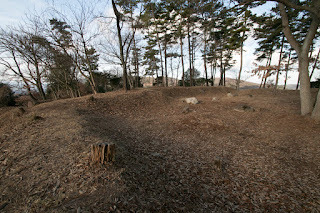 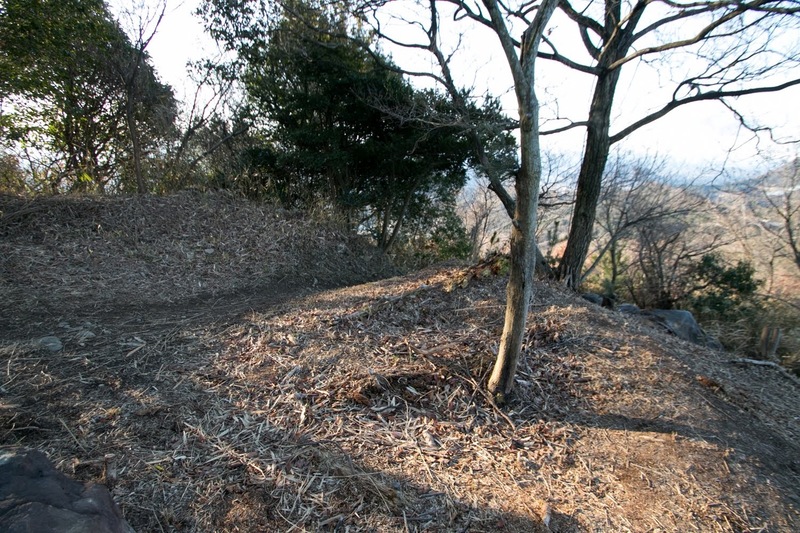 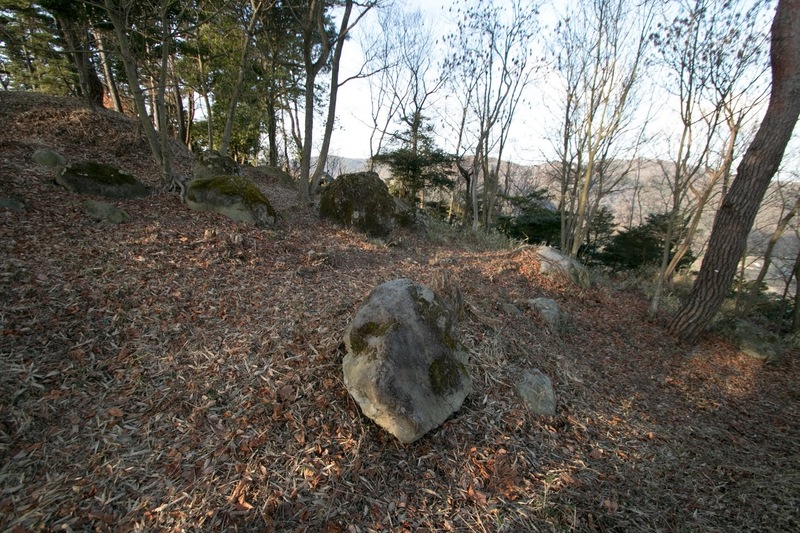 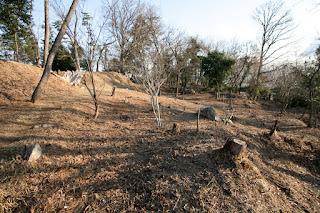 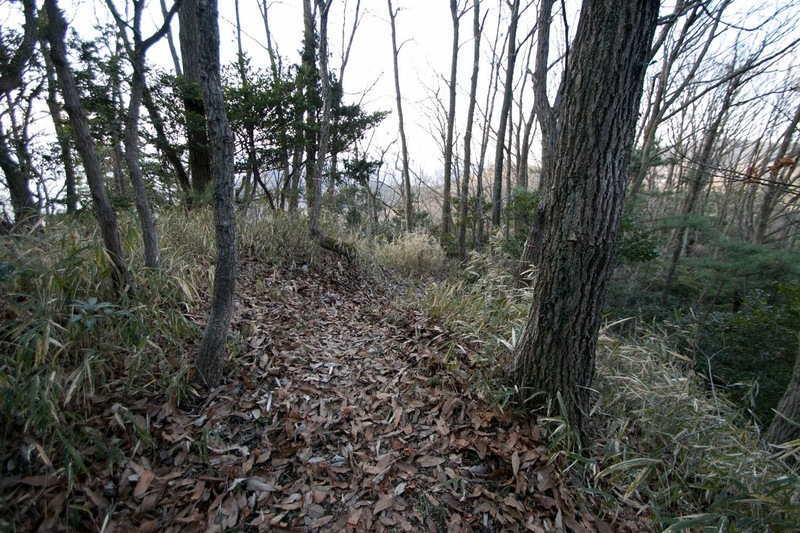 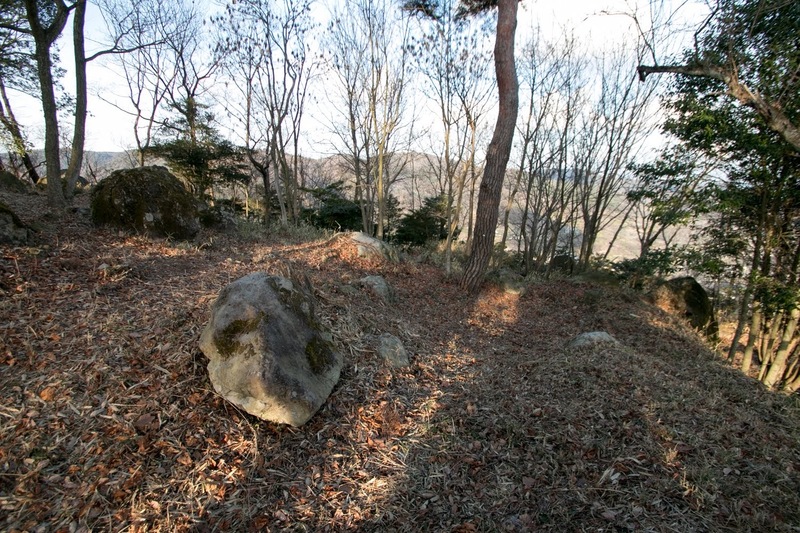 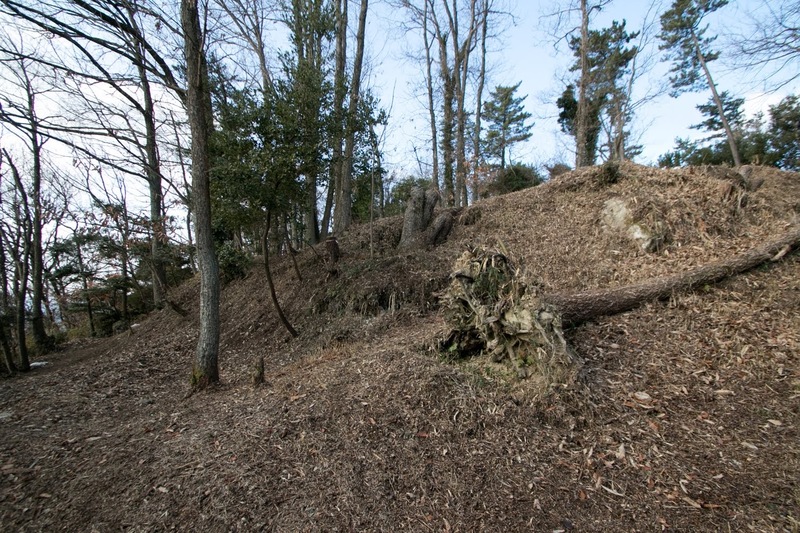 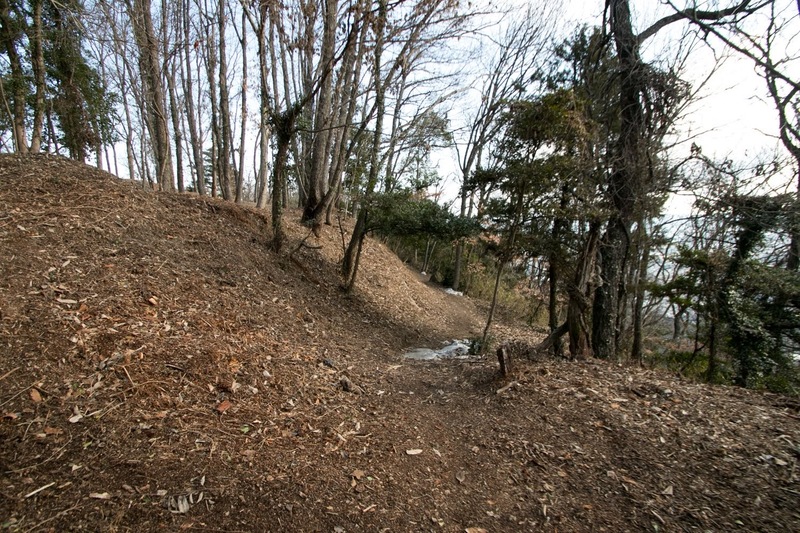 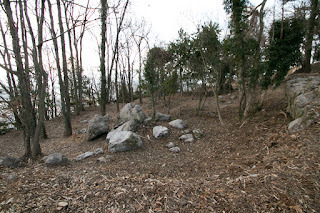 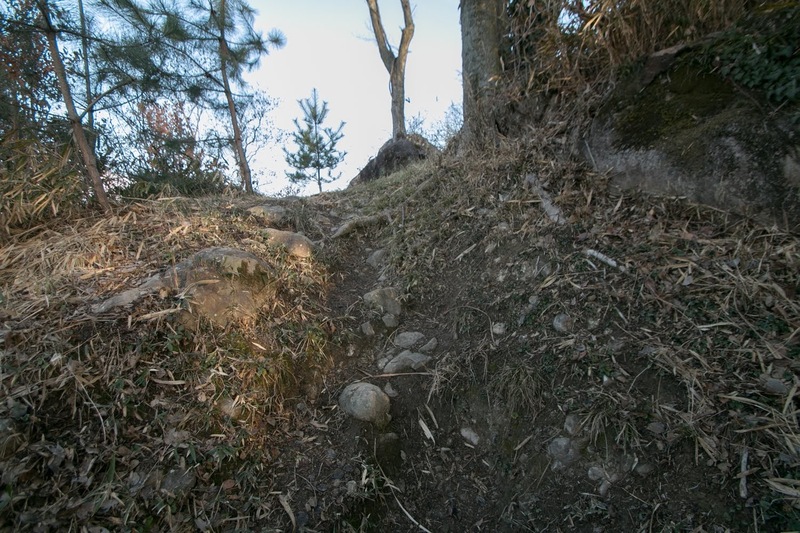 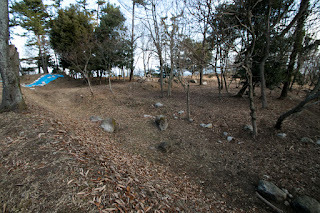 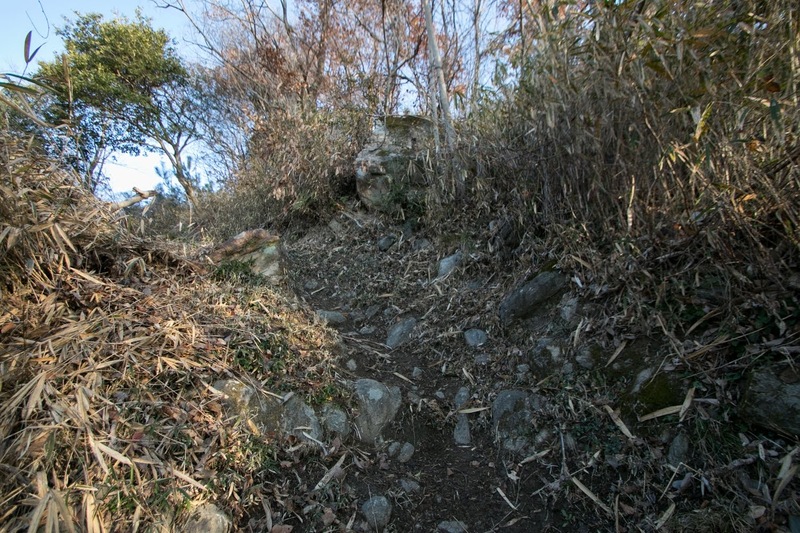 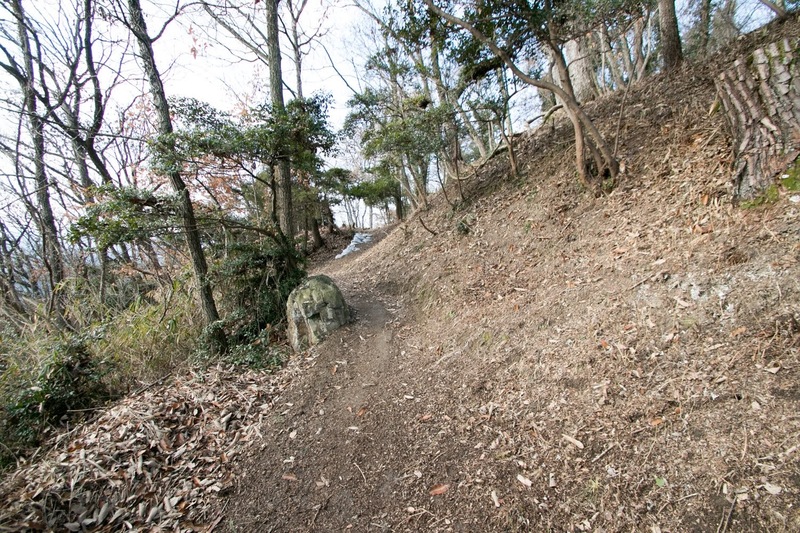 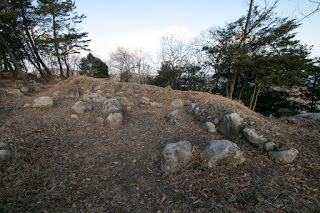 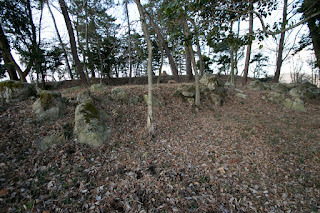 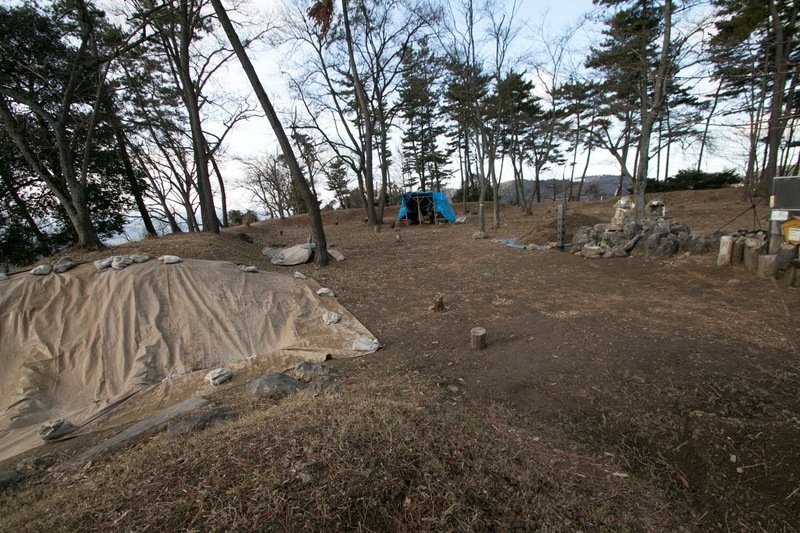 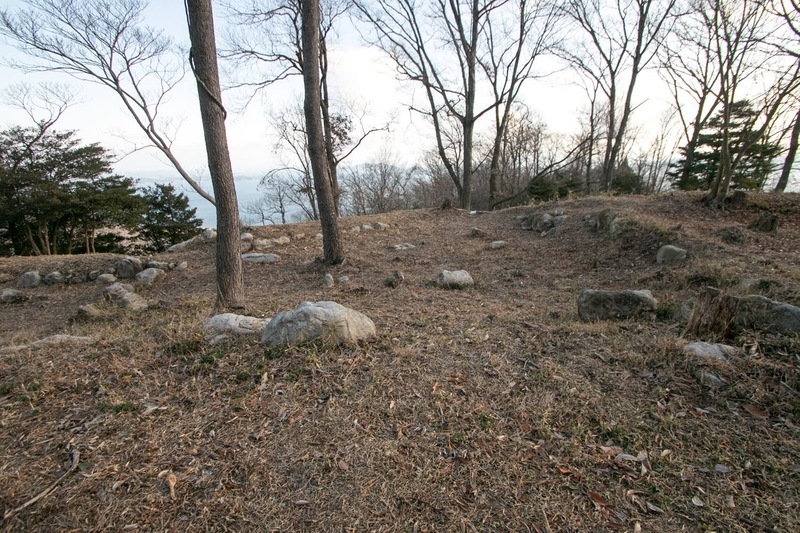 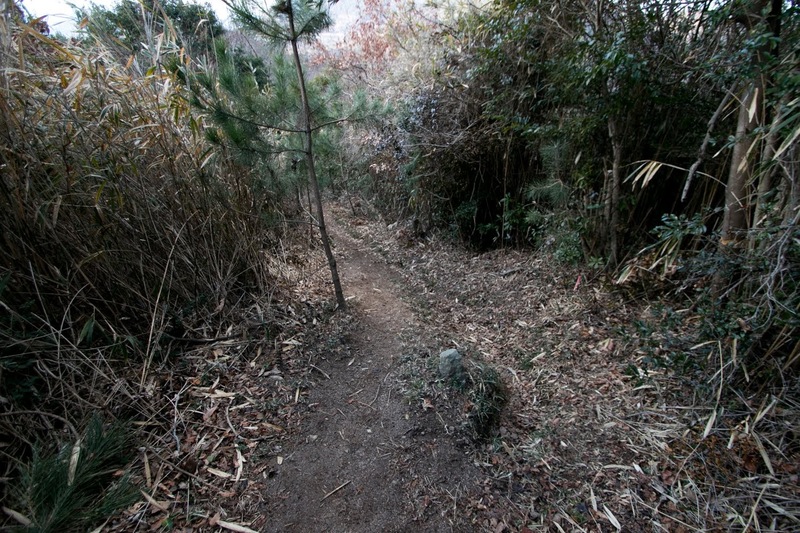 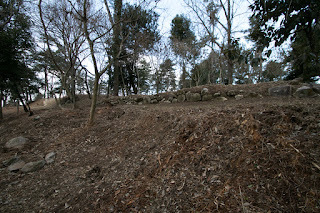 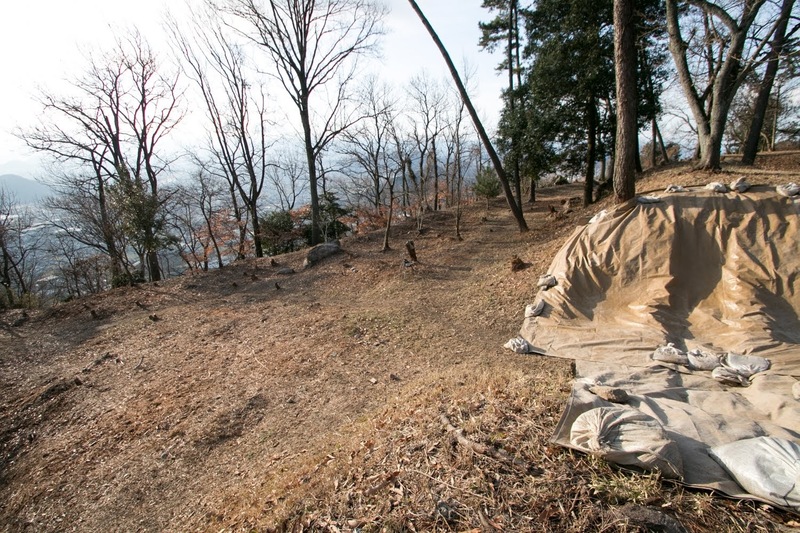 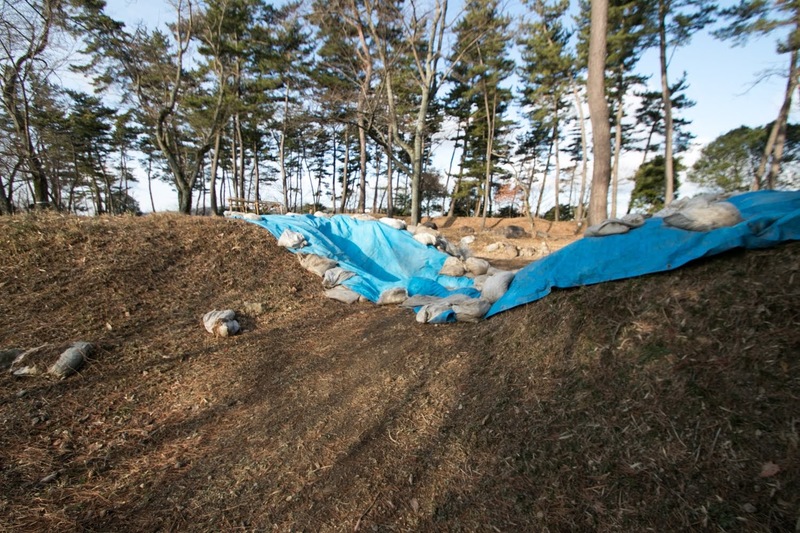 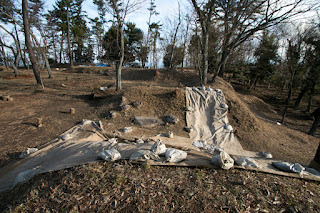 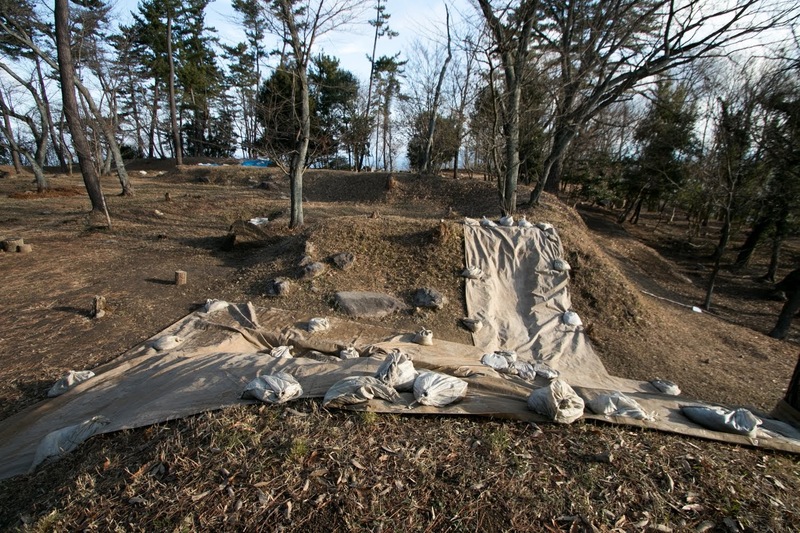 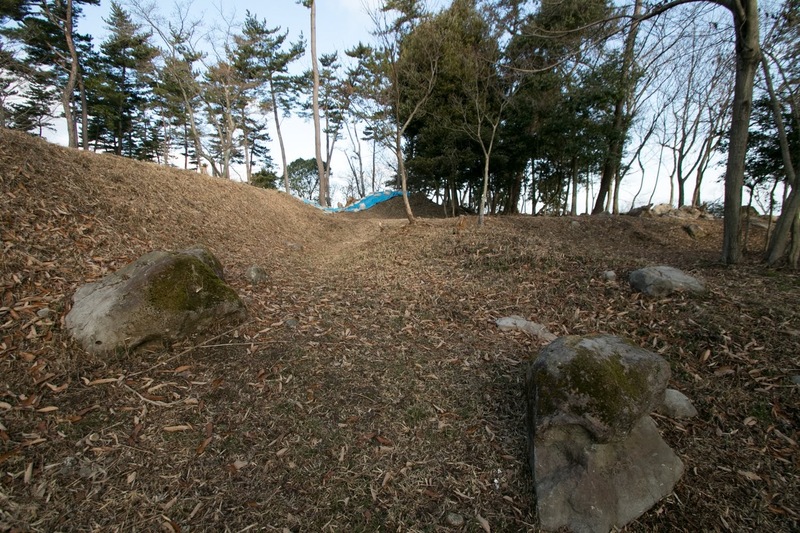 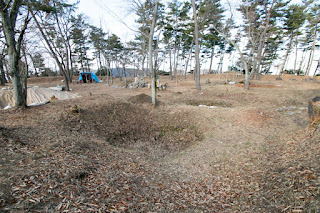 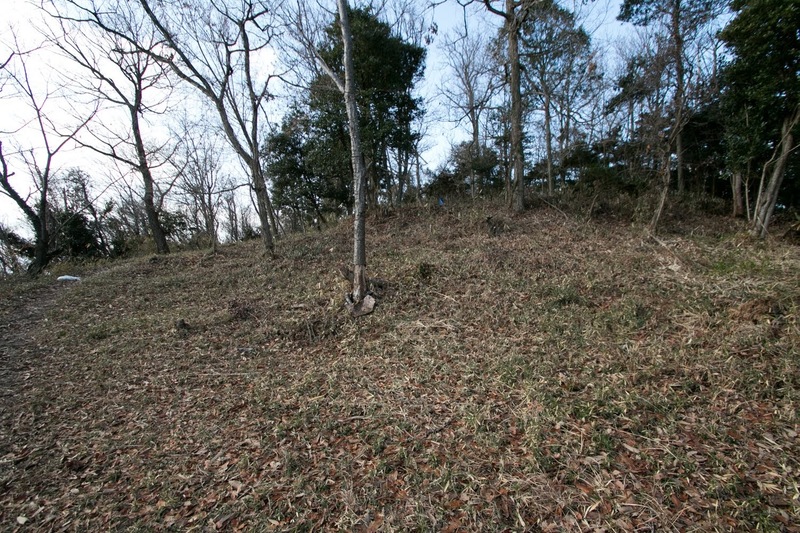 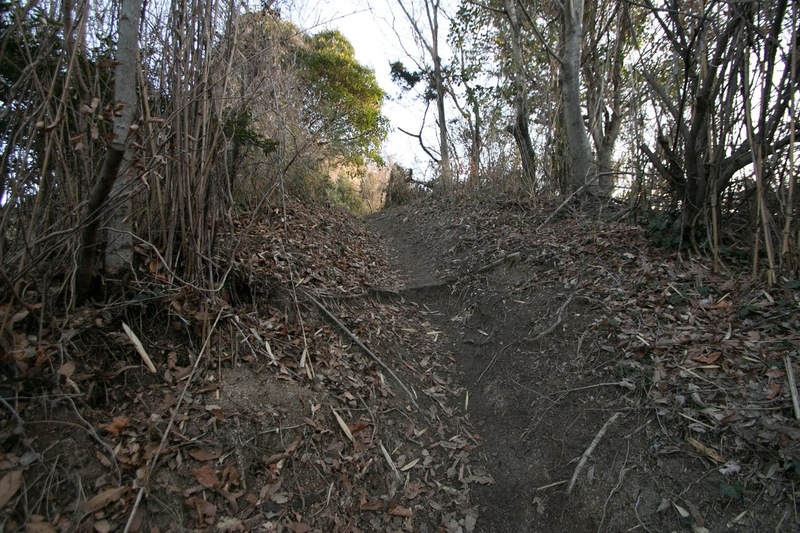 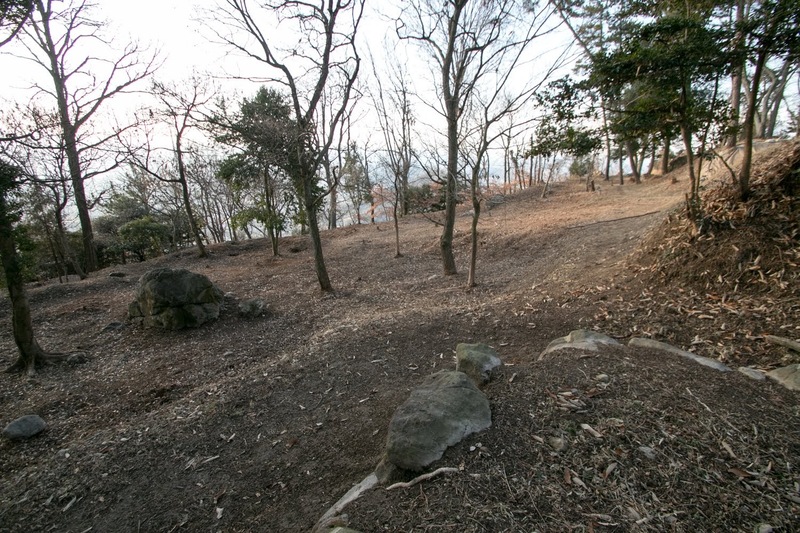 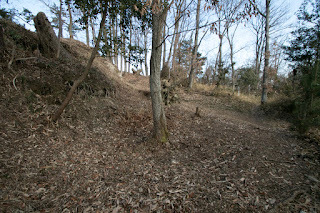 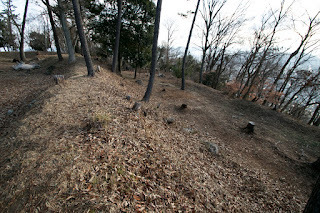 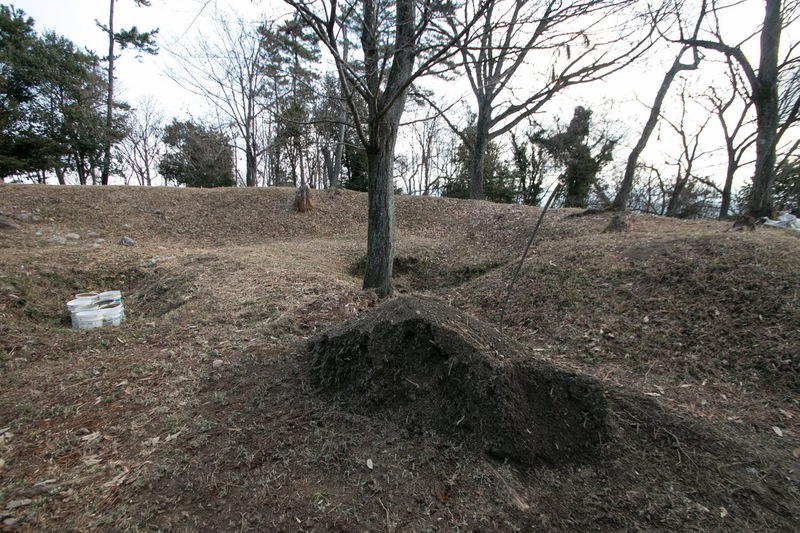 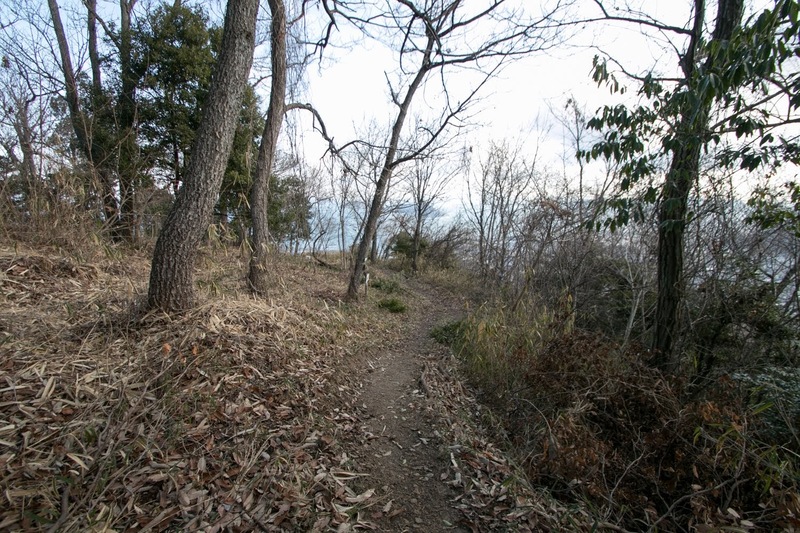 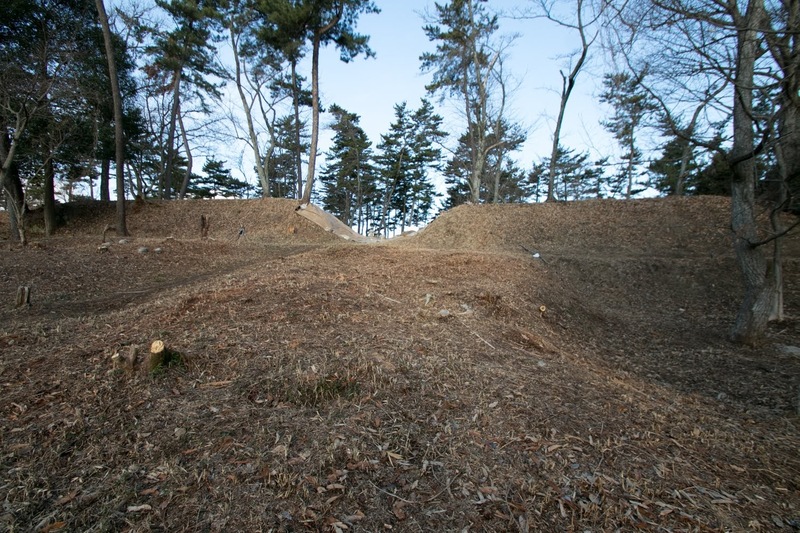 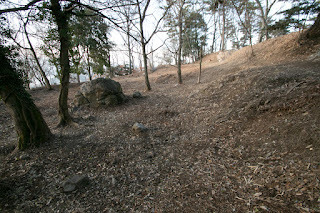 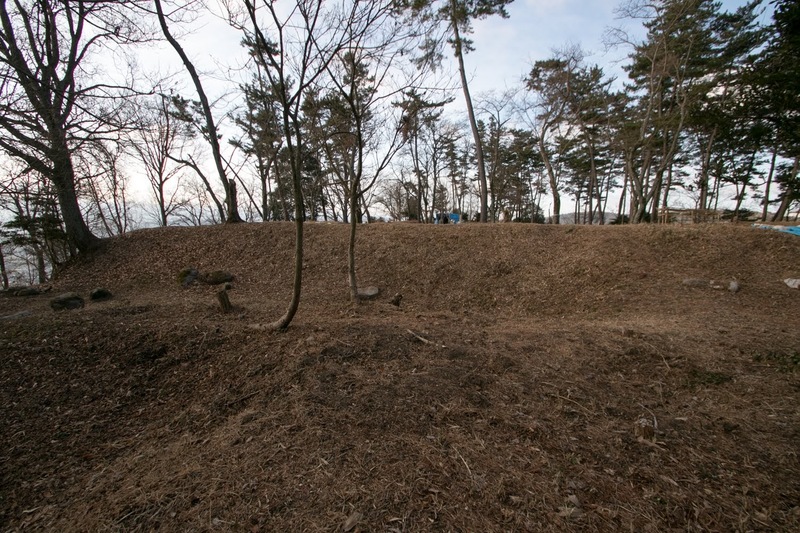 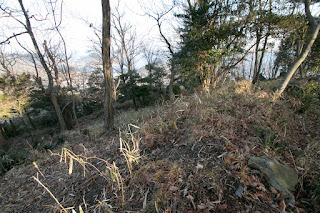 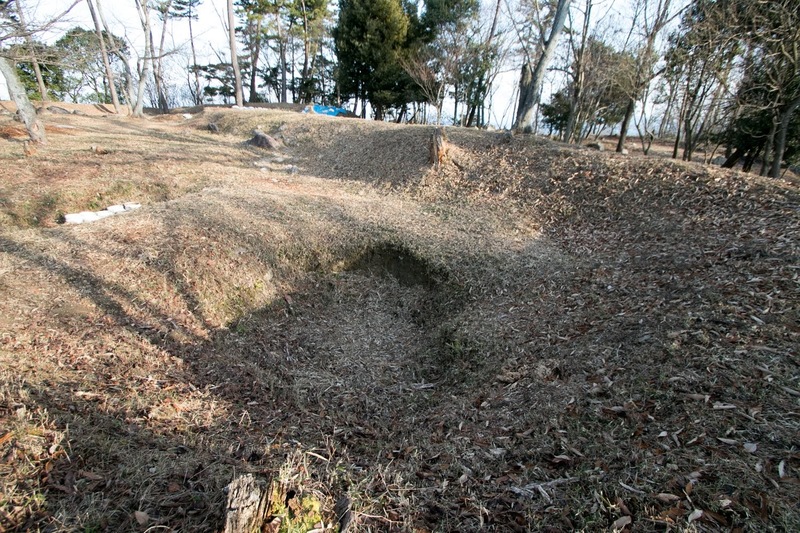 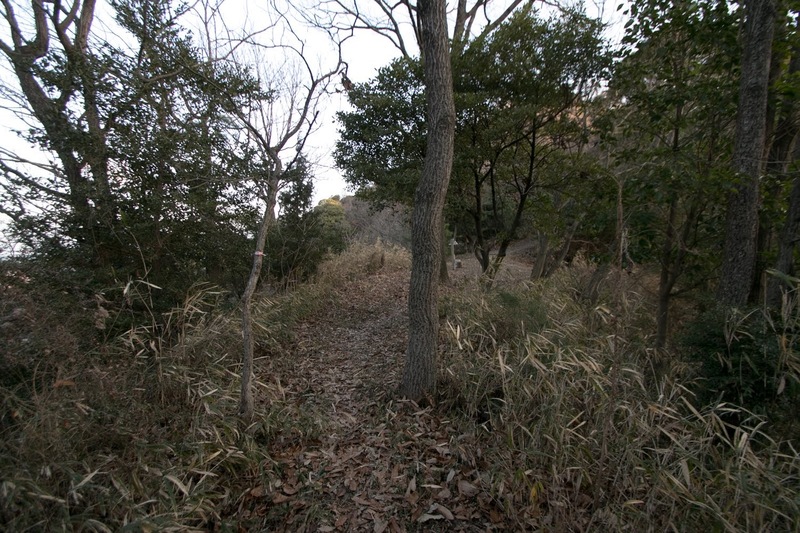 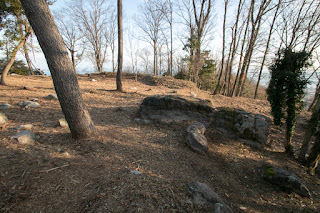 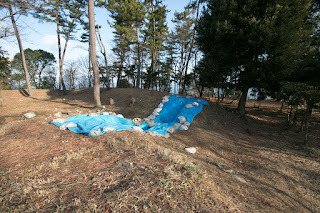 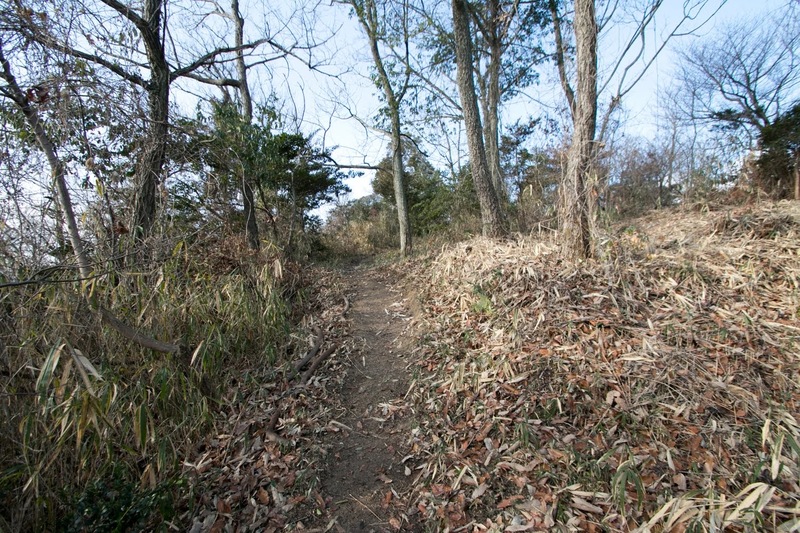 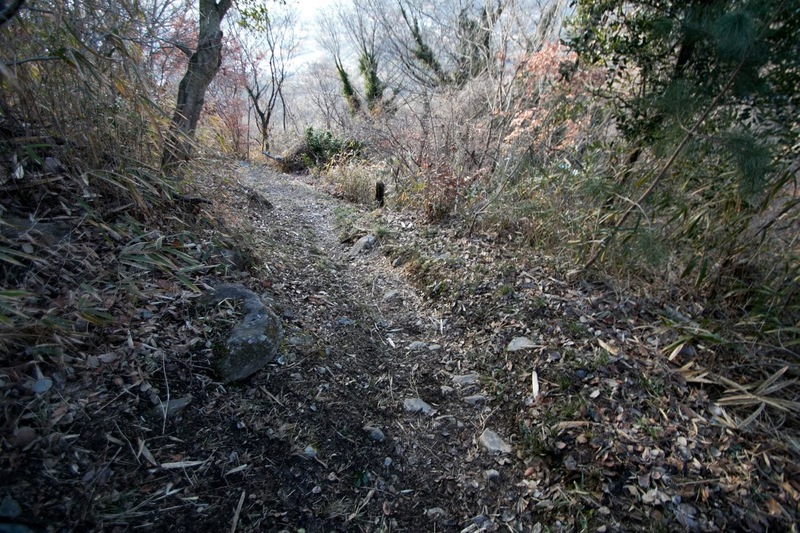 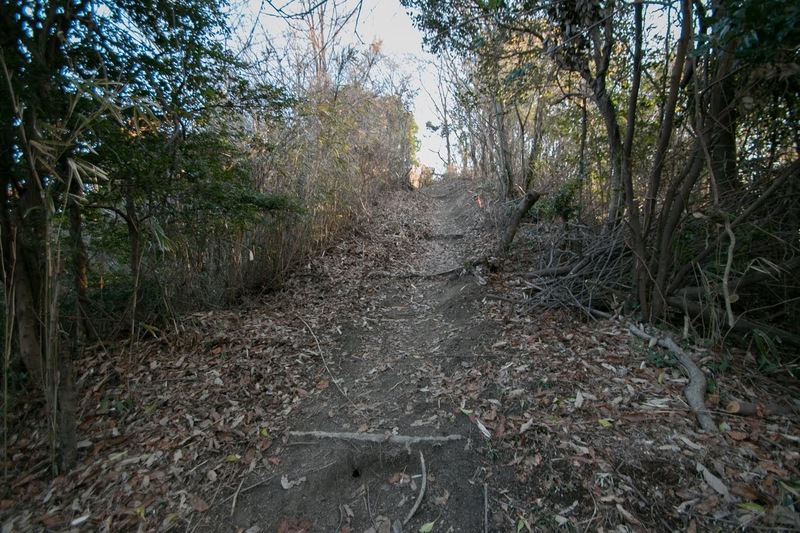 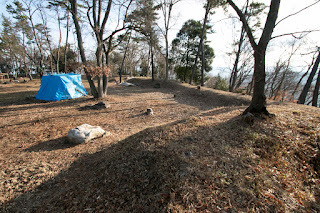 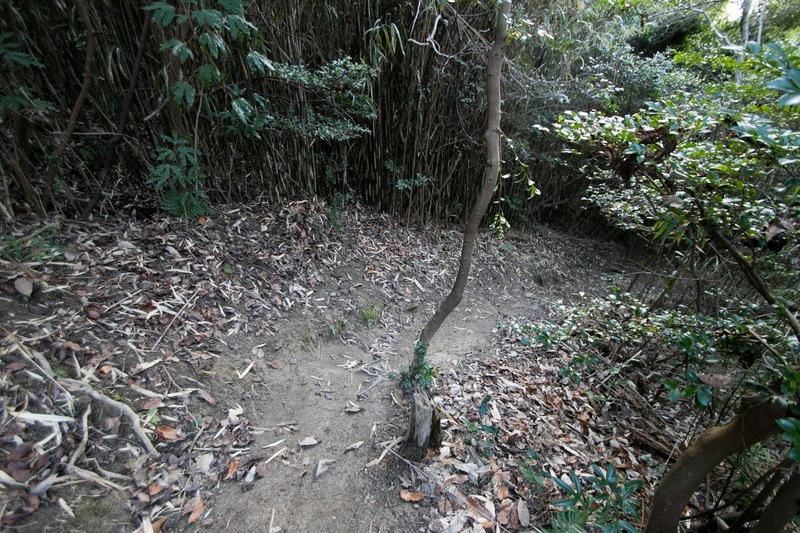 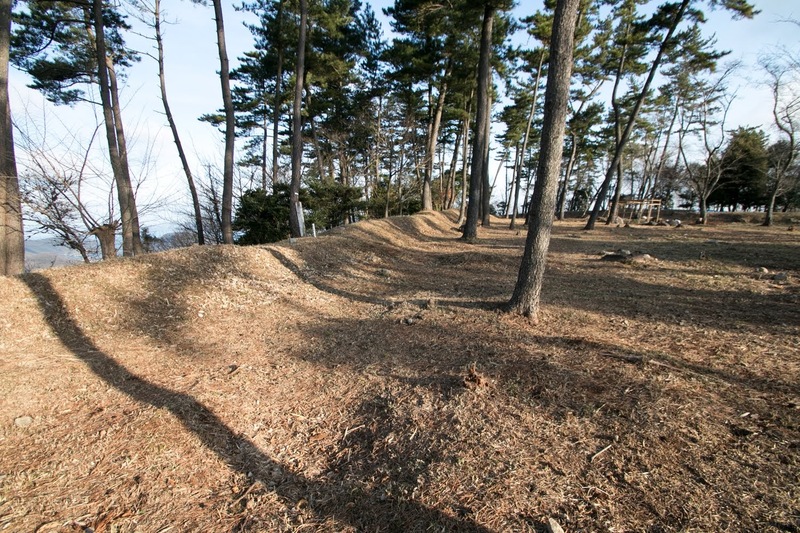 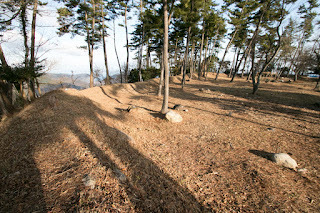 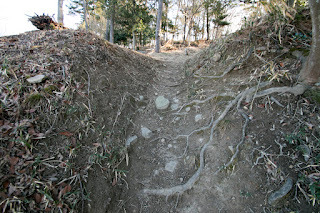 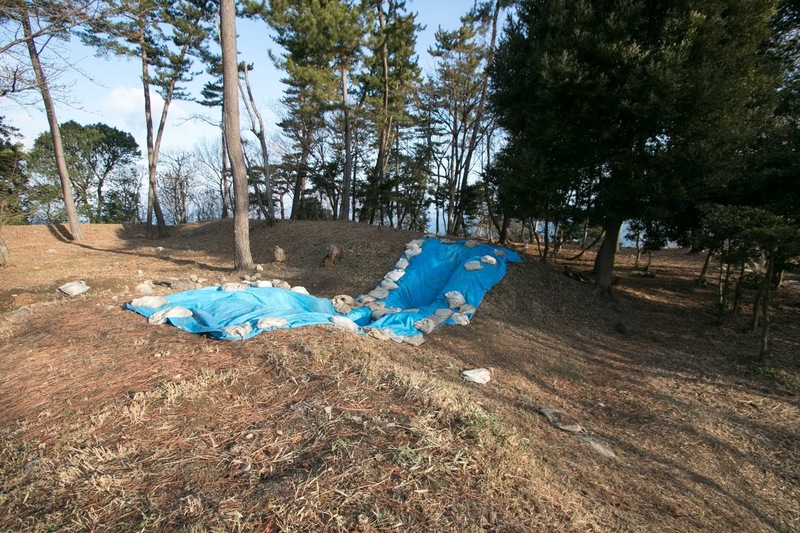 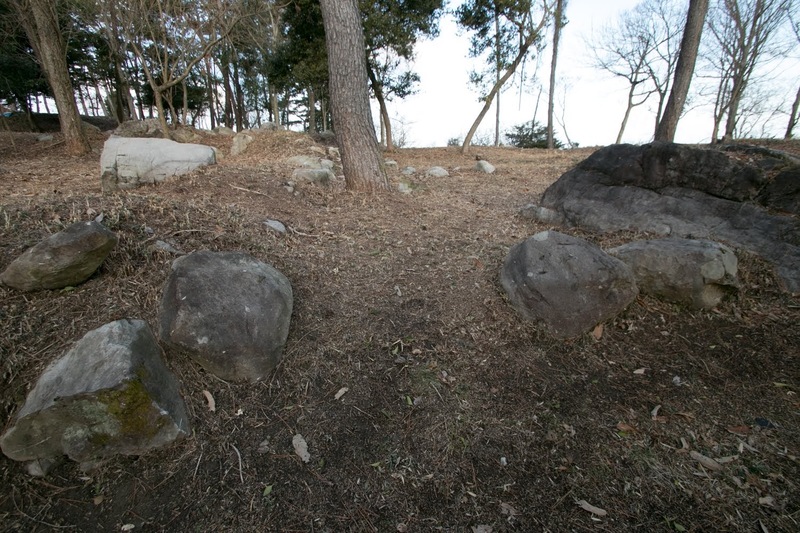 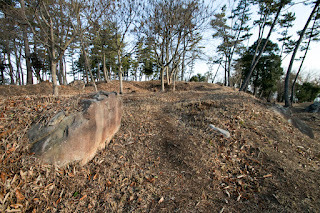 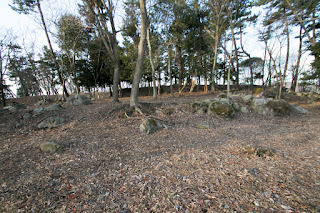 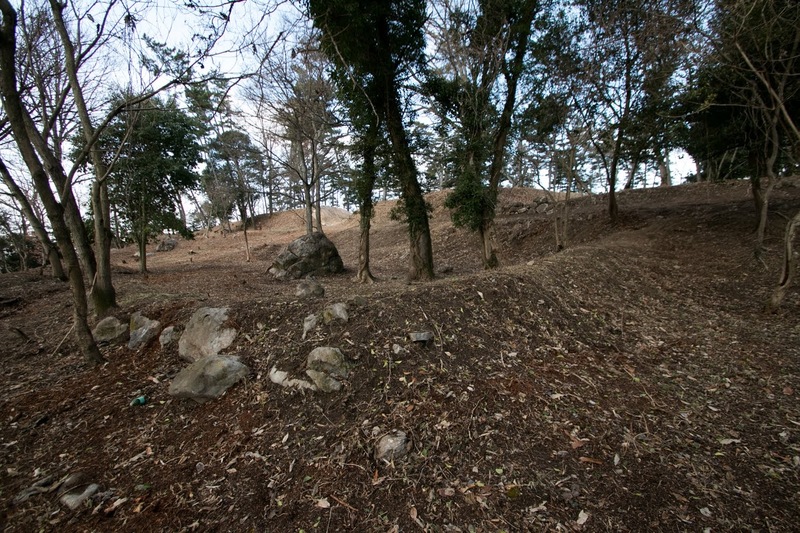 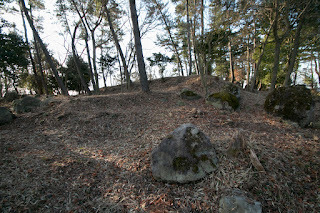 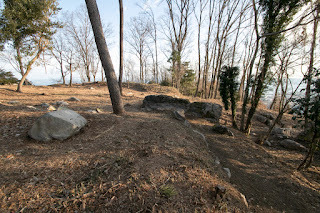 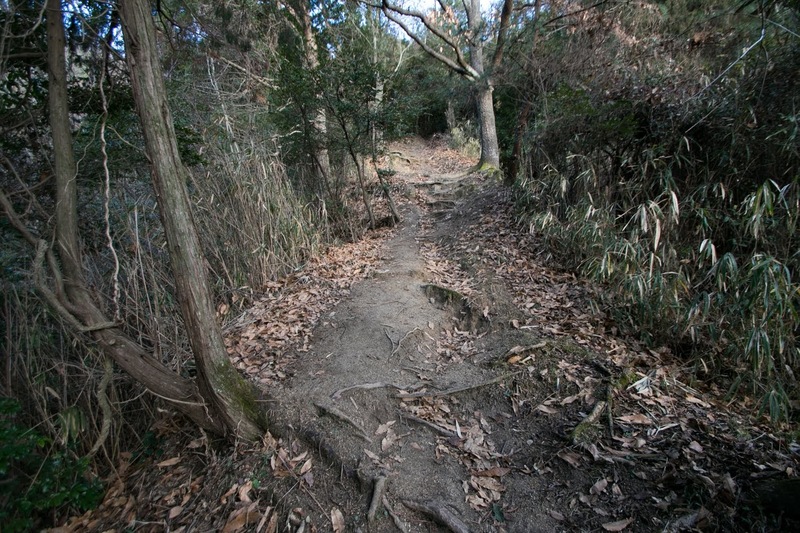 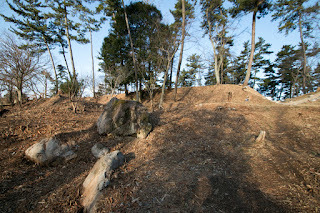 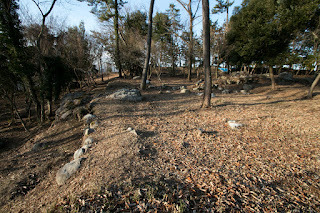 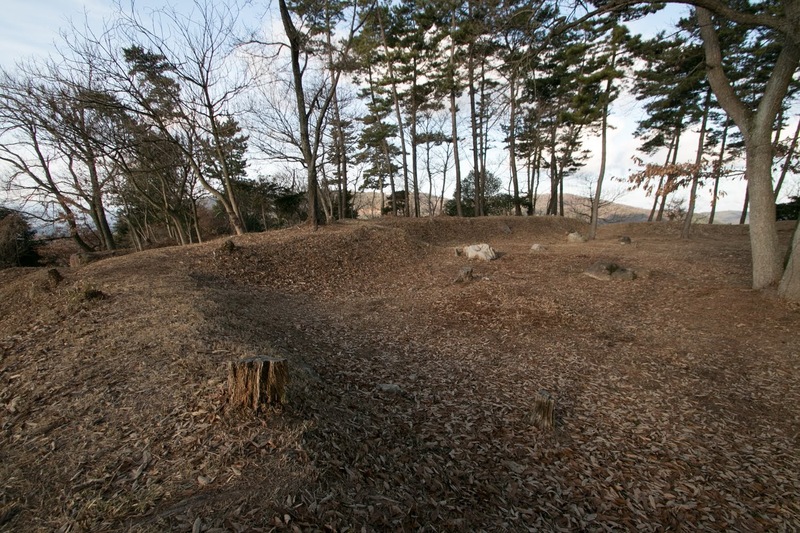 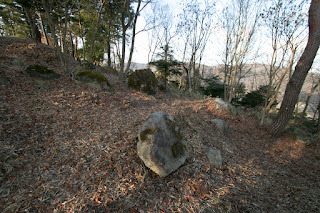 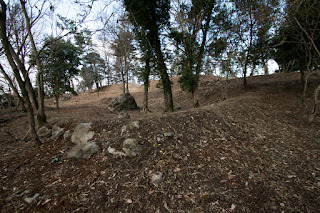 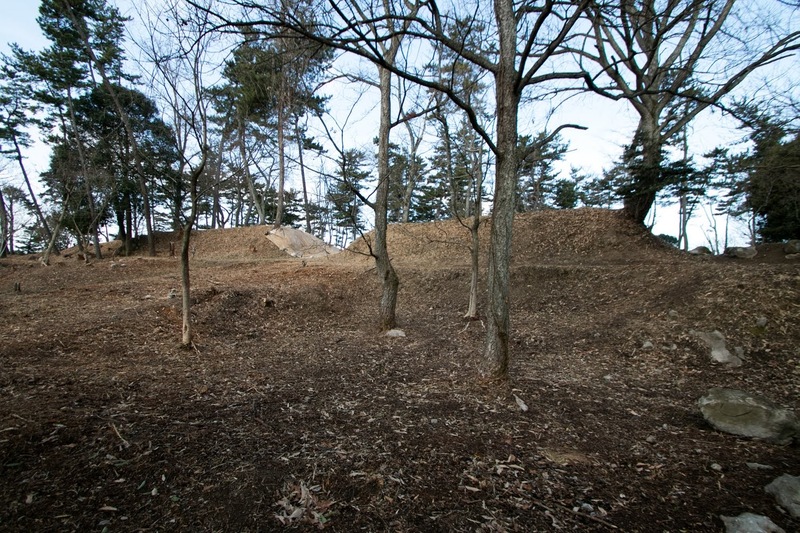 Rough shape of Katsuga castle is like a tadpole consists of body and tale being affected by the shape of hilltop. Central area of the castle is a trapezoid shaped one of about 100 meter long and 59 meter wide, which is formed by clearly straight four lines. 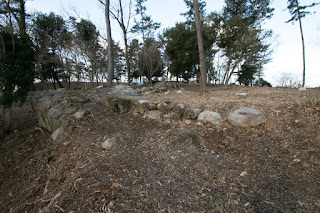 Main entrance at the east line might have turret gate built over clay wall, and backside gate at north line has masugata structure. 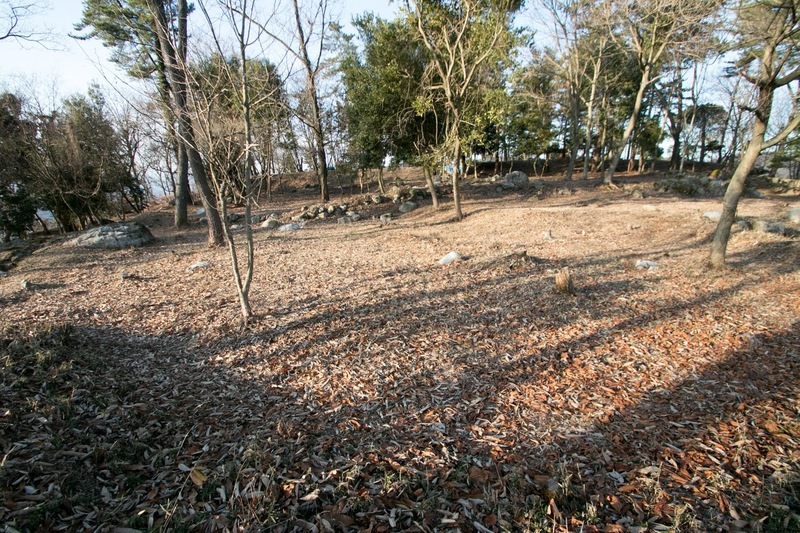 Surrounding central area, many small terraces also equips straight line exist. 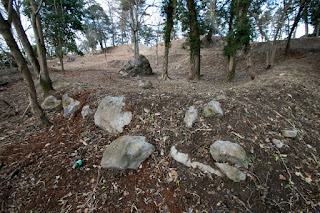 The largest one is a space at the north of backside gate of central area which is about 50 meter long and 20 meter wide, being separated with several terraces. 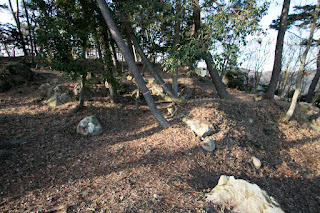 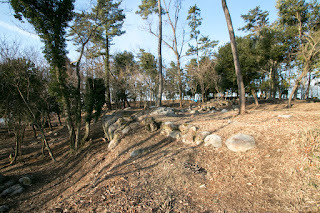 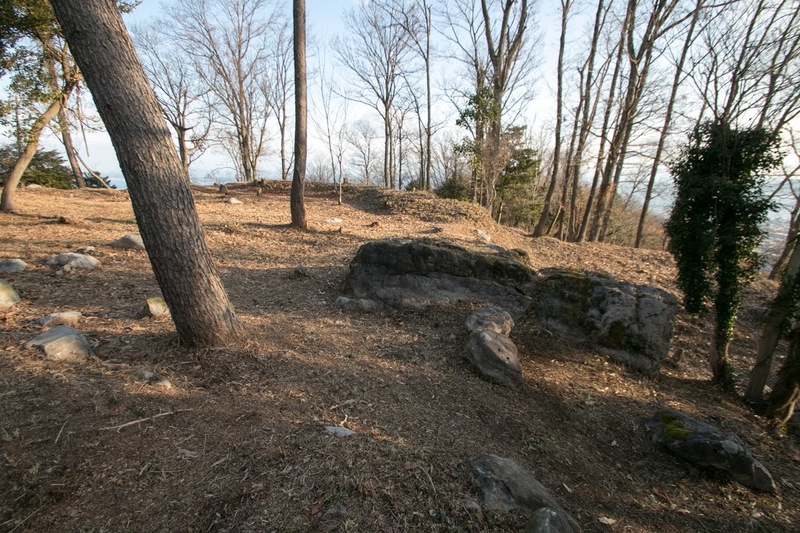 It is a backside of the castle and low height stone wall is seen then this might be a private area of the lord. 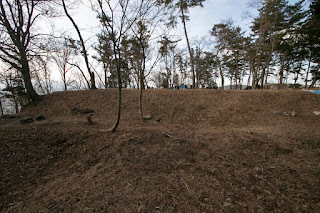 Ahead of huge dry moat, watching place is built at the part of the tale of tadpole. 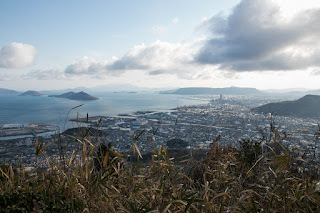 From this part scenery of Takamatsu city and Seto-naikai sea with island well seen. Looking at ground plan it seems to have a technical plan like a modern castle, but actual clay wall is low and works just for separation. 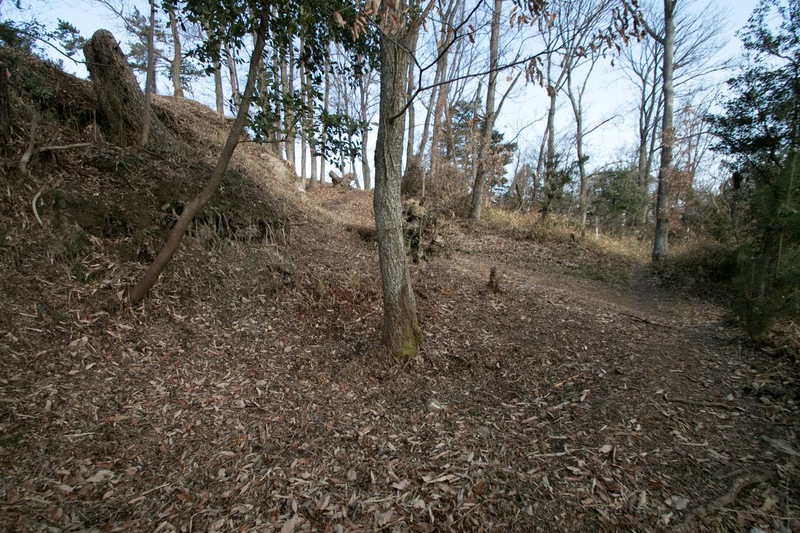 Structure of the castle which forcibly pushed the residence of central noble into a mountain castle looks like Shinpu castle of Takeda clan. By the middle of 16th century, Hosokawa clan significantly lost their power by internal conflicts then Miyoshi clan which was originally a retainer of Hosokawa clan at Awa province (Tokushima prefecture) significantly grew their power under their leader Nagayoshi Miyoshi (1522-1564). Nagayoshi sent his younger brother Kasumasa Sogo (1532-1561) to Sogo clan, the local lord at the east part of Sanuki province. 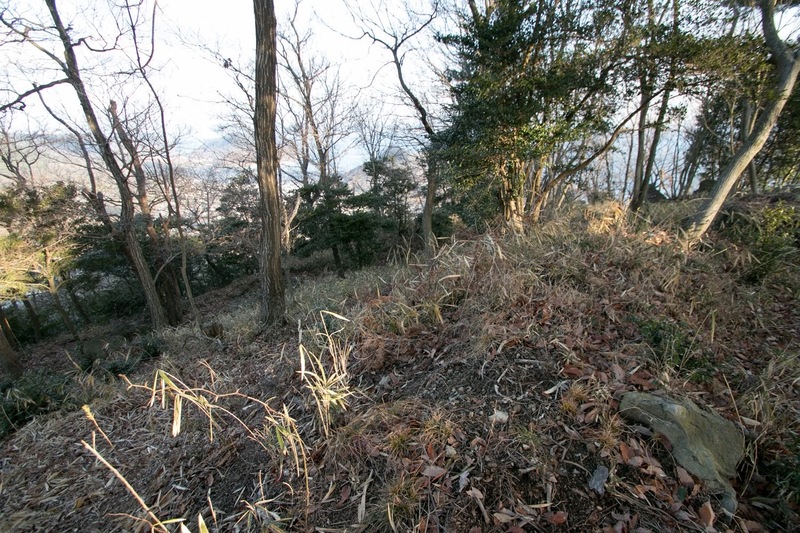 Kazumasa was a brave general respected as “Damon Sogo”, activated at many battles at Kinki region and also expanded this influence at Sanuki province. 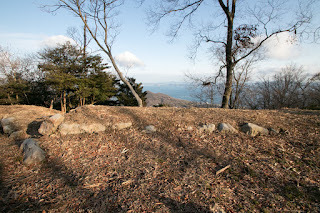 Looking at the fall of Hosokawa clan, Kozai clan followed to Miyoshi clan. 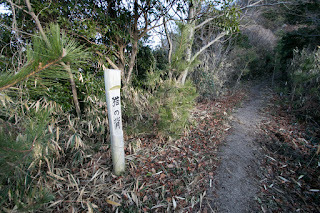 But the hegemony of Miyoshi clan did not long 10 years. 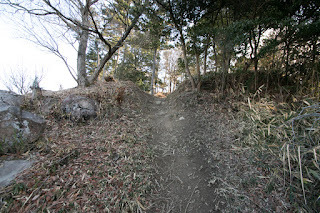 In the former half of 1560’s Miyoshi clan lost its leader Nagayoshi Miyoshi and talented younger brothers, then fell into the conflict between Hisahide Matsunaga (1508-1577) and other important retainers. 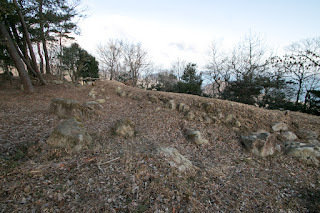 In the meantime, Nobunaga Oda (1534-1582), the warlord of Owari province (western half of Aichi prefecture), marched to Kyoto city then Miyoshi government collapsed. 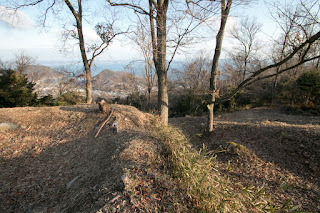 As Nobunaga who were surrounded by enemies did not aim at Shikoku island, the situation of Kozai clan kept stable. In 1568, Kozai clan attacked Kayo castle and Motobuto castle of Ukita clan at the opposite of Seto-Naikai sea under alliance with Mouri clan, but failed and the leader of Kozai clan died in this battle. 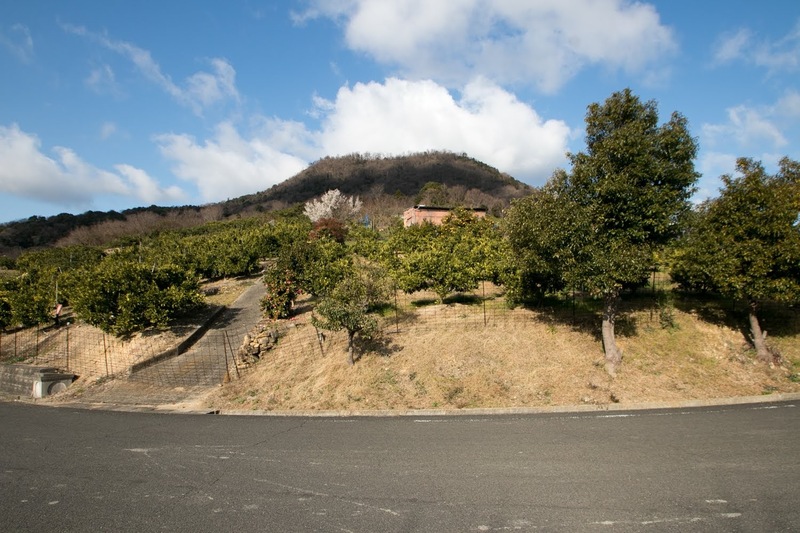 In 1570’s, Miyoshi clan still remained at Awa province and Kozai clan significantly lost their power by respective internal conflicts. 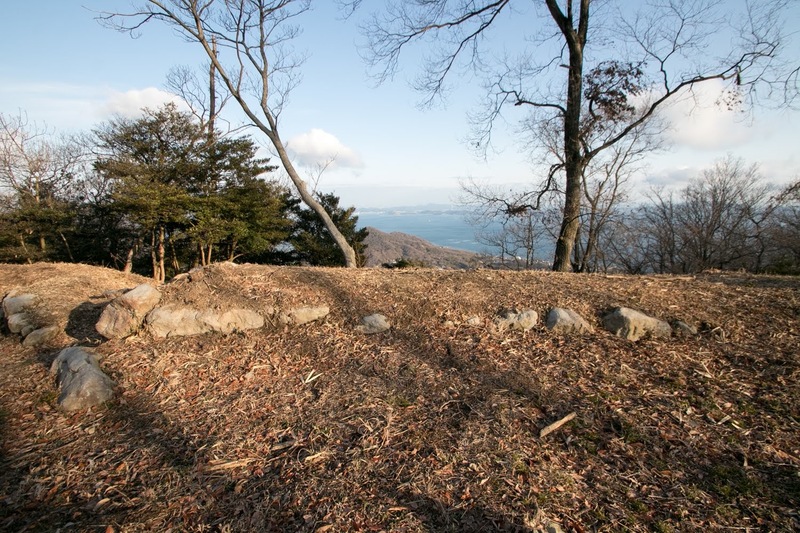 Looking at this, Motochika Chosokabe (1539-1599), the warlord of Tosa province (Kochi prefecture) started invasion into Awa province and Sanuki province aiming the unification of Shikoku island. 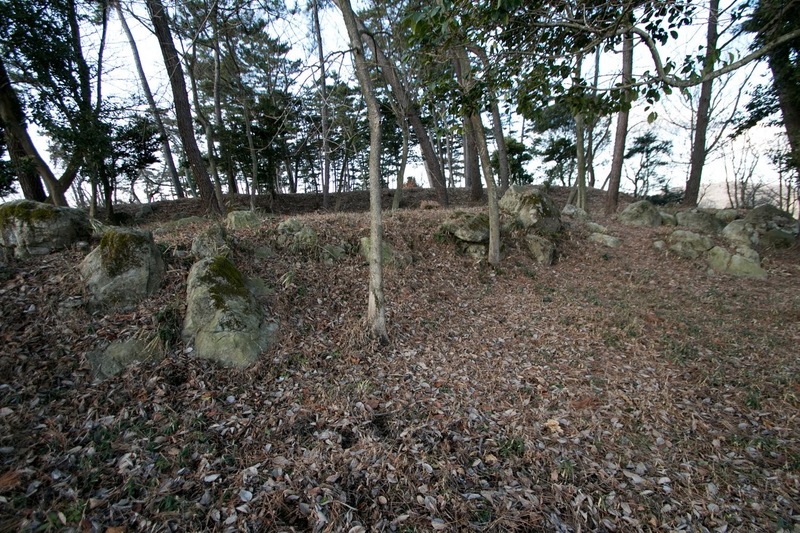 Kagawa clan of Amagiri castle which faced the threat of Chosokabe clan agreed and accepted the son of Motochika as their successor. 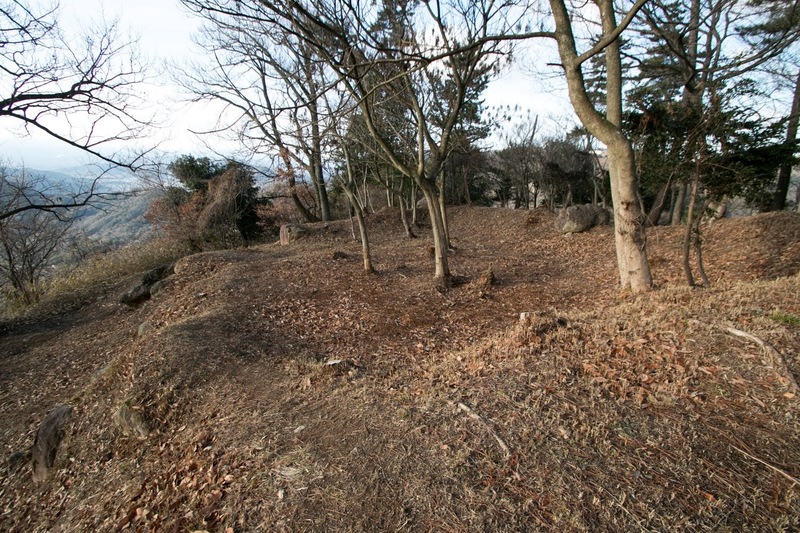 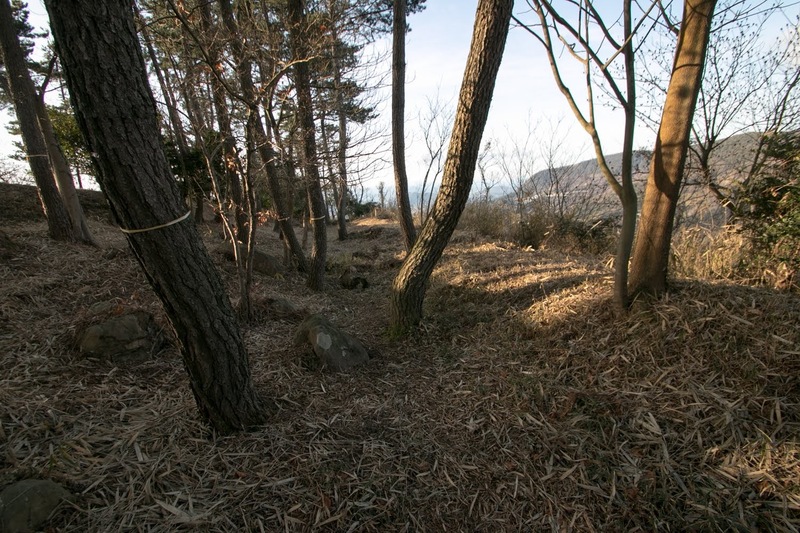 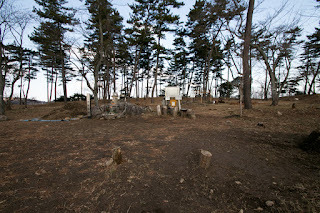 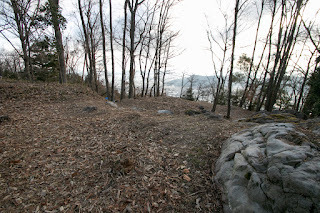 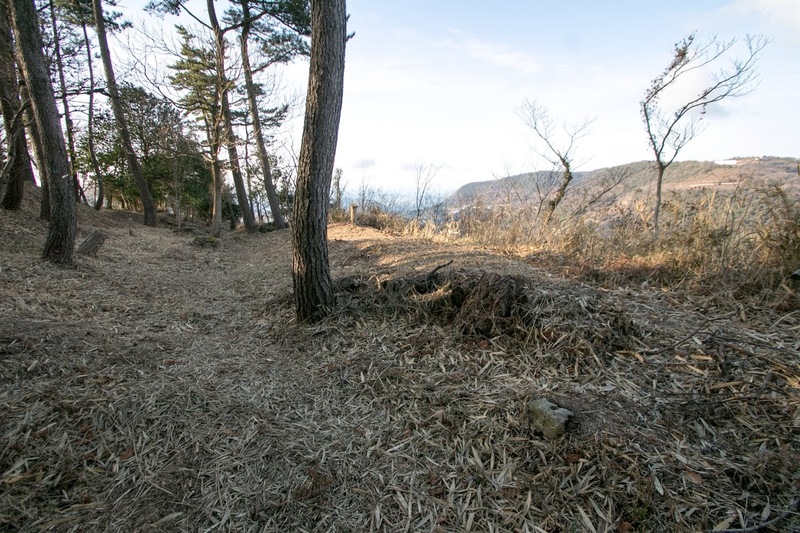 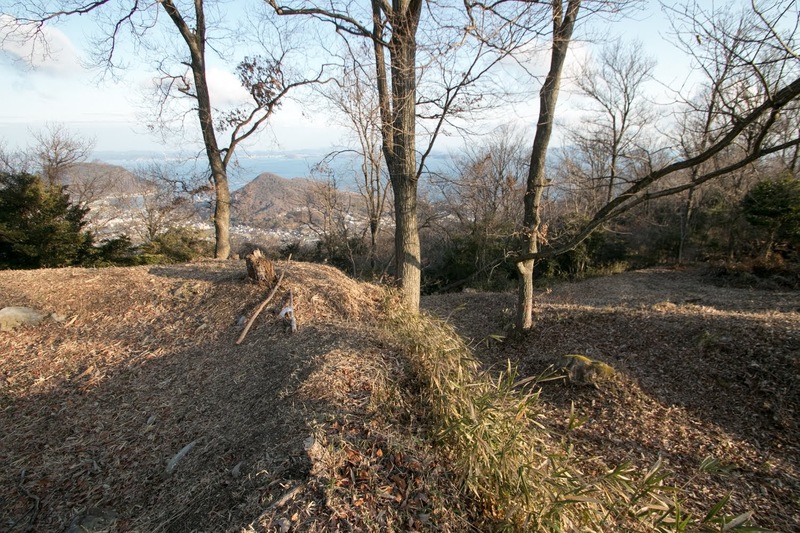 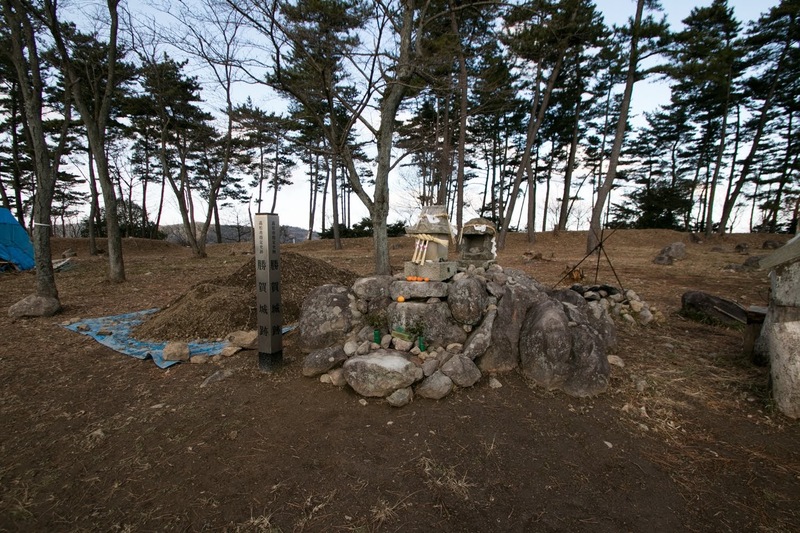 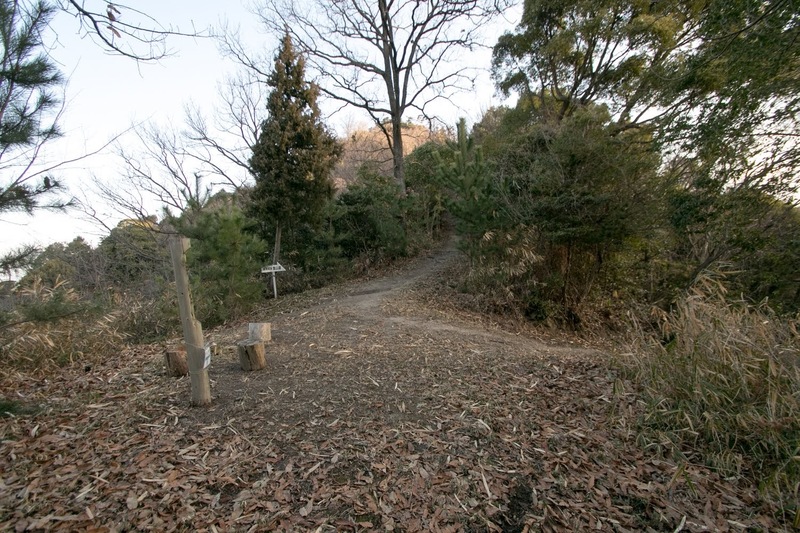 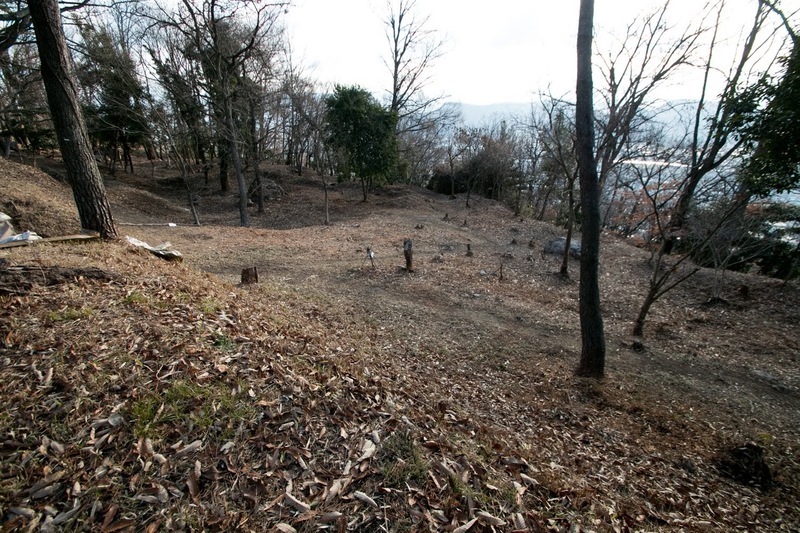 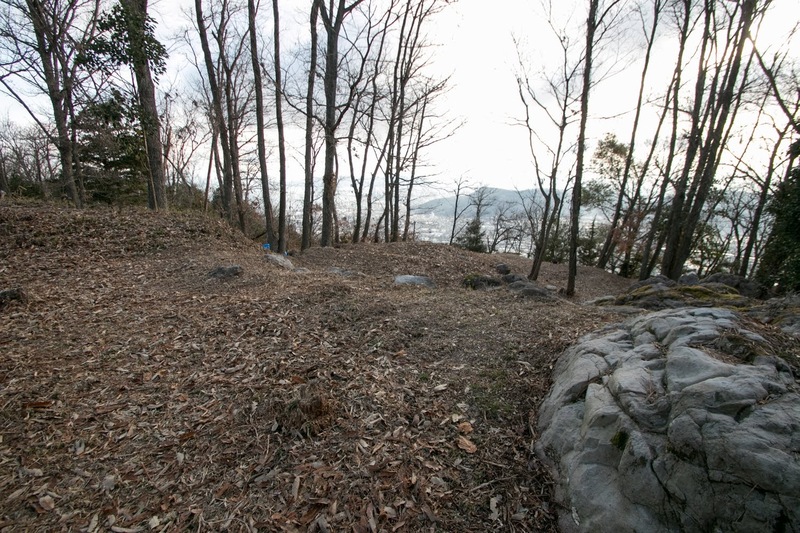 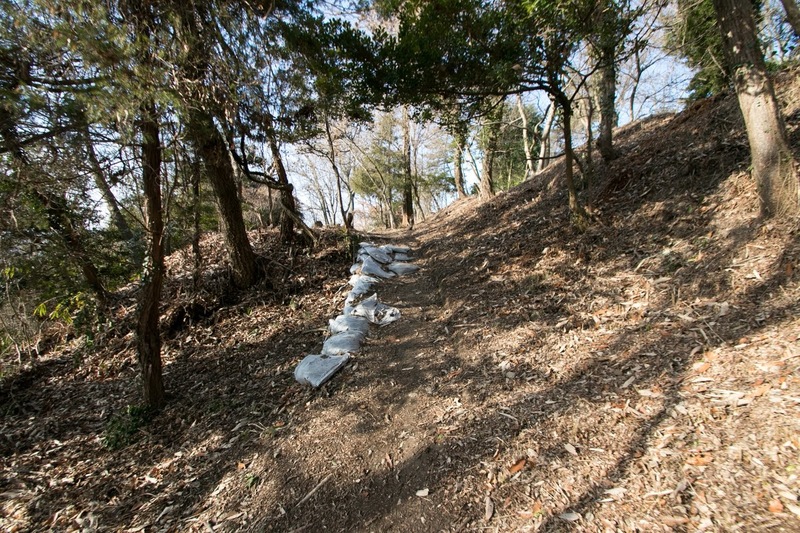 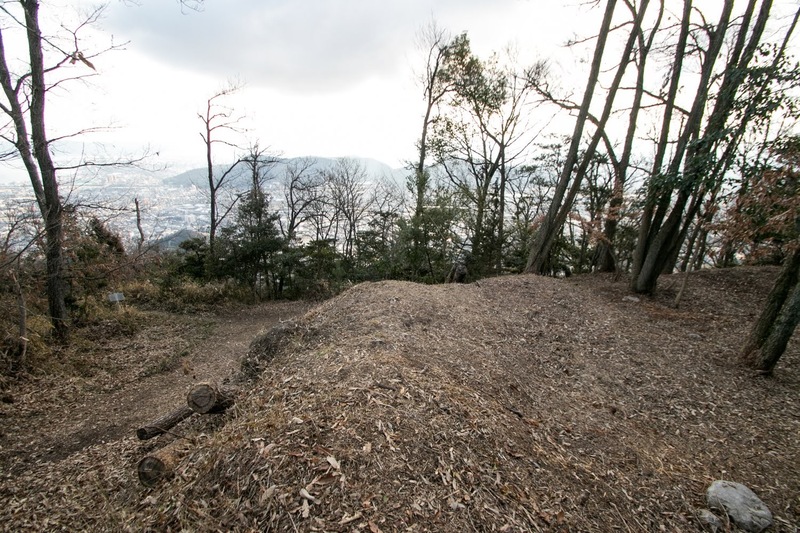 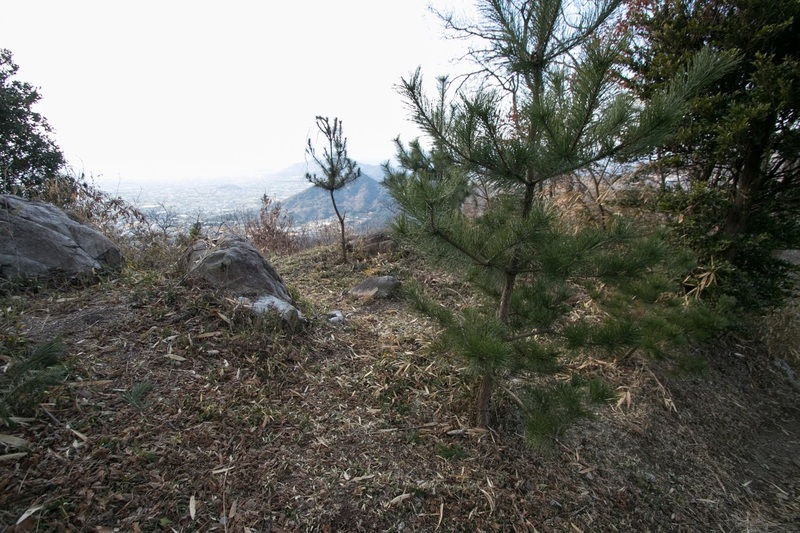 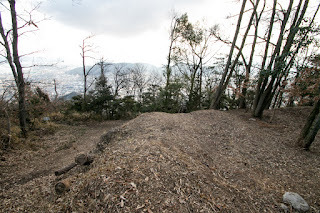 Preparing for the attack of Chosokabe clan, Kozai clan newly built Fujio castle as their new hillside residence, instead of former Saryo castle both at the hillside of Katsuga-yama mountain. 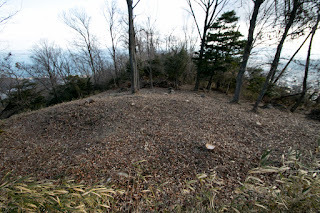 The expansion of Chosokabe clan once stopped by the interference of central ruler Nobunaga Oda. 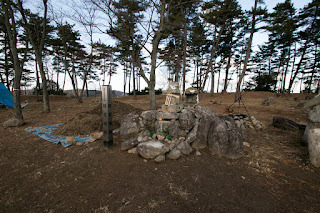 But after the sudden death of Nobunaga in the incident of Honnoji, a coup d’?tat by his general Mitsuhide Akechi (1528-1582), Motochika Chosokabe resumed his expansion again. 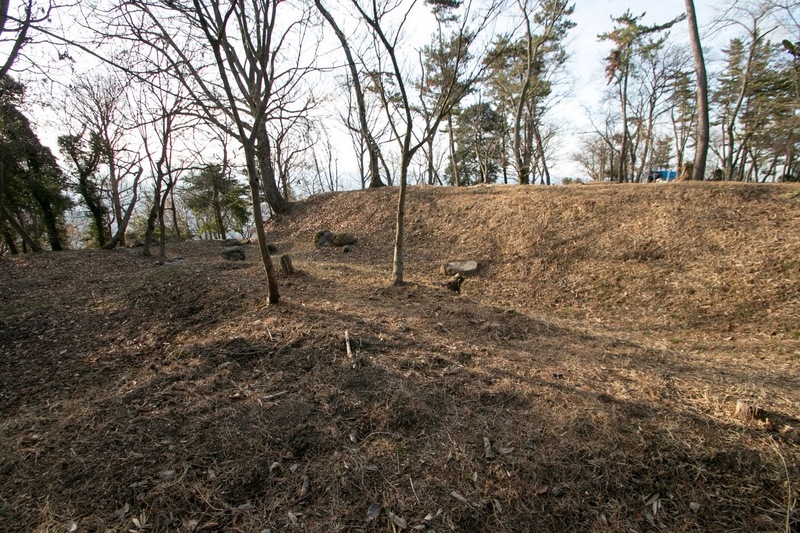 In 1582, Chosokabe army attacked Katsuga castle then Kozai clan surrendered to Chosokabe clan under coordination of Kagawa clan. 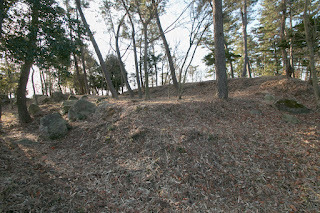 But three years later next central ruler Hideyoshi Toyotomi (1537-1598) attacked Chosokabe clan with overwhelming army, then Chosokabe clan could not resist it and surrendered to Hideyoshi. 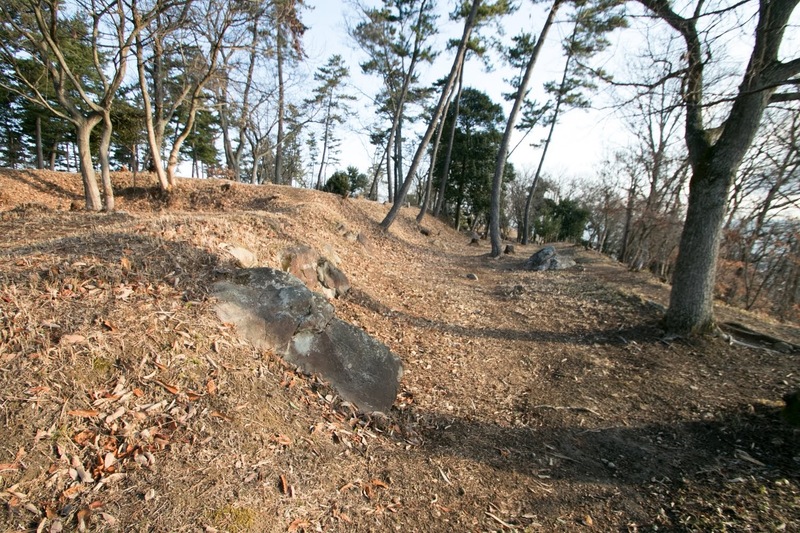 As Sanuki province was confiscated by Hideyoshi at this time, Kozai clan retired and ended its history of local lord nearly for 300 years. 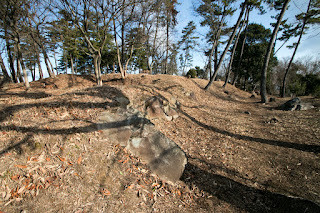 Toyotomi government used Shotsuji castle as the main base of Sanuki province, but later Takamatsu castle and Marugame castle were built to manage east half and west half of the province. 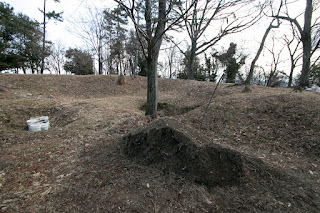 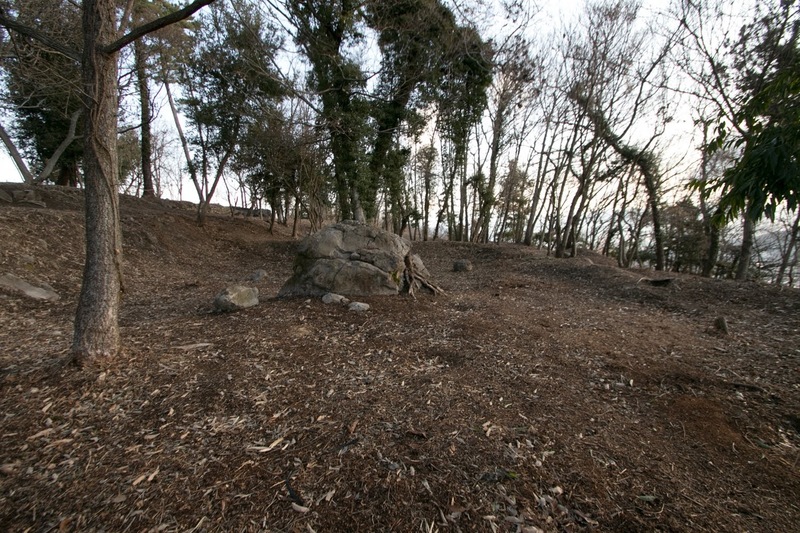 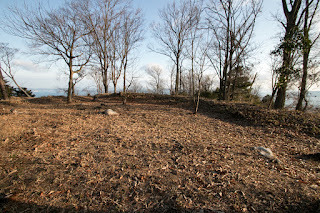 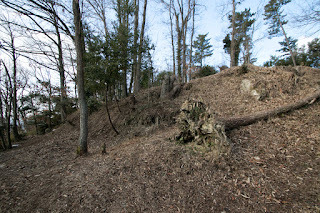 Now all building was lost but structure of the castle well remain over the mountain. 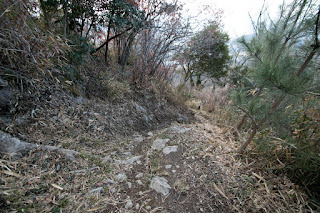 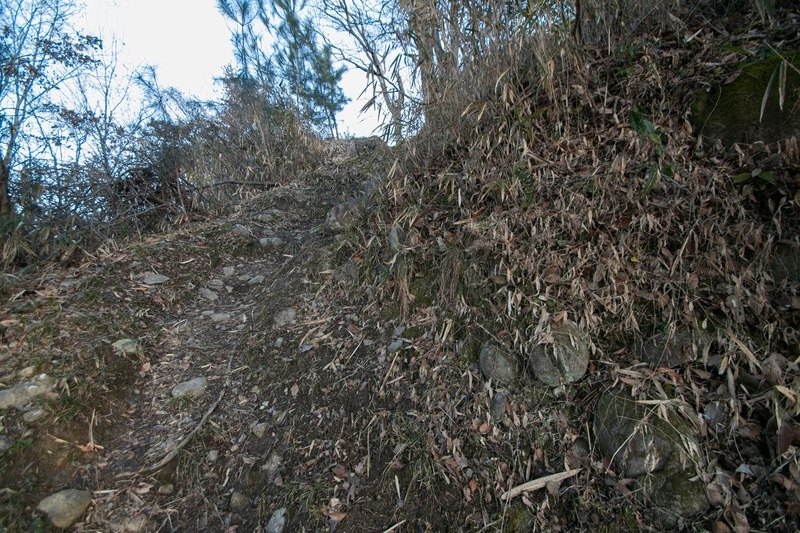 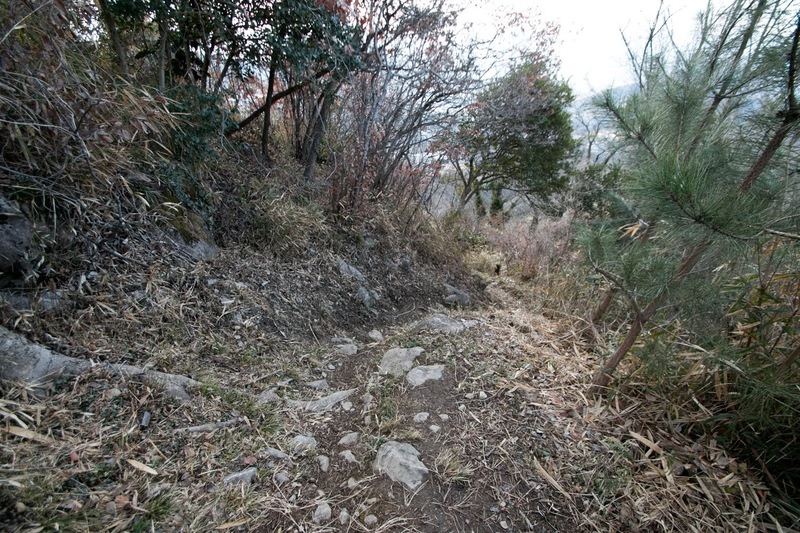 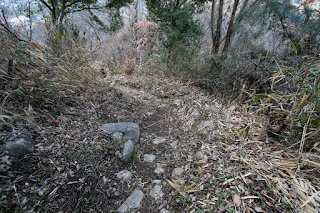 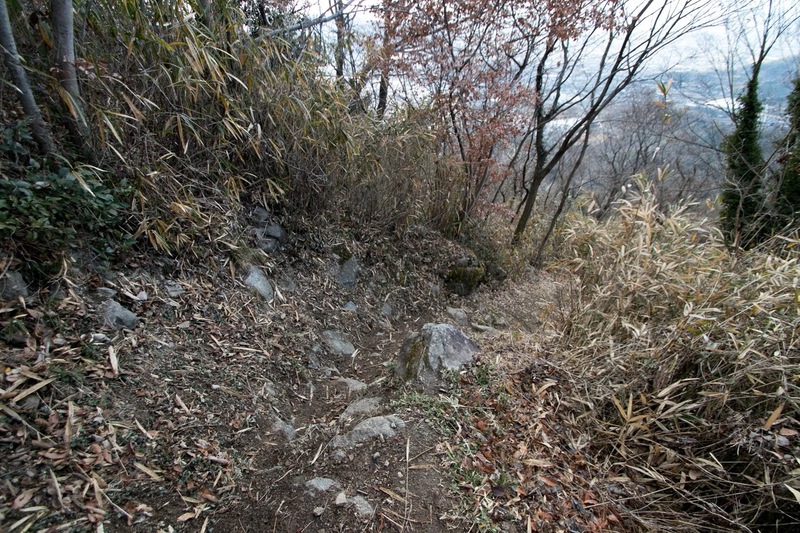 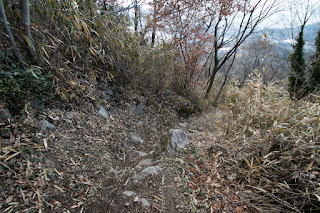 The gap between quite tough climbing road of the mountain but well processed structure of hilltop area is impressive. 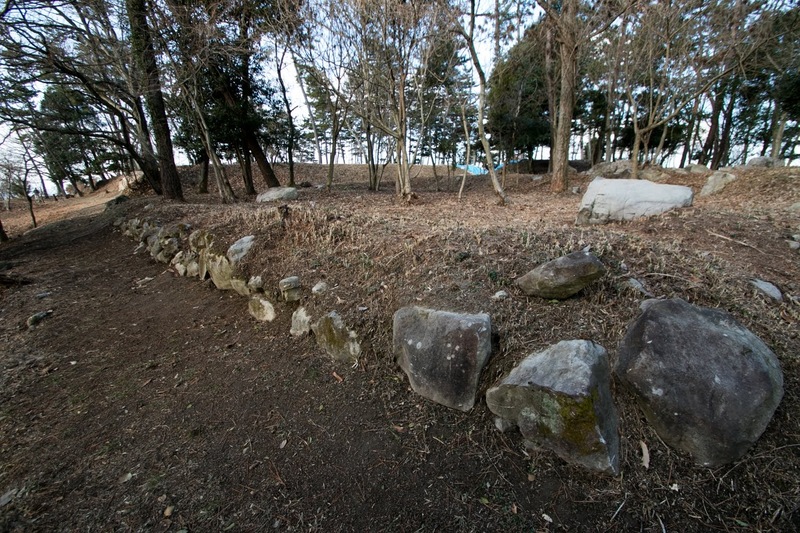 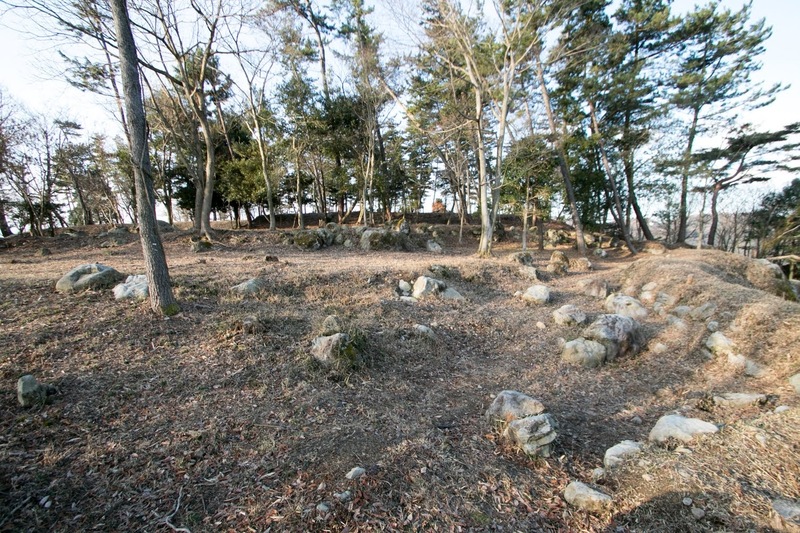 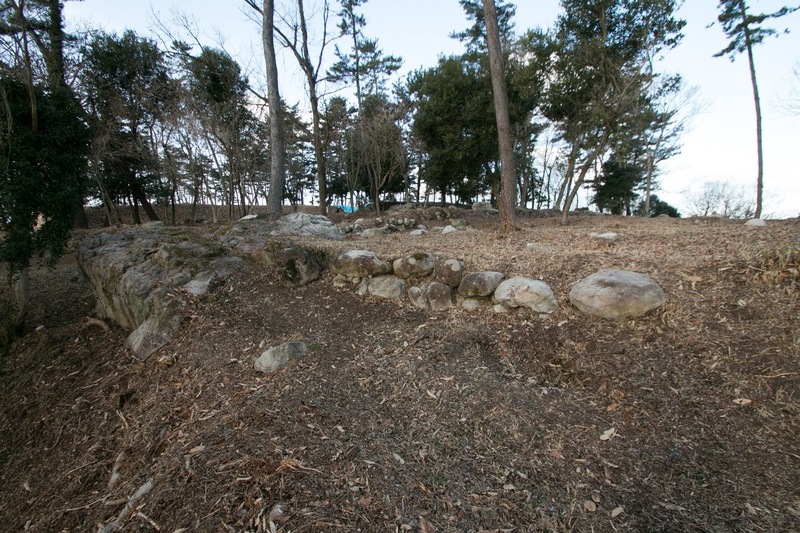 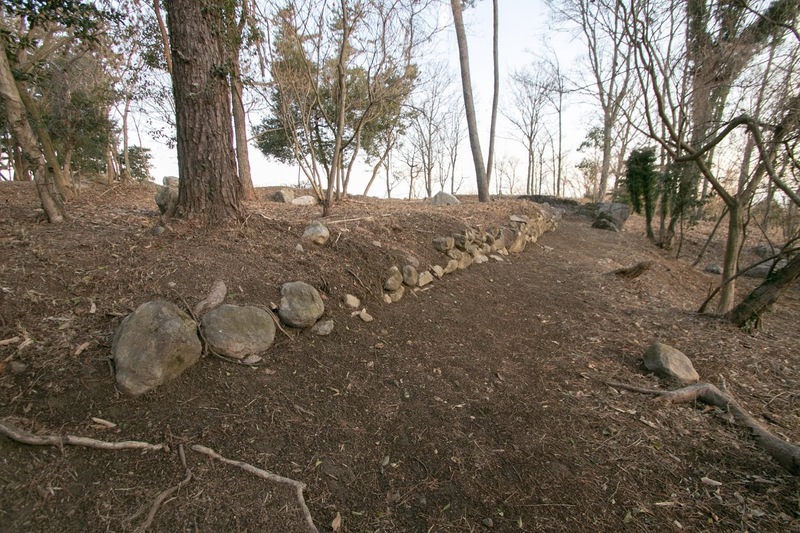 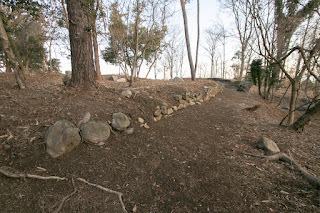 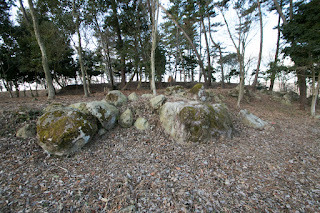 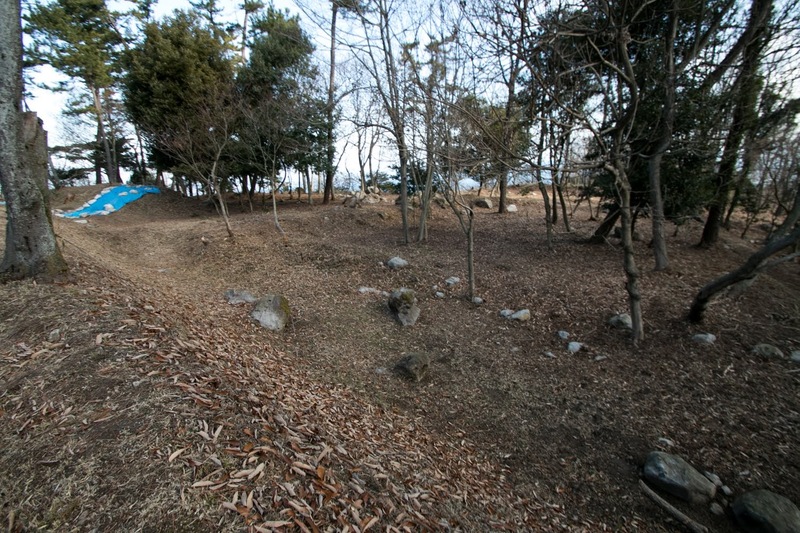 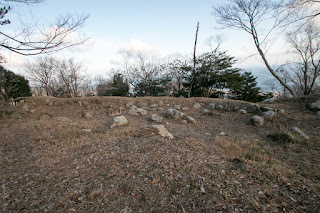 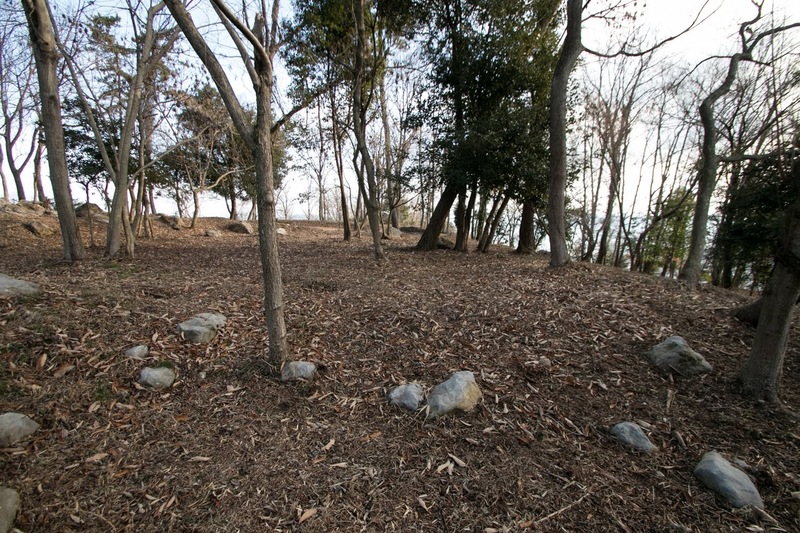 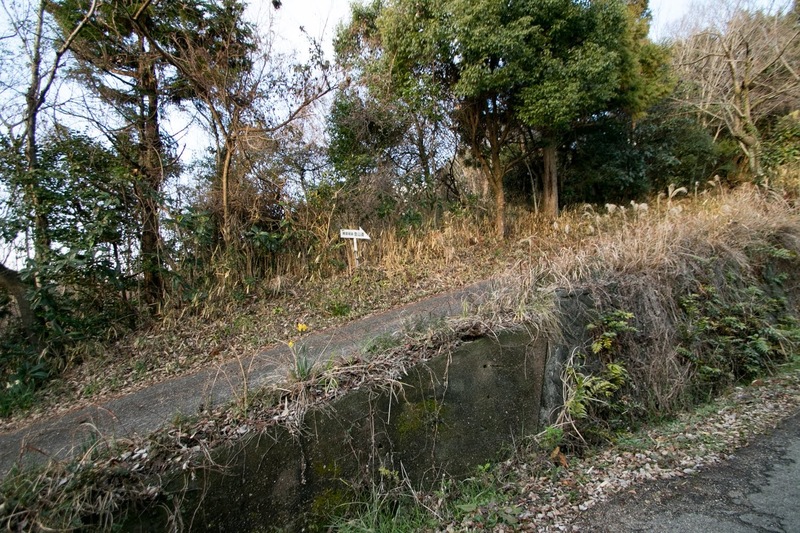 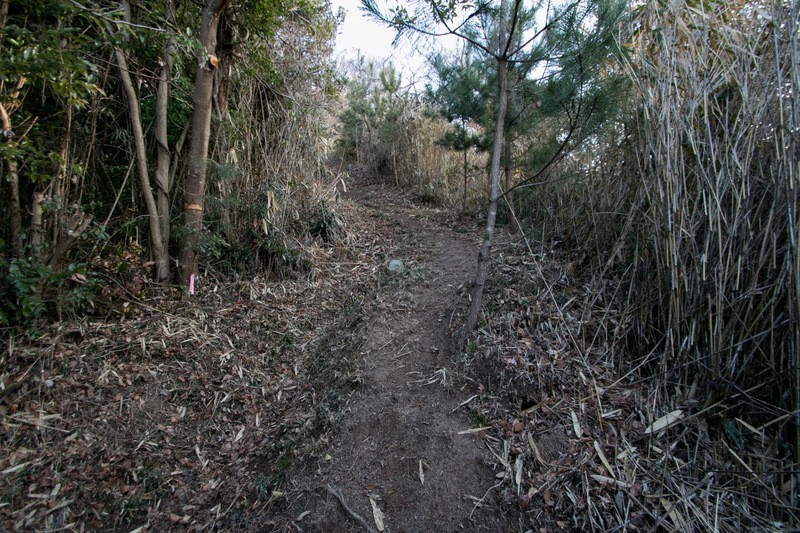 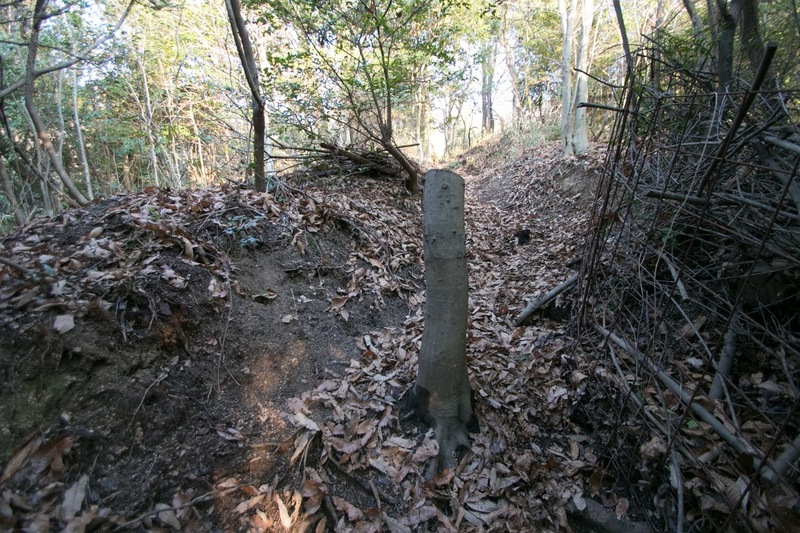 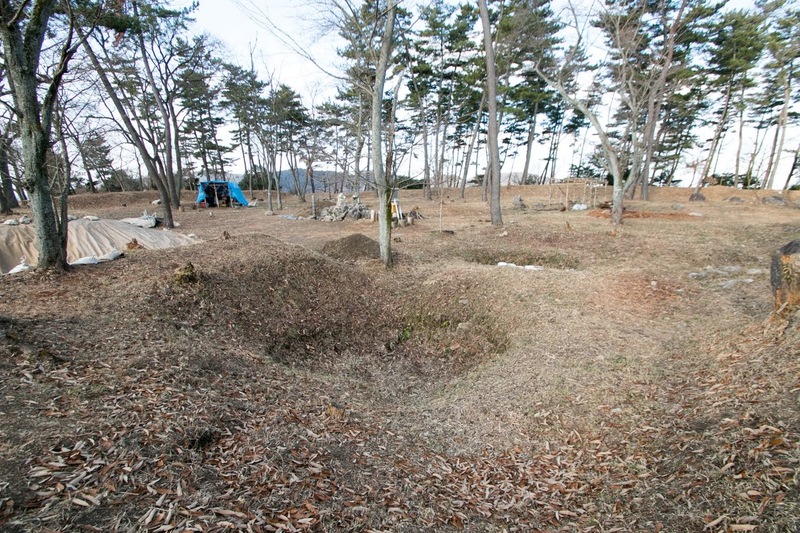 Even though disappeared into the tide of the history, structure of Katsuga castle well shows the glory period of Kozai clan activated as an important retainer of supreme authority. 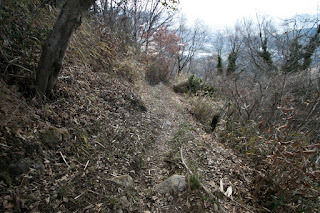 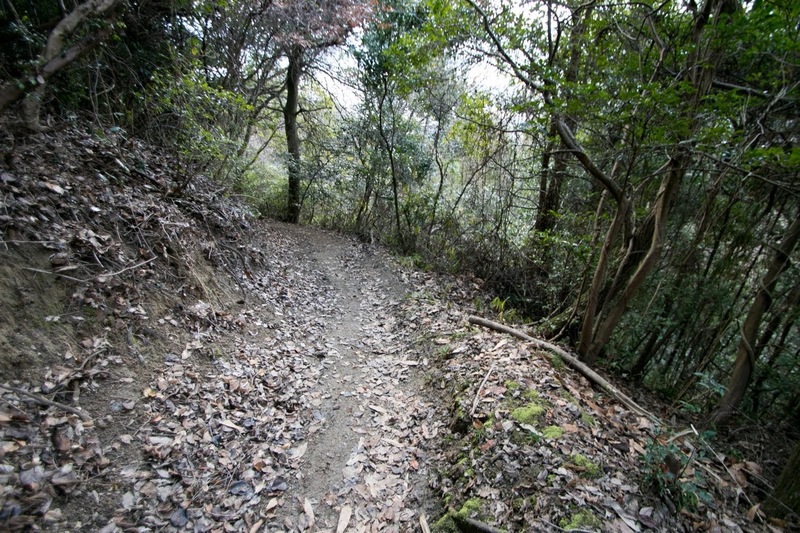 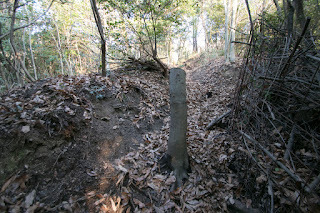 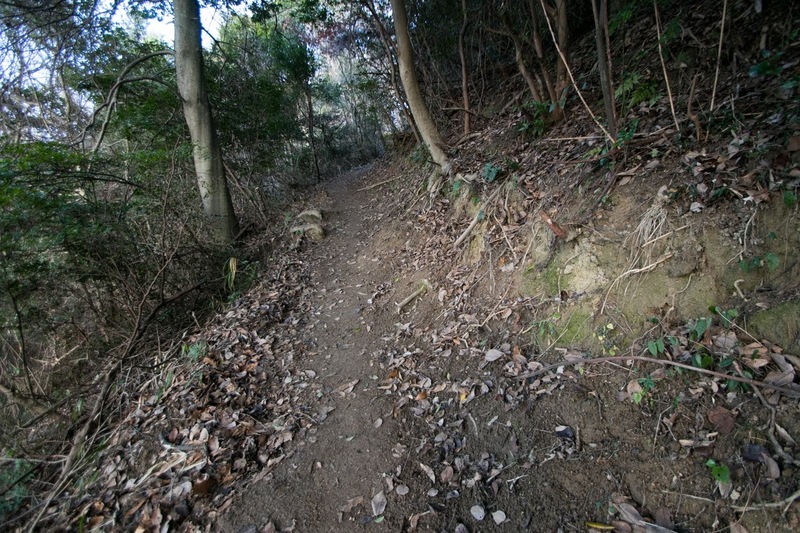 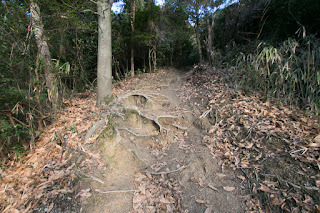 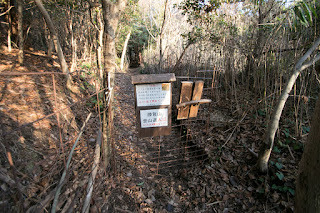 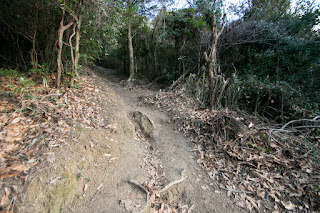 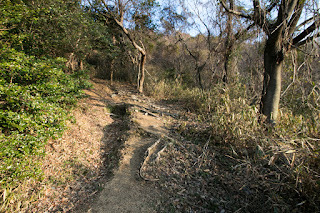 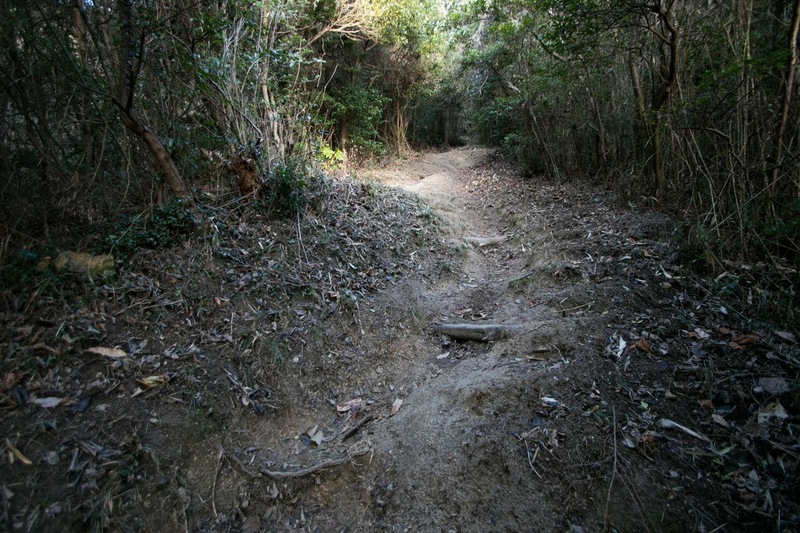 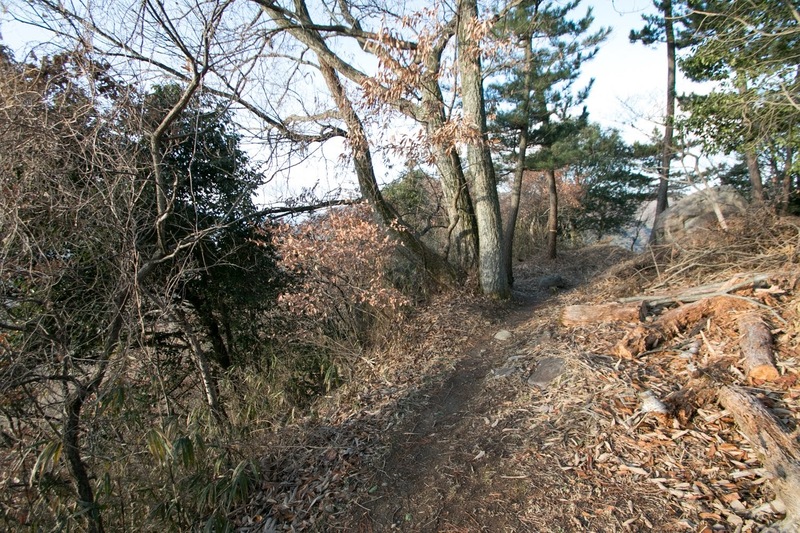 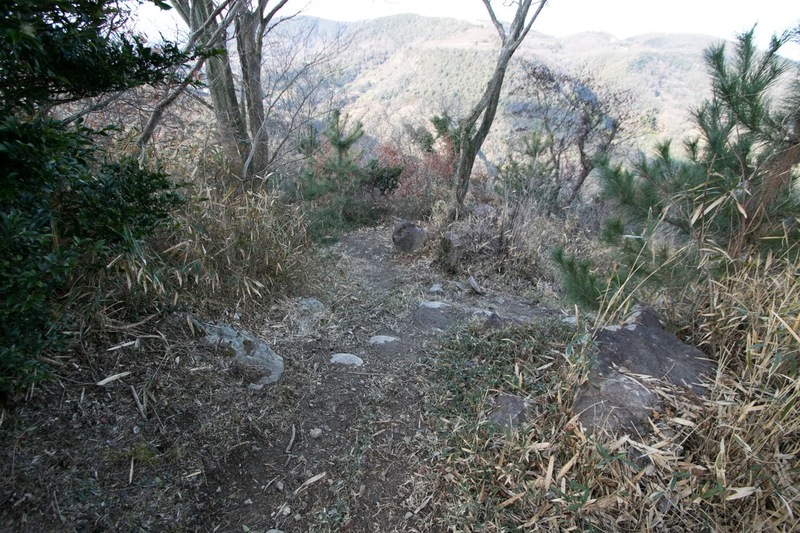 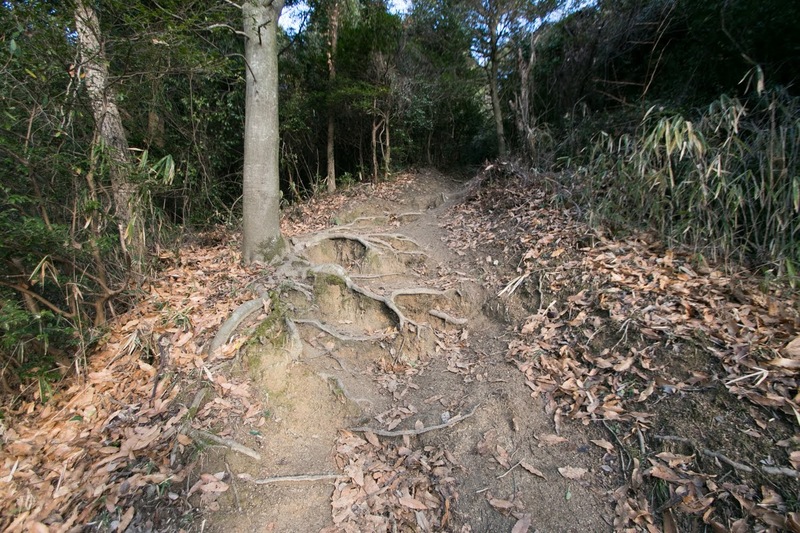 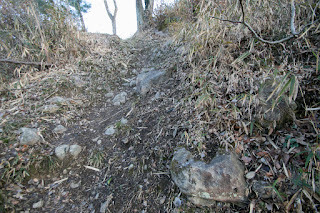 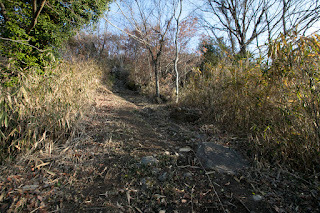 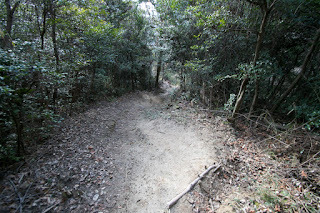 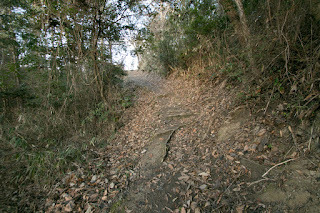 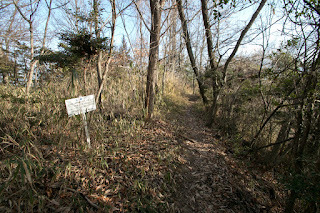 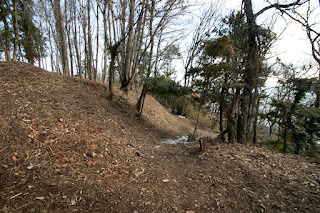 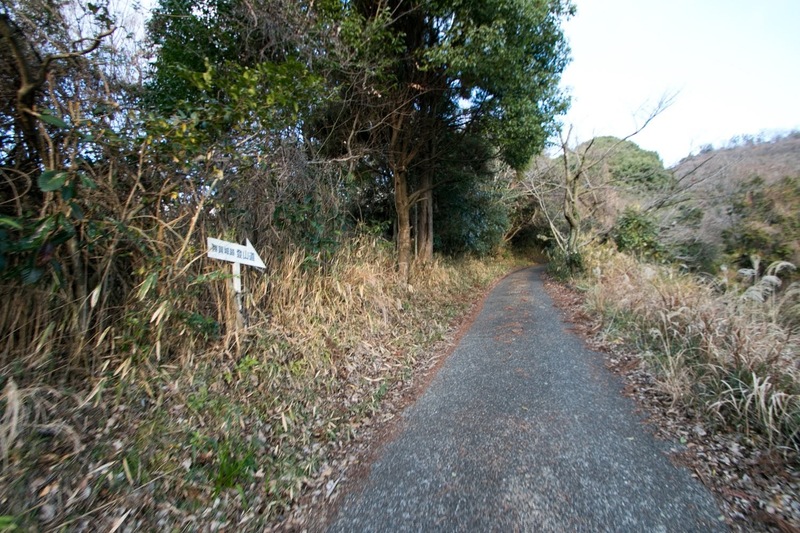 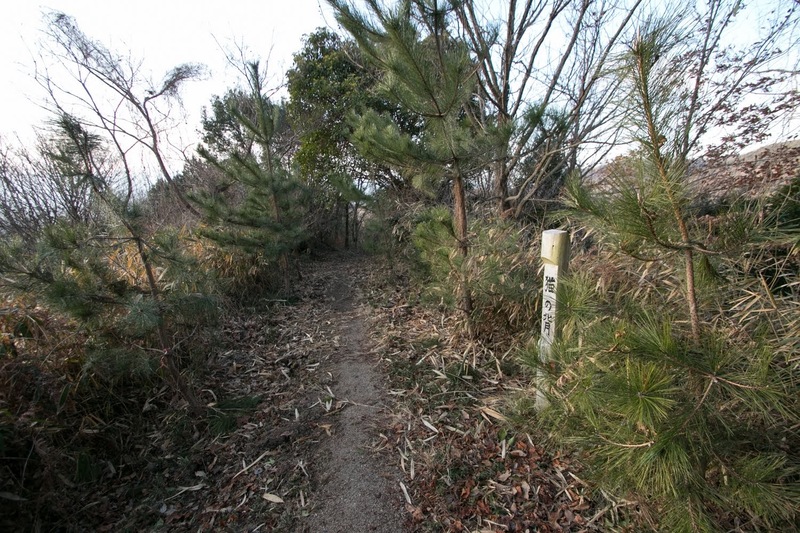 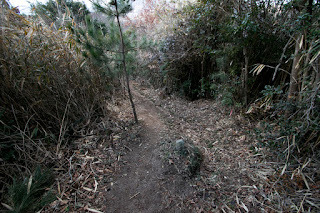 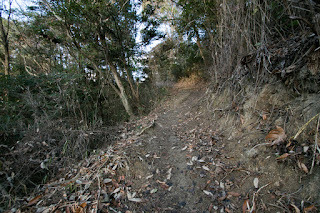 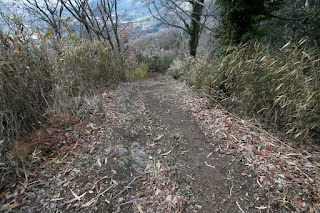 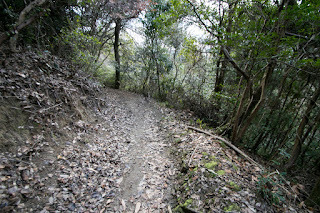 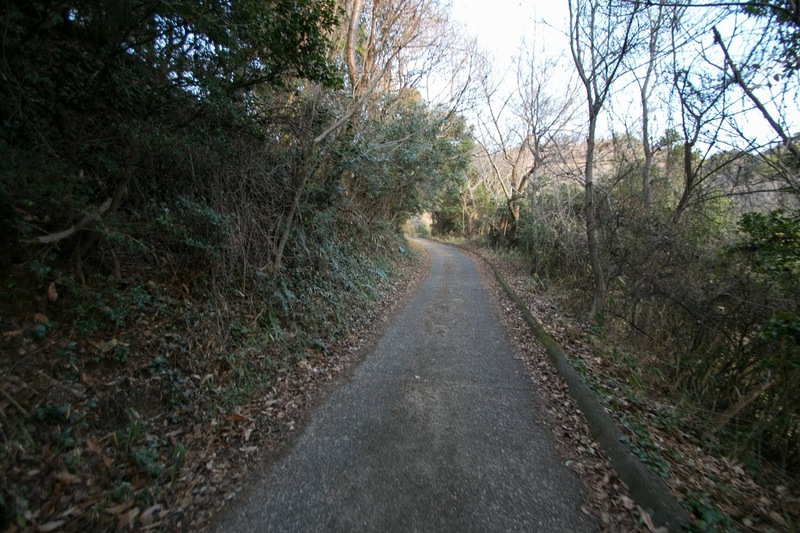 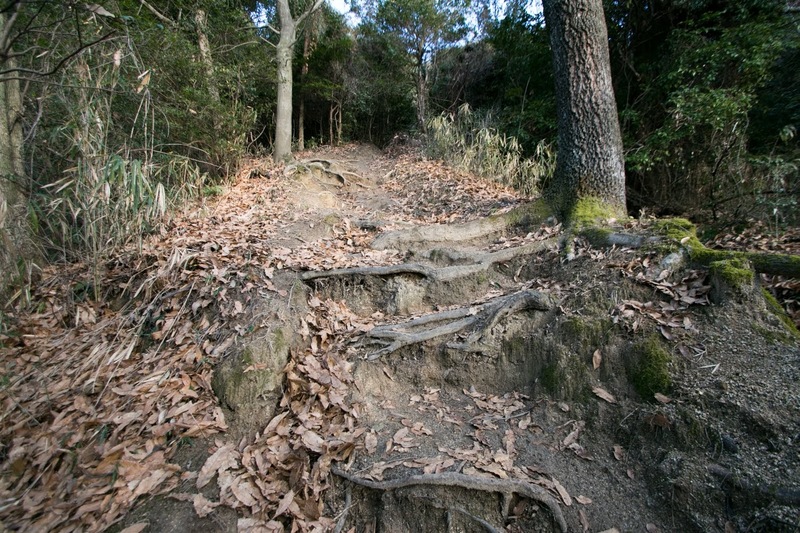 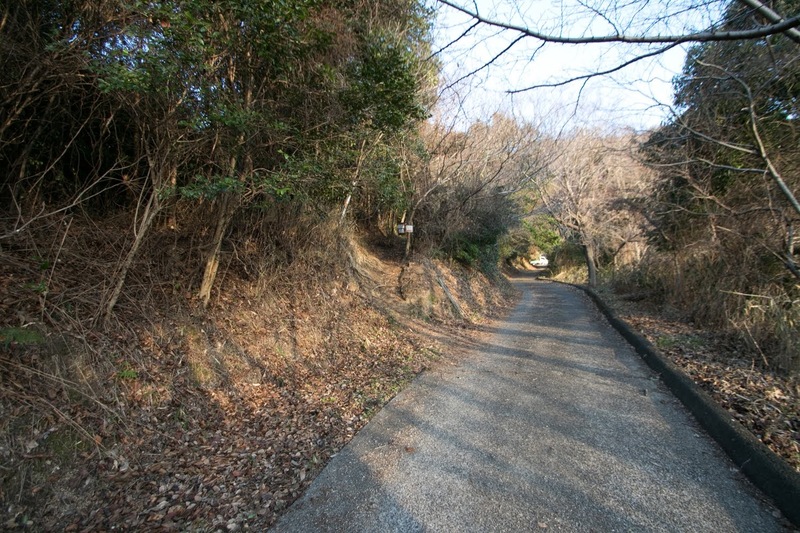 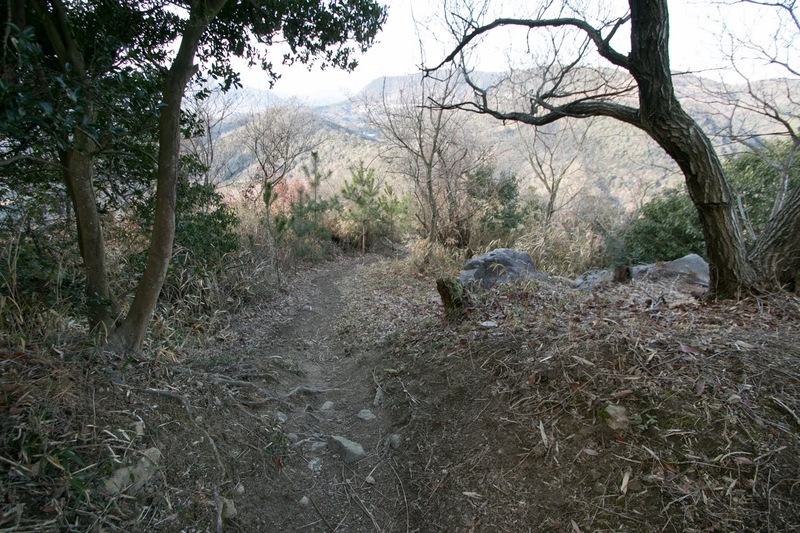 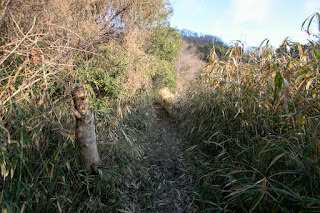 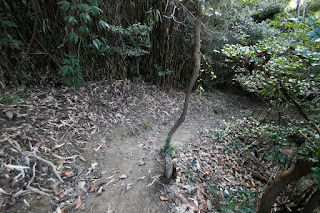 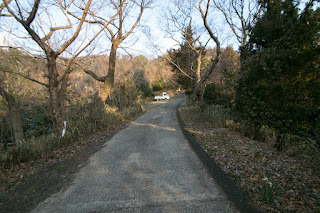 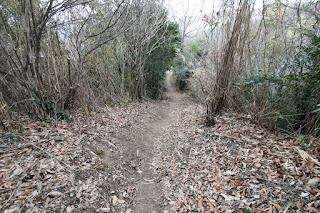 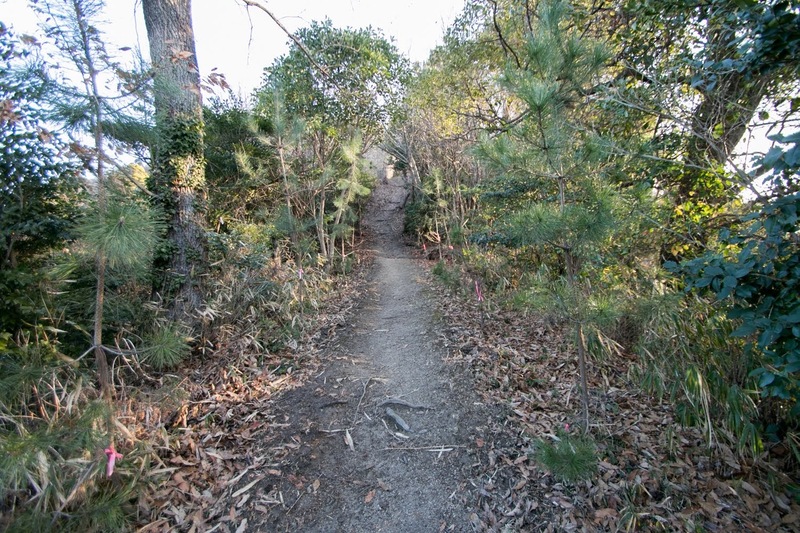 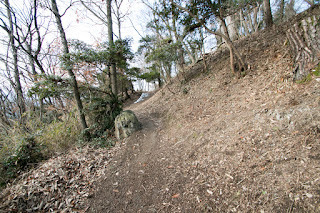 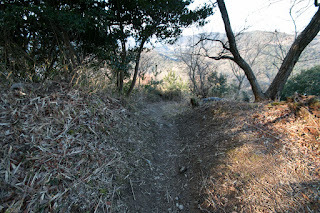 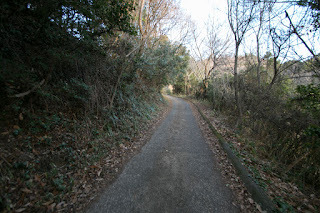 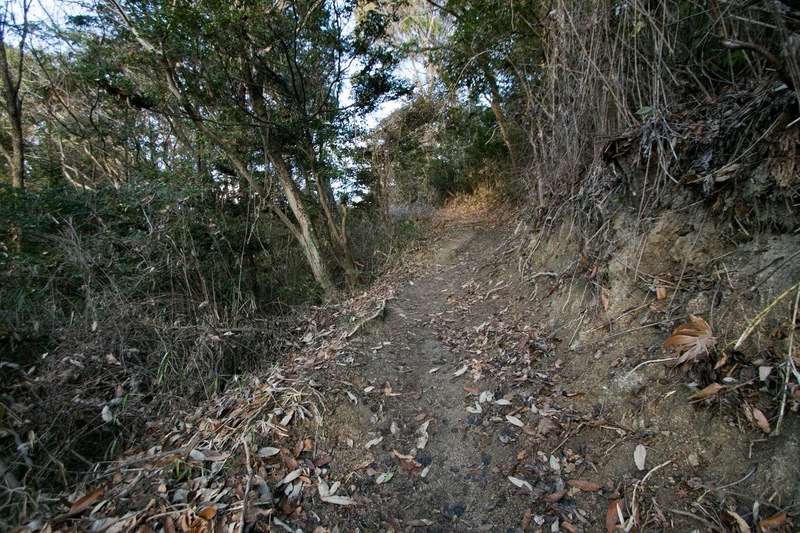 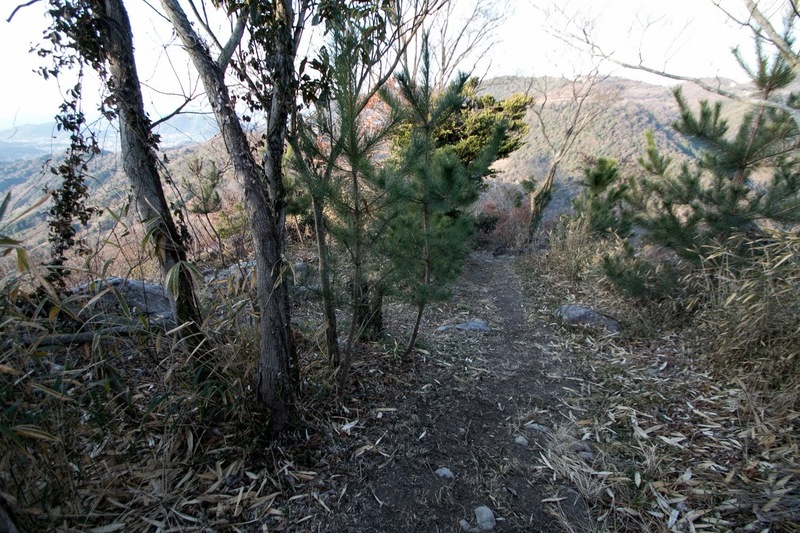 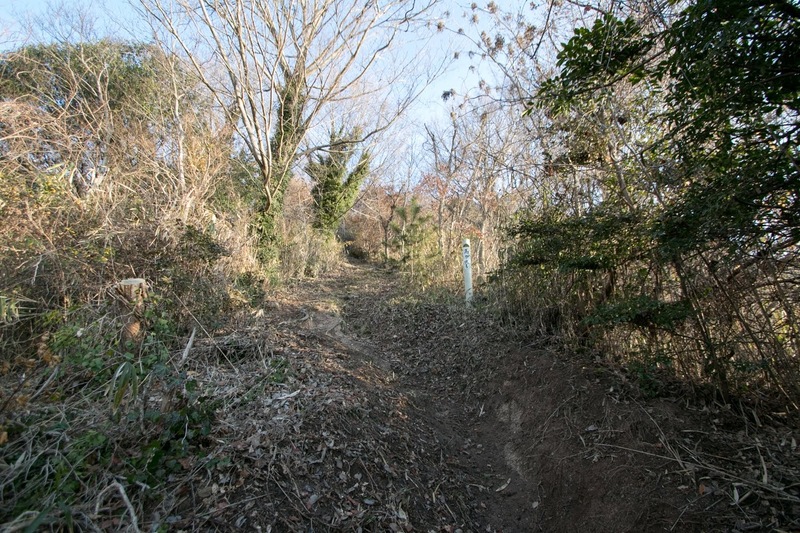 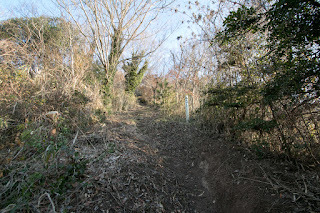 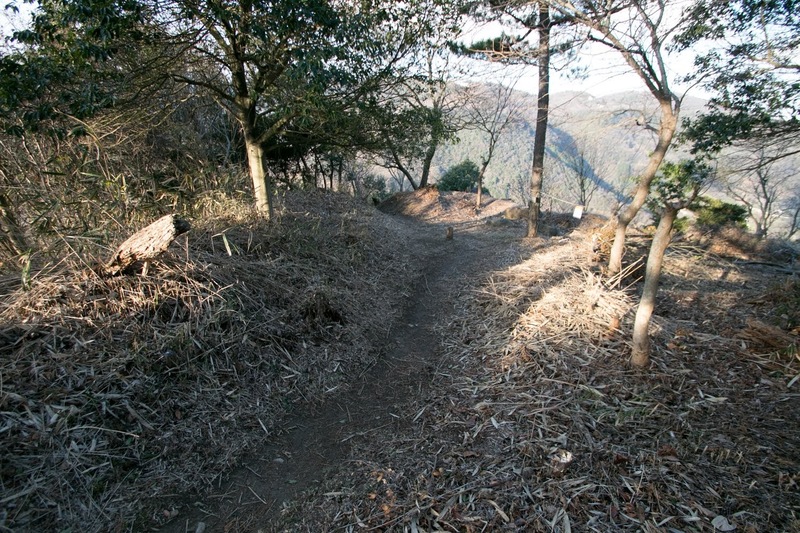 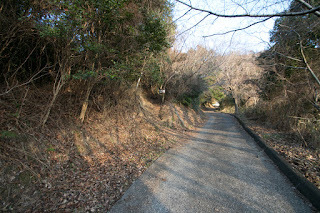 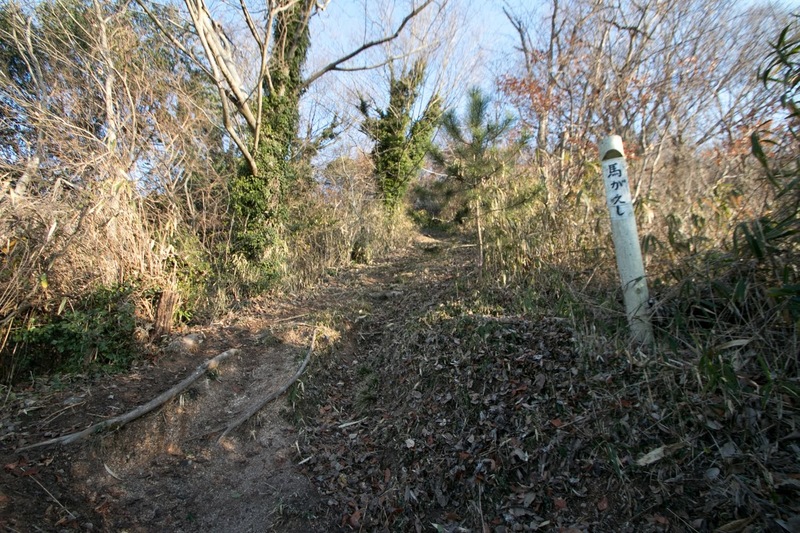 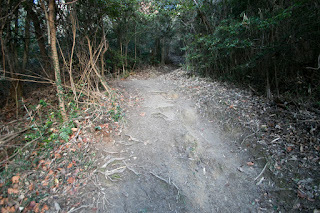 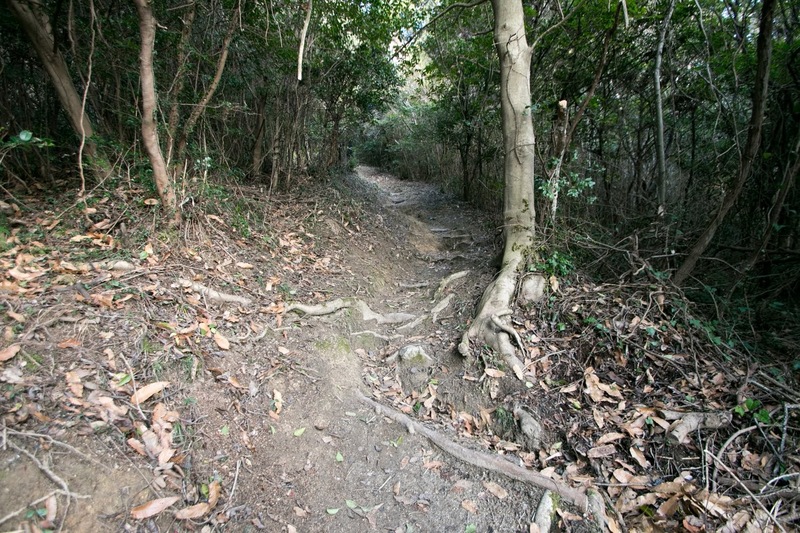 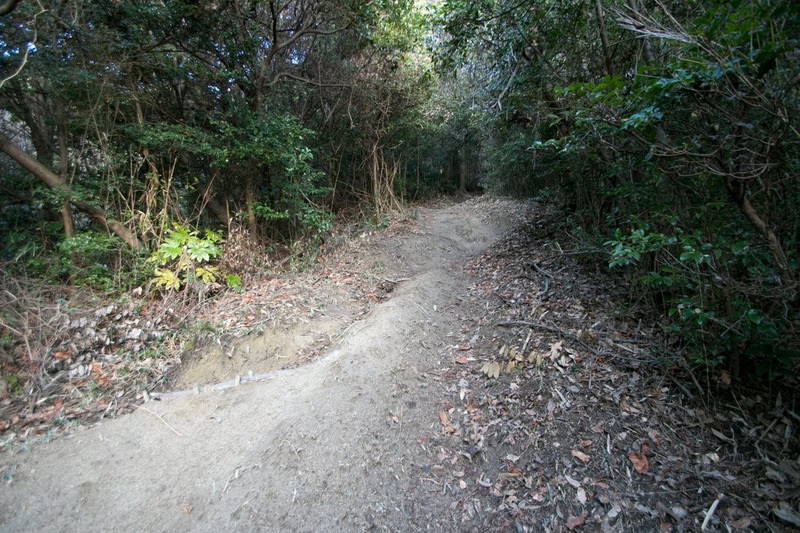 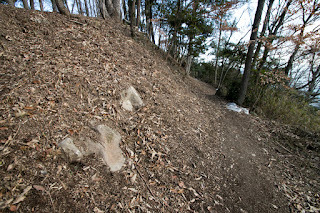 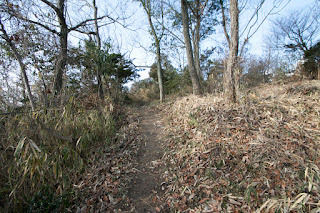 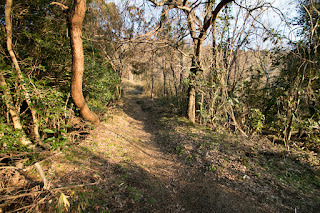 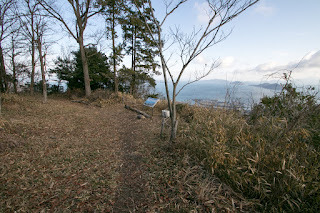 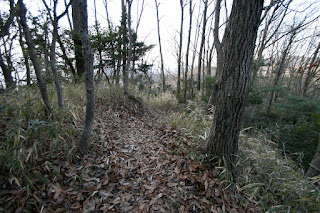 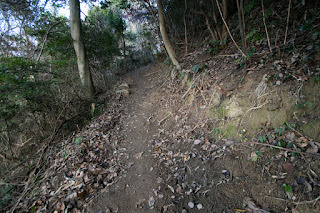 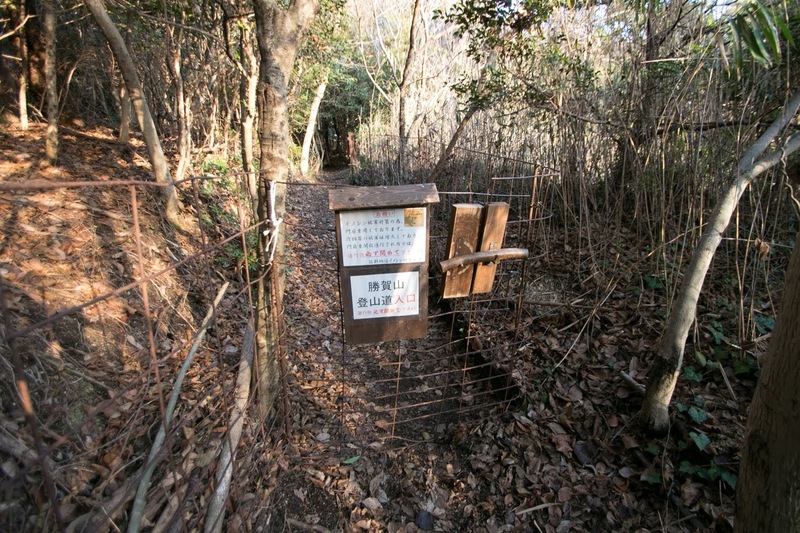 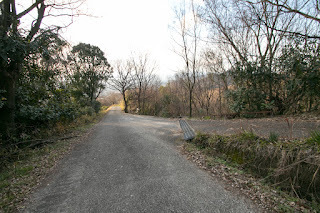 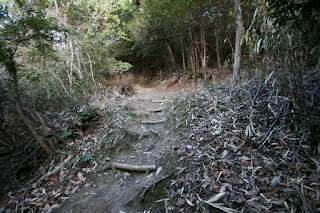 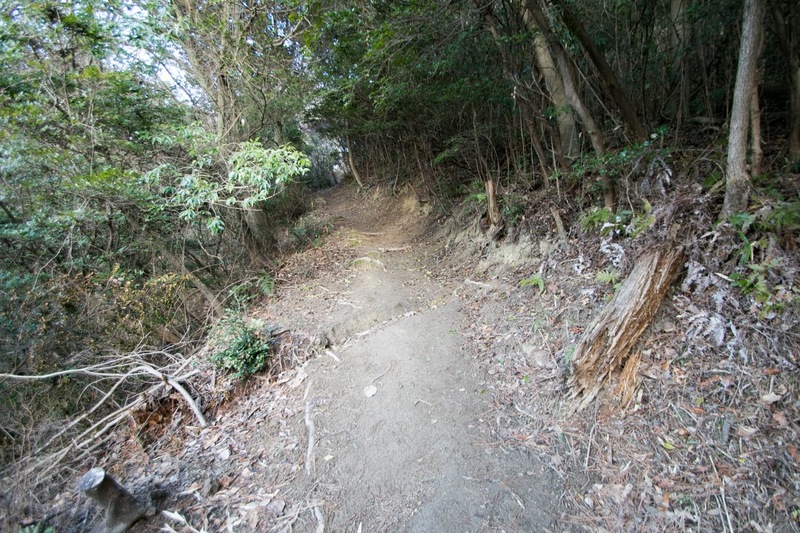 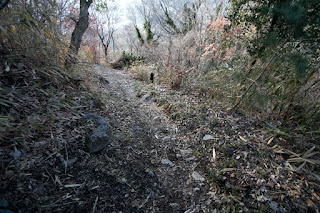 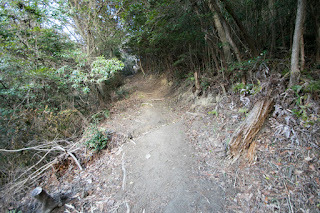 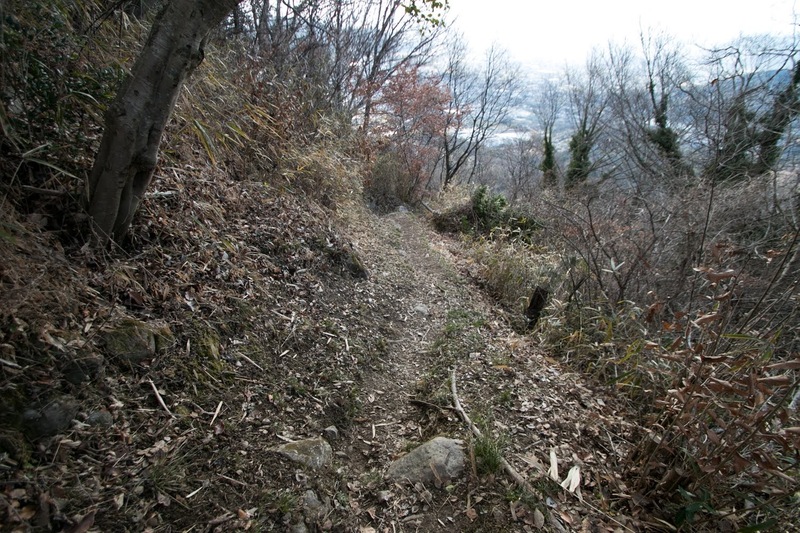 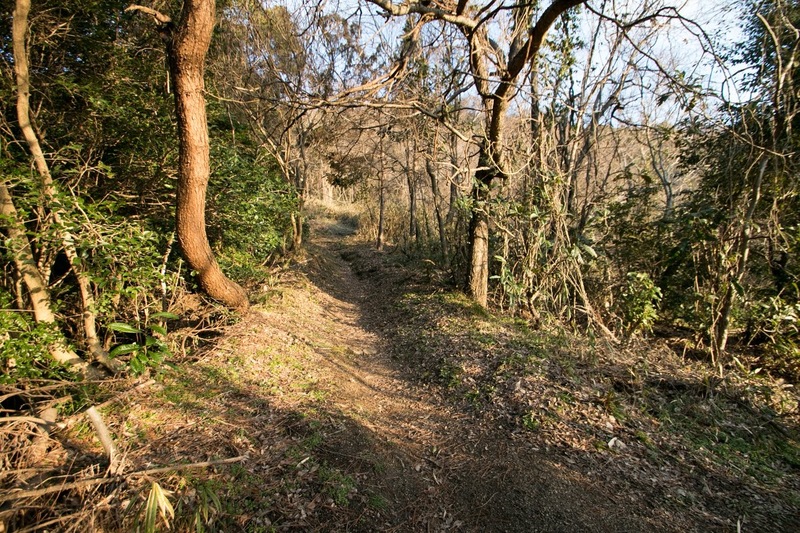 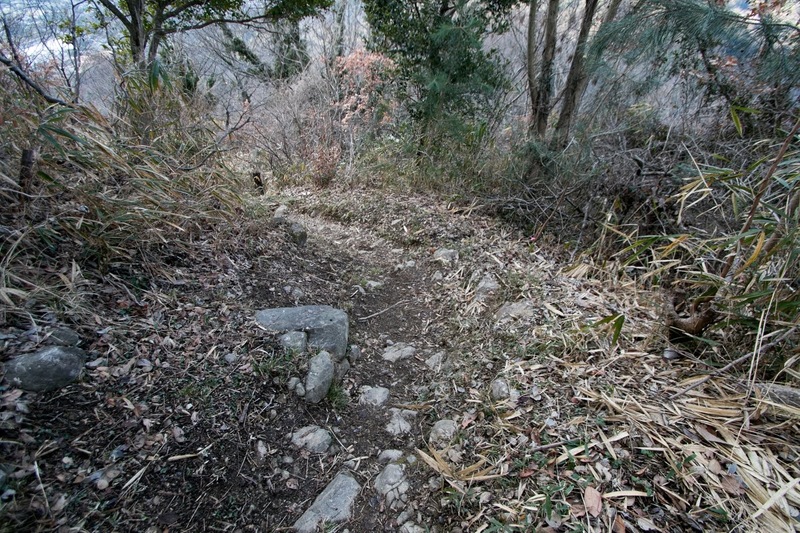 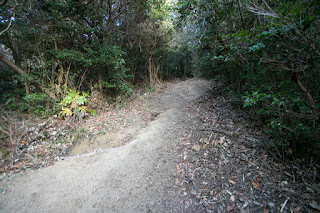 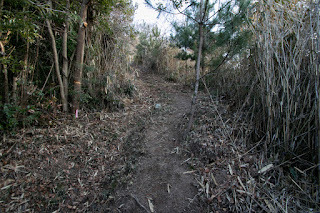 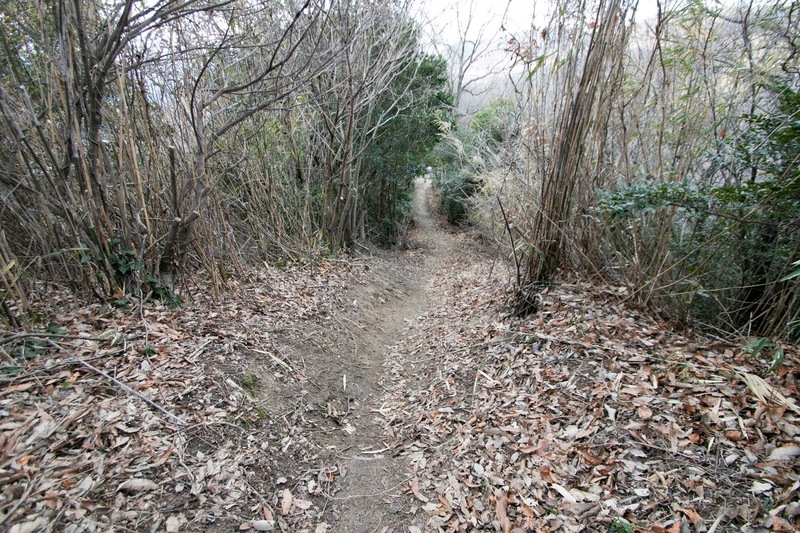 30 minutes walk from JR Shikoku Yosan-sen line Kinashi station to entrance of climbing road at the halfway of mountain. 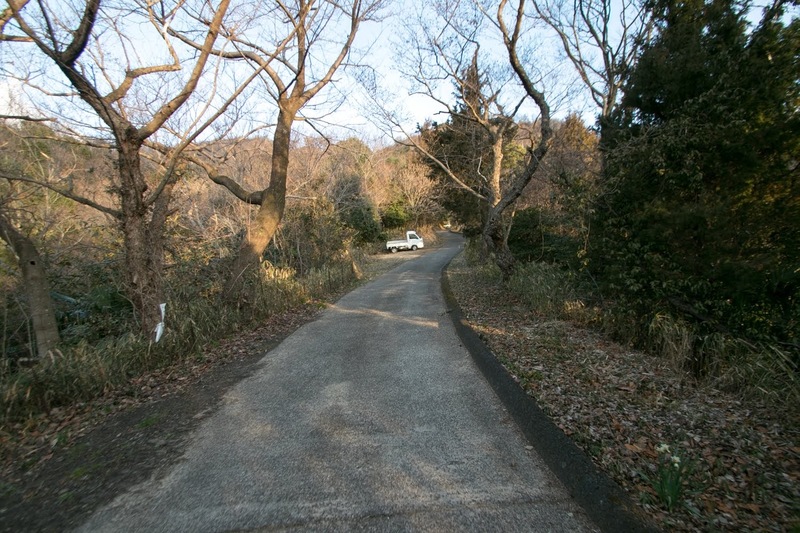 20 minutes drive from Takamatsu Jidoshado Expressway Takamatsu-Nishi interchange to small parking space near entrance of climbing road. 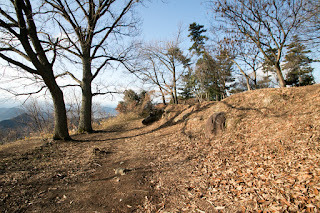 Another 30 minutes walk to hillside castle.